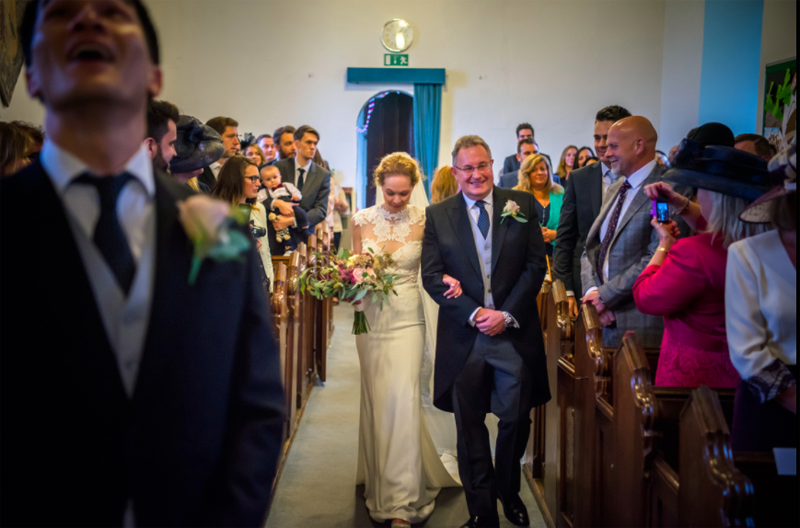 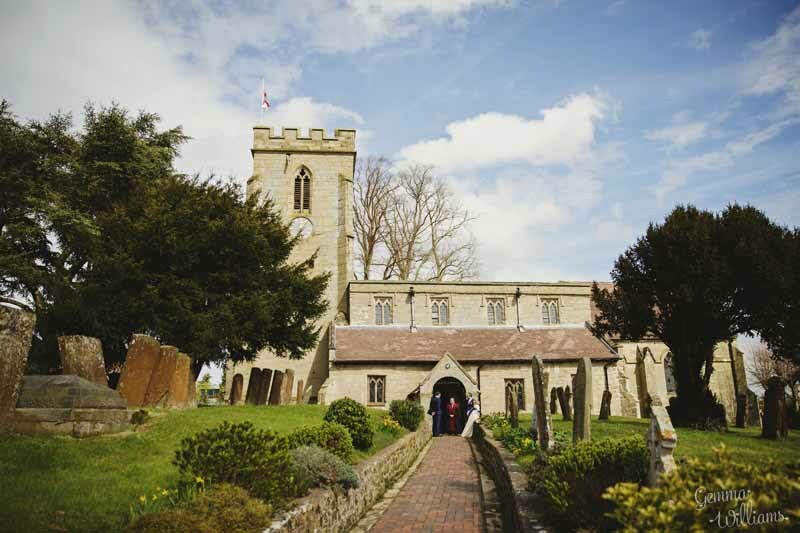 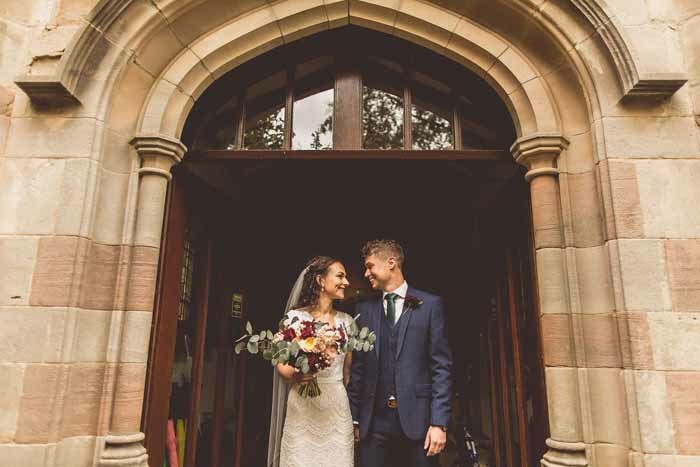 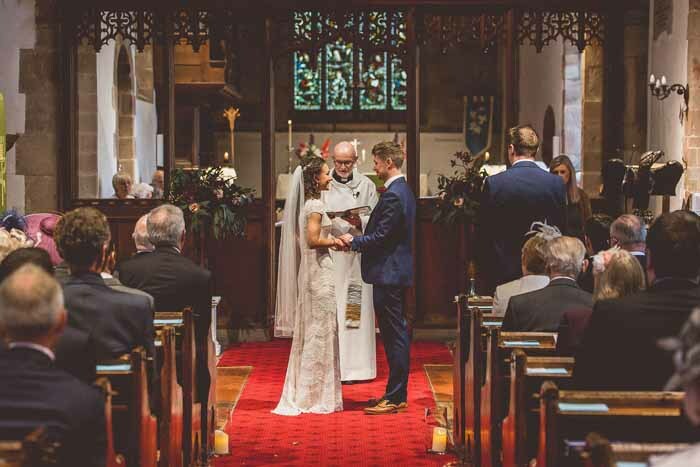 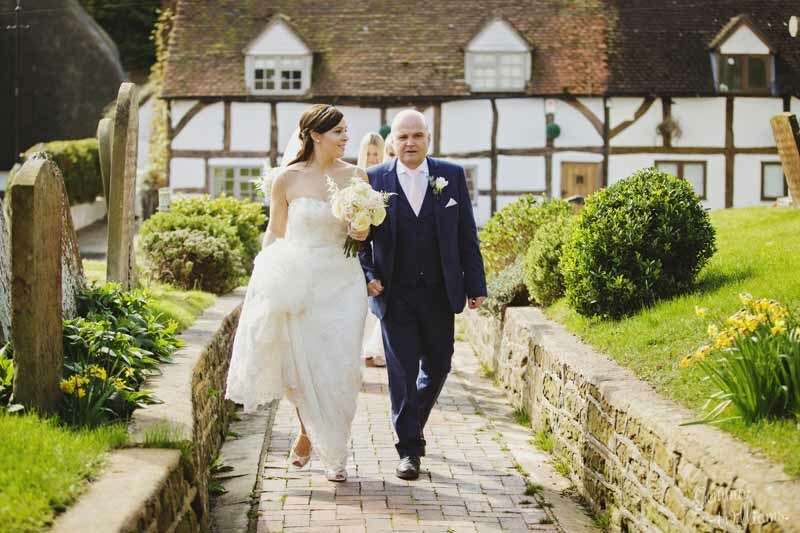 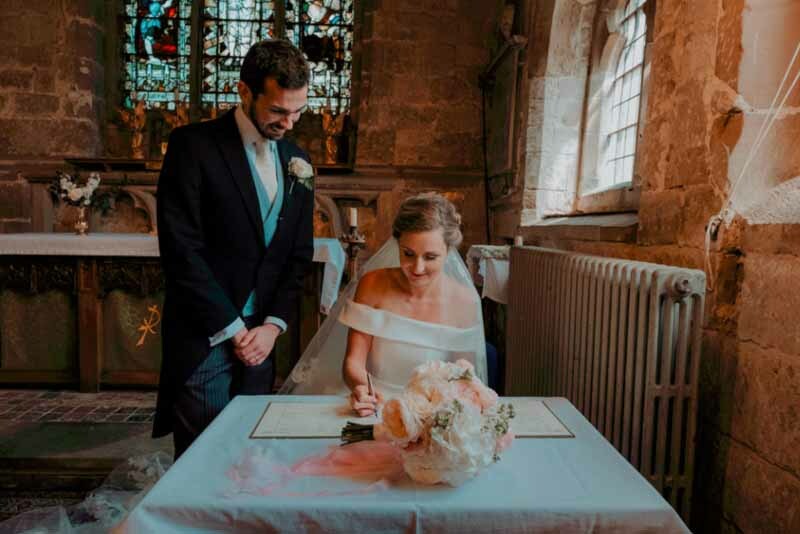 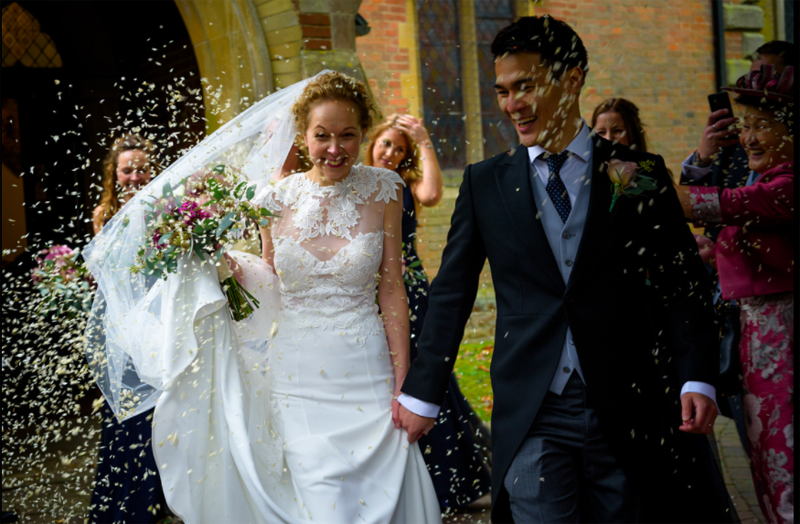 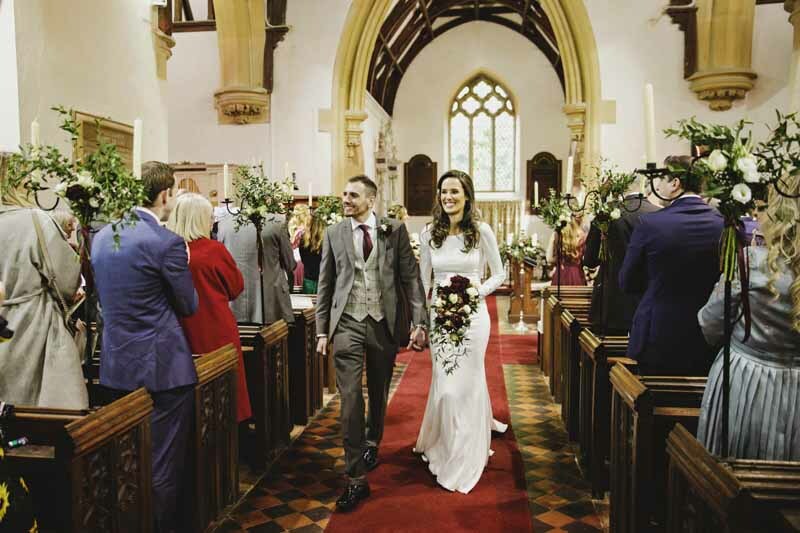 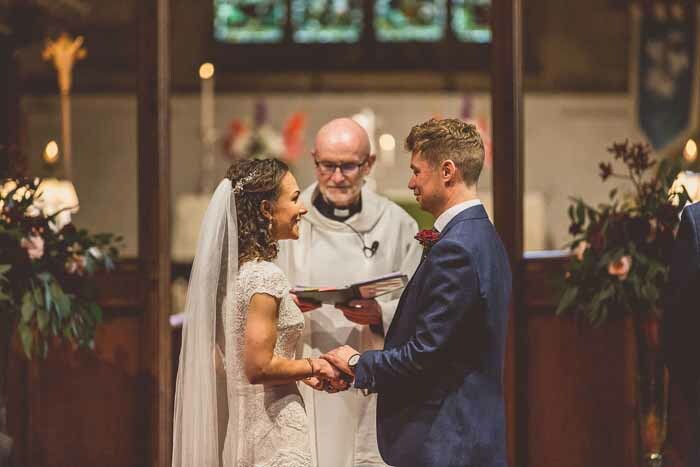 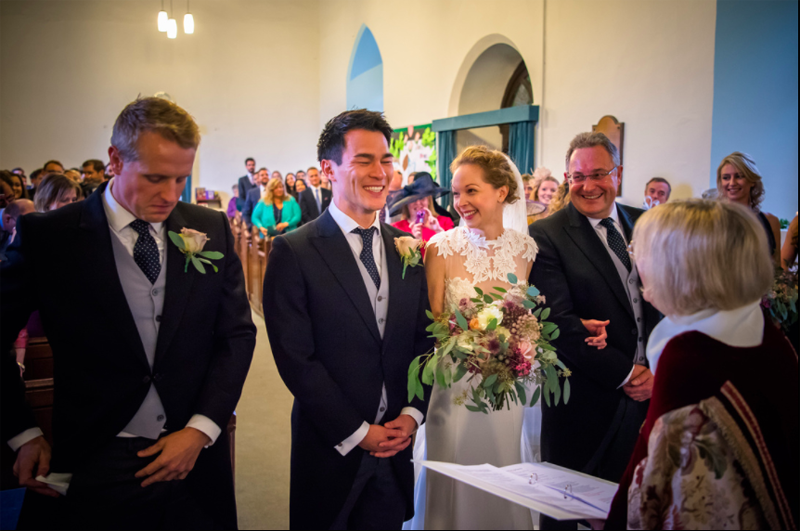 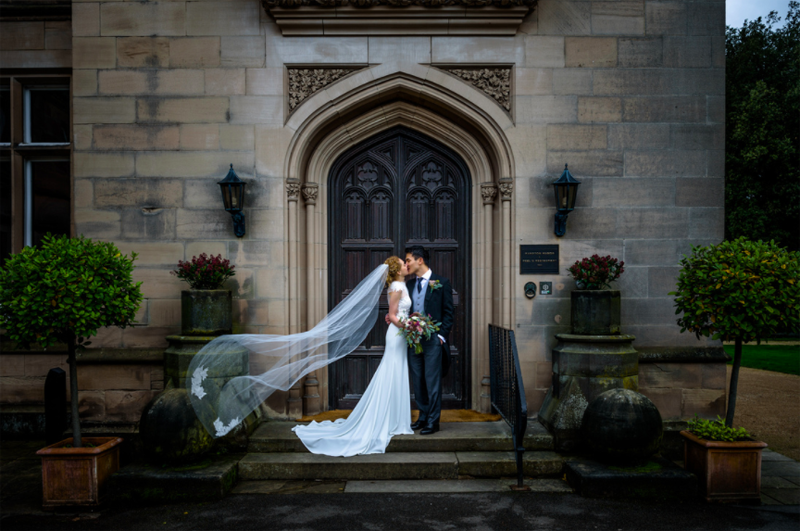 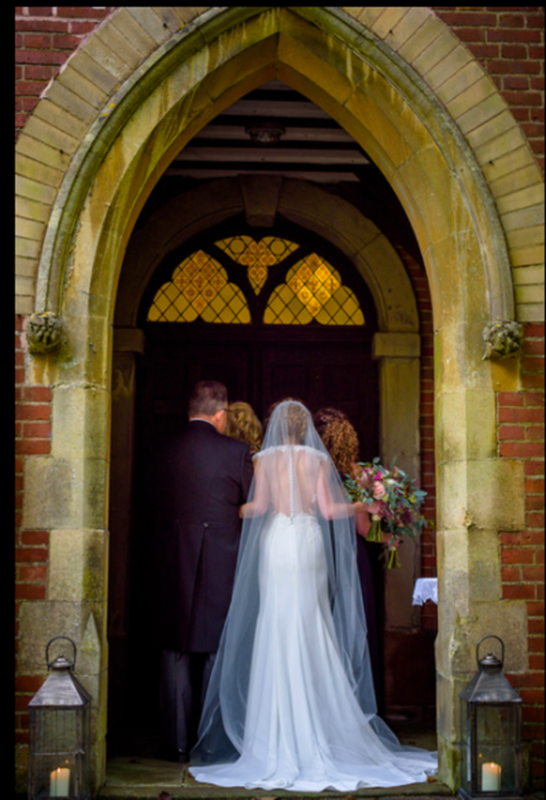 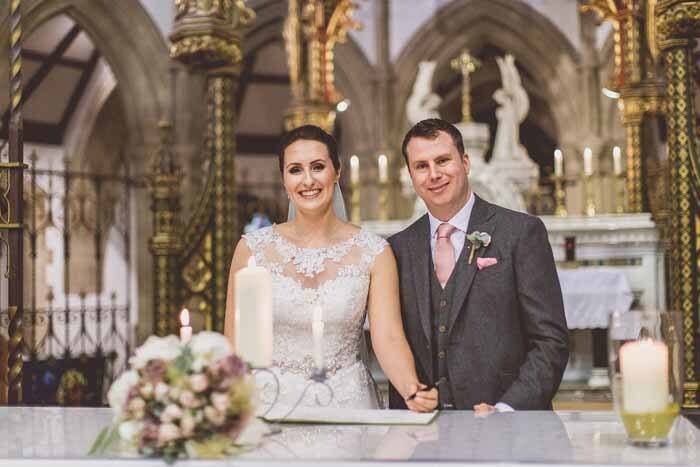 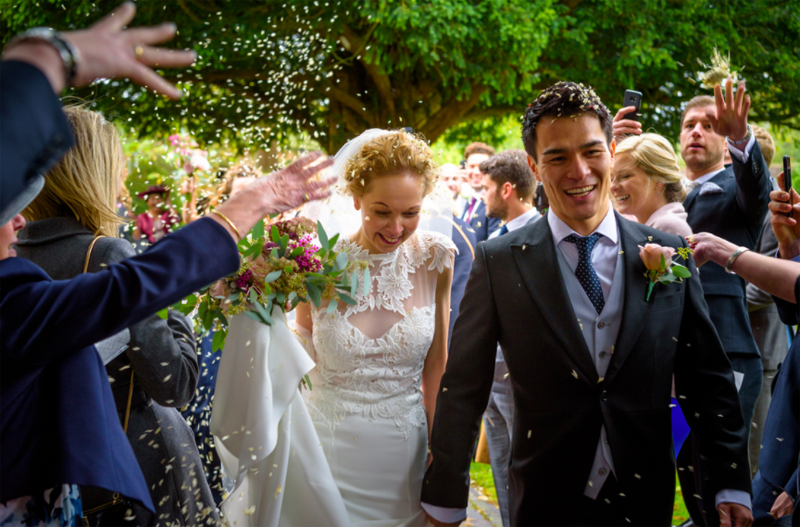 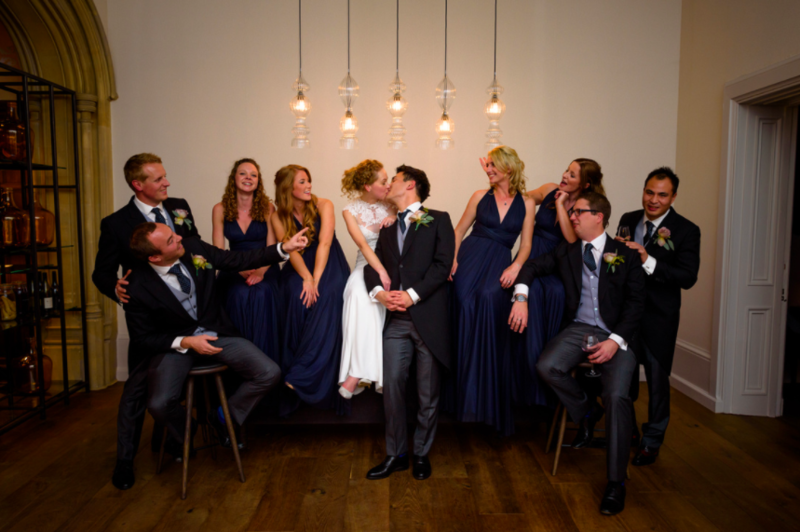 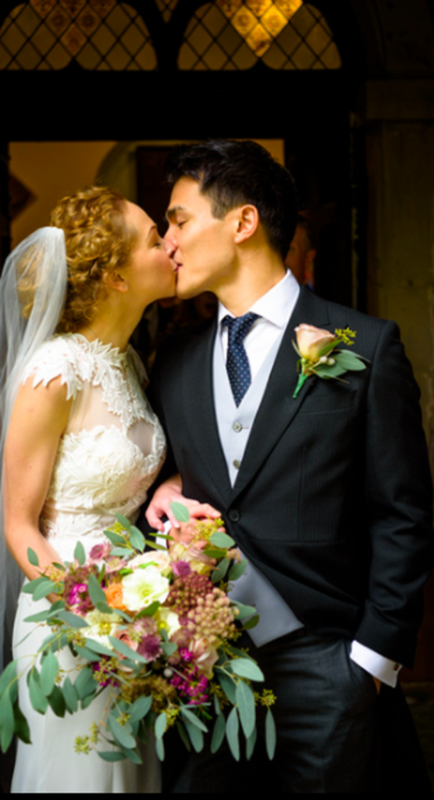 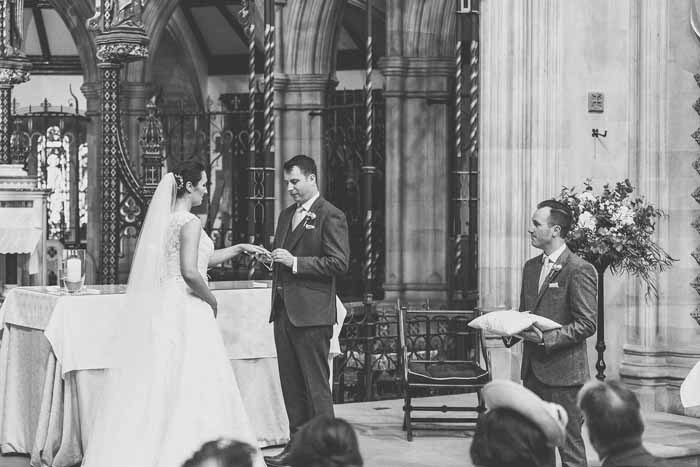 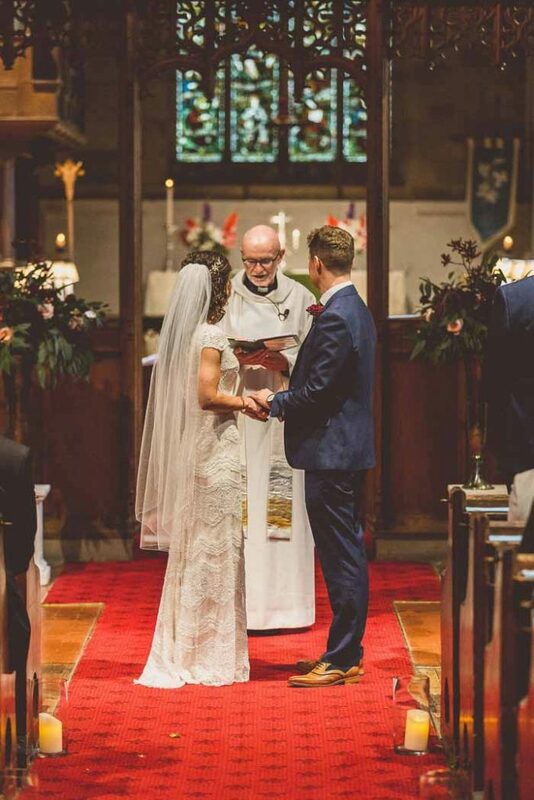 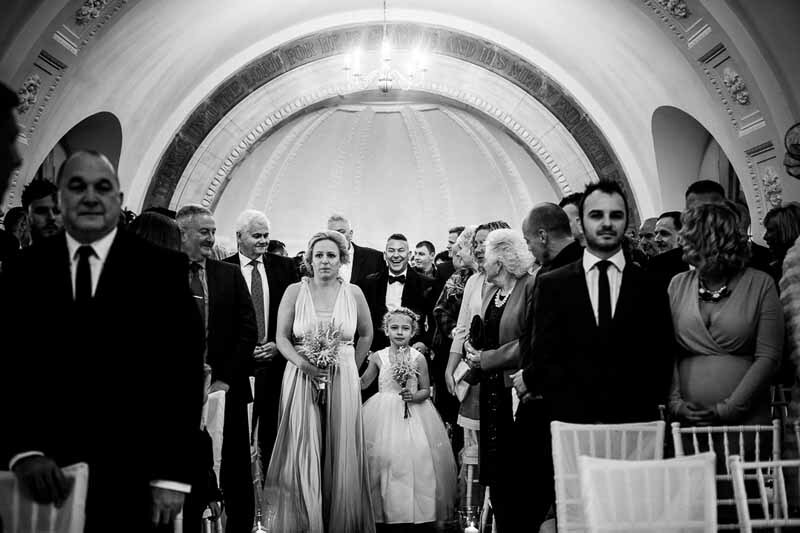 Imogen and Andrew married in the village church close to her family home. 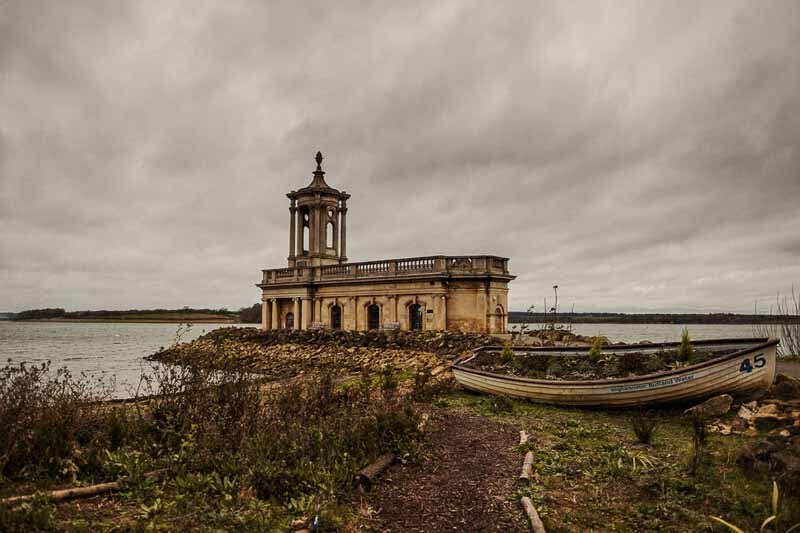 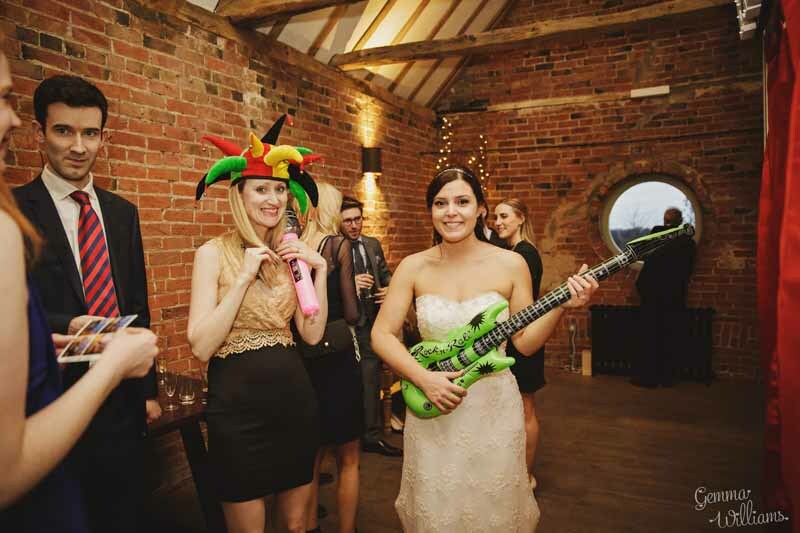 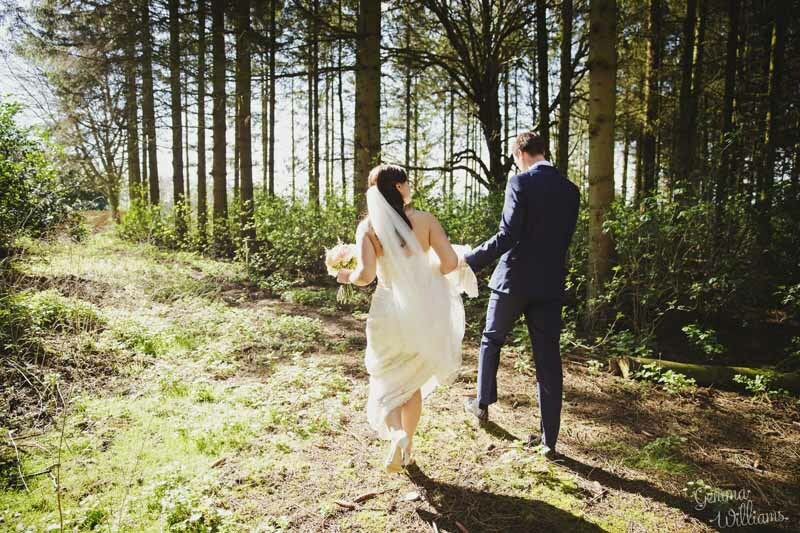 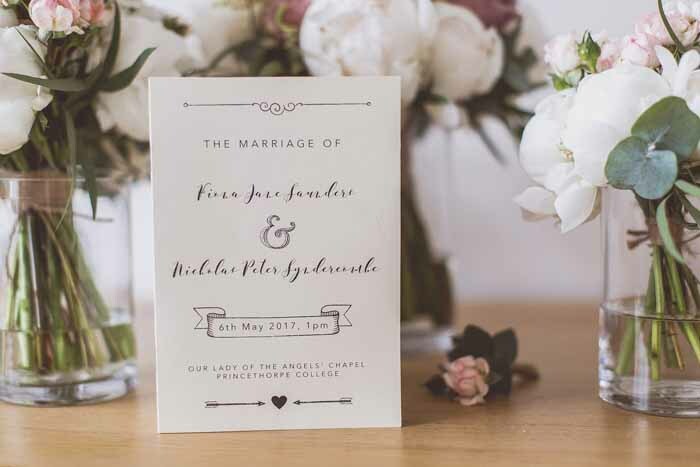 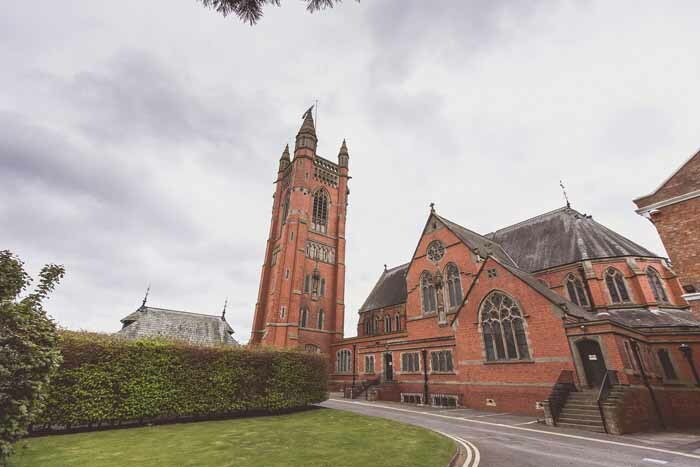 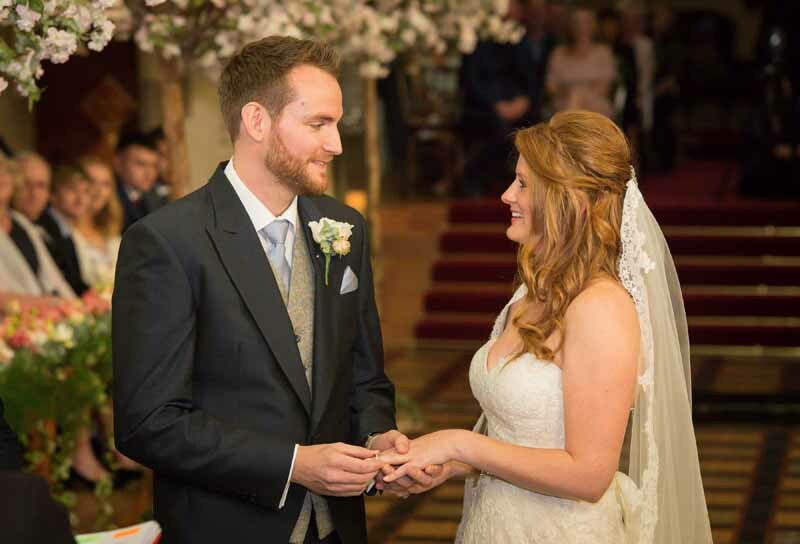 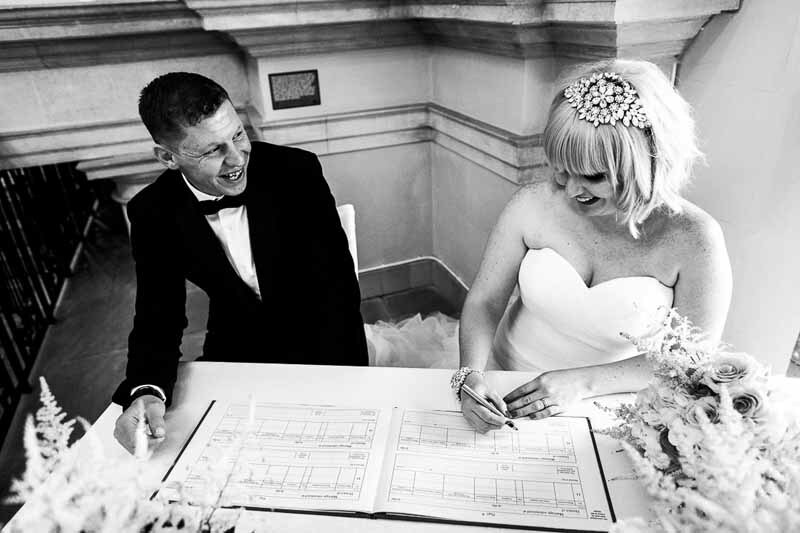 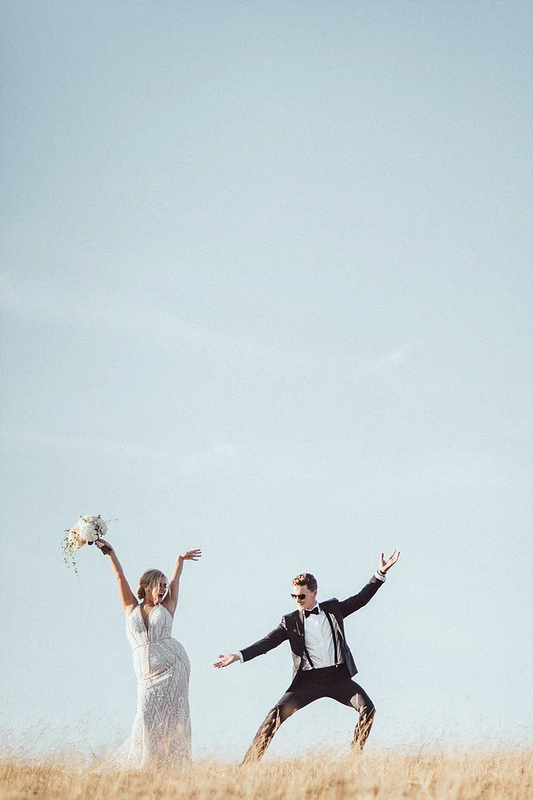 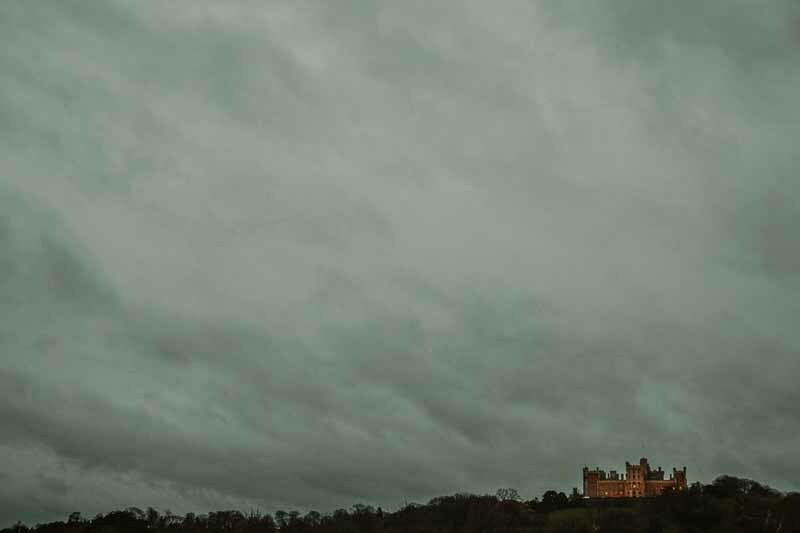 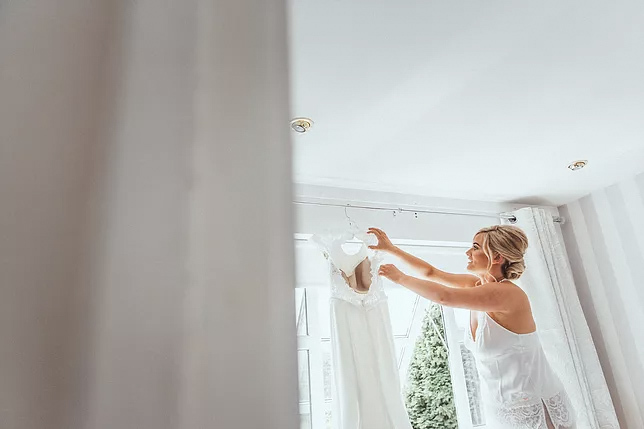 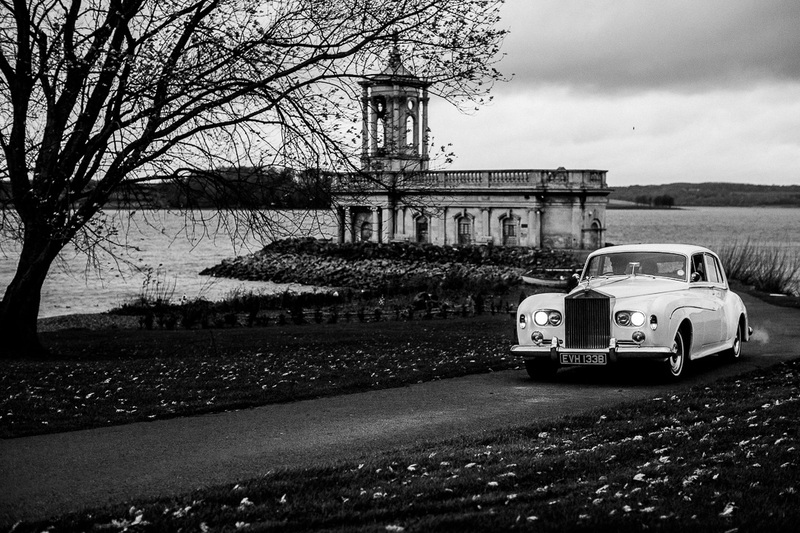 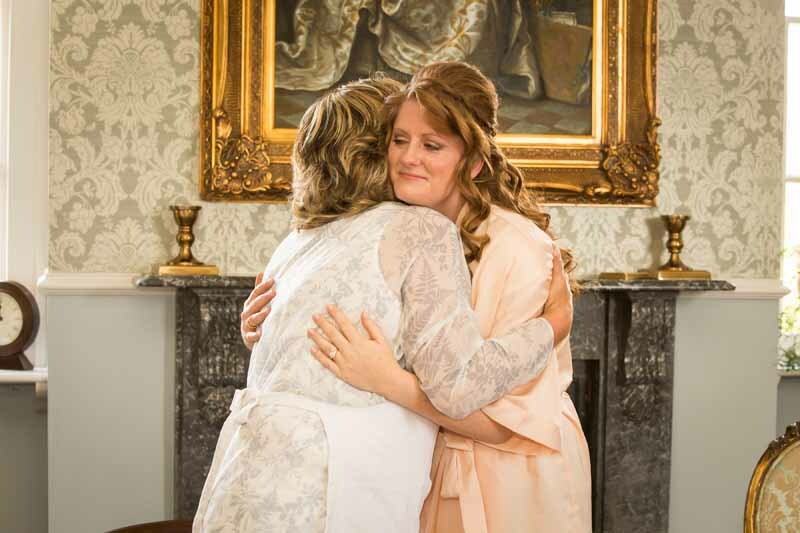 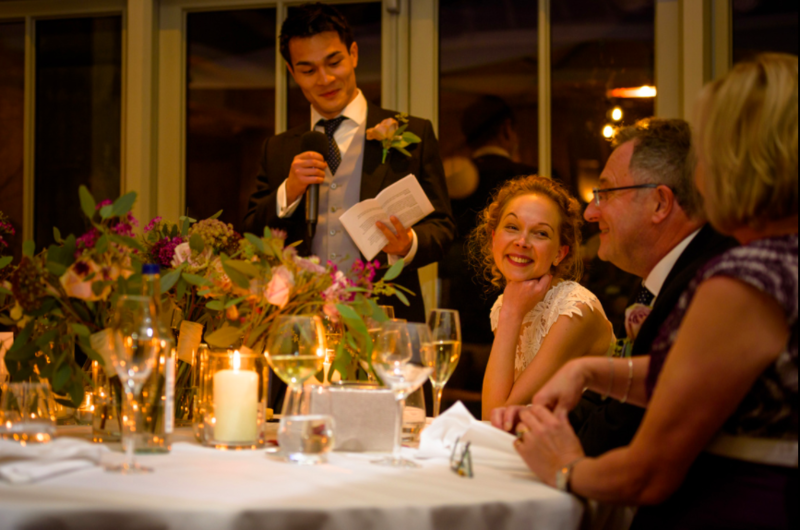 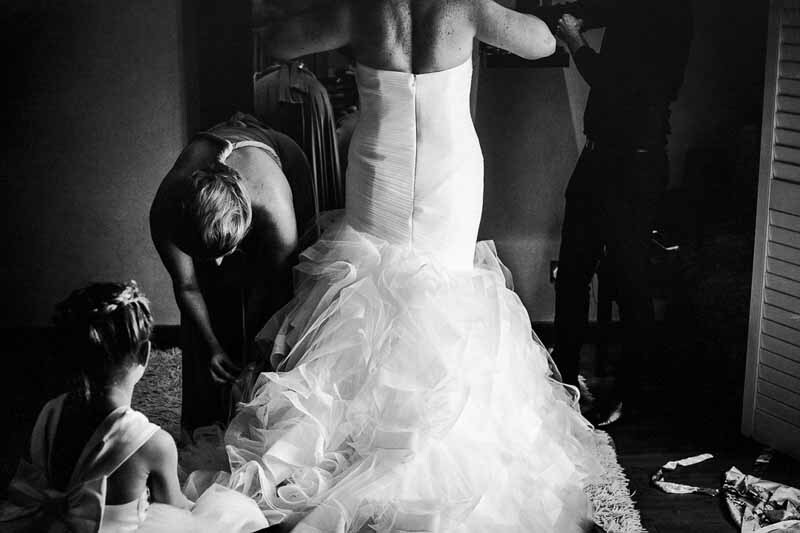 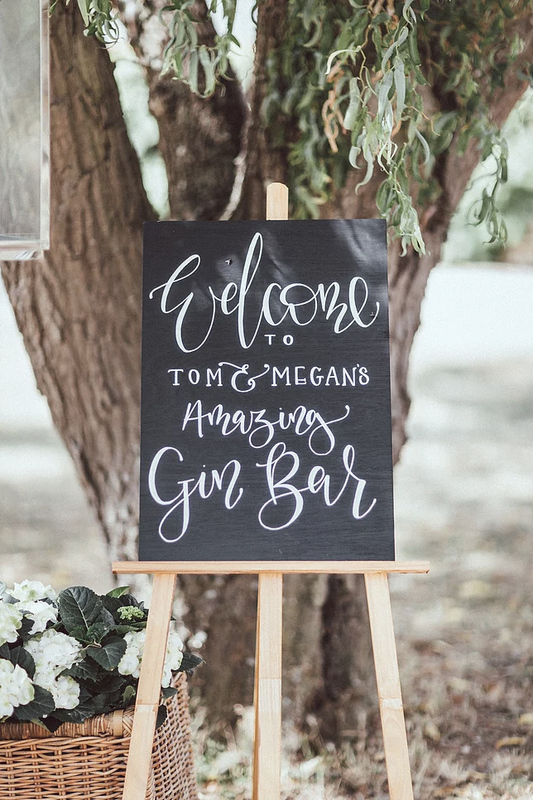 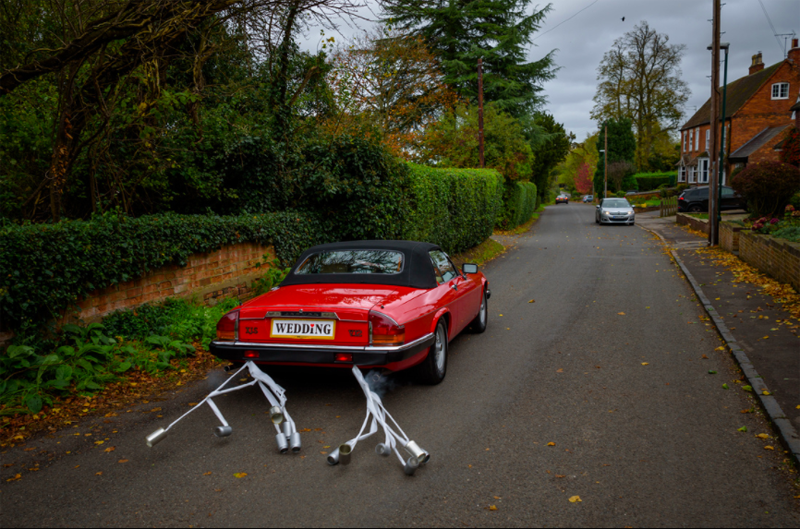 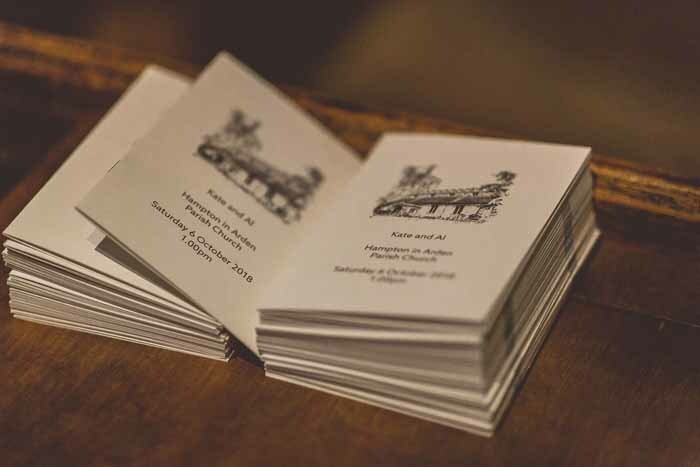 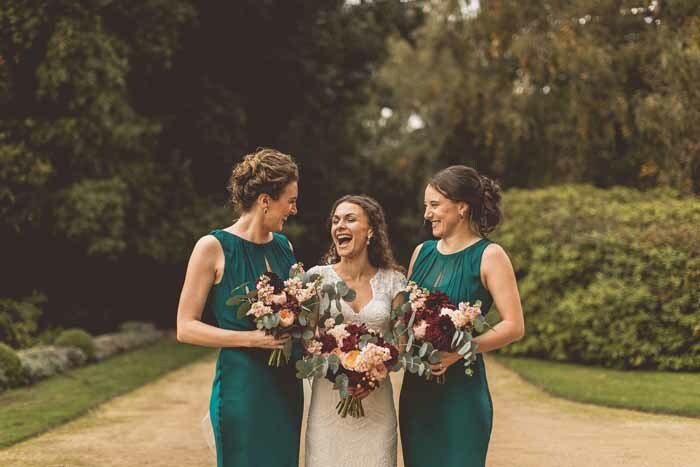 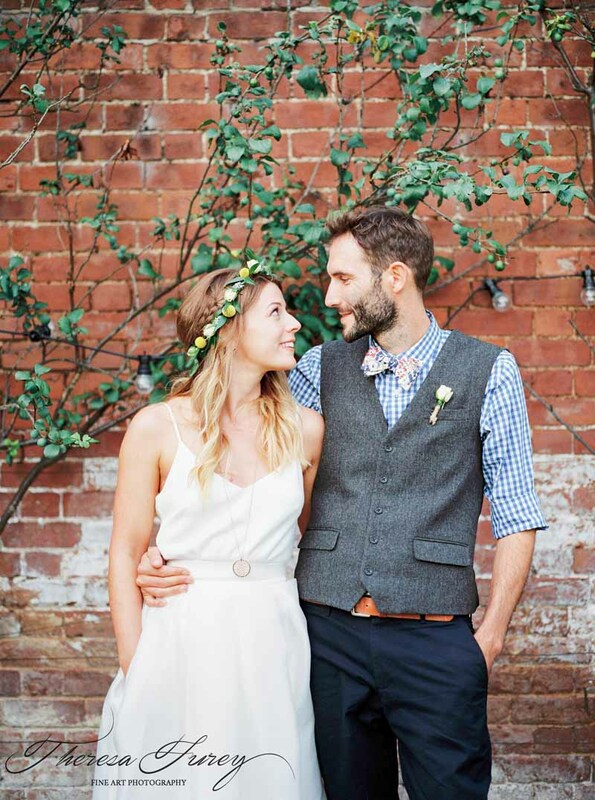 We met in the early stages of her wedding planning and enjoyed helping Imogen with plans for her day. 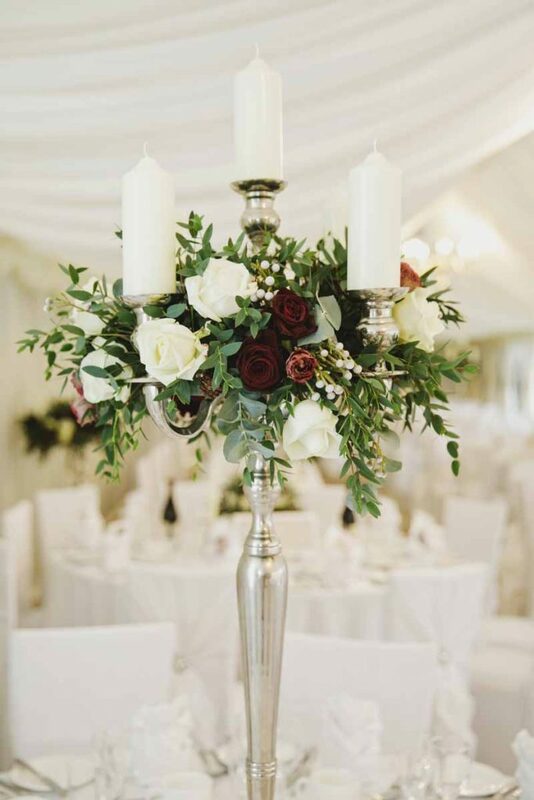 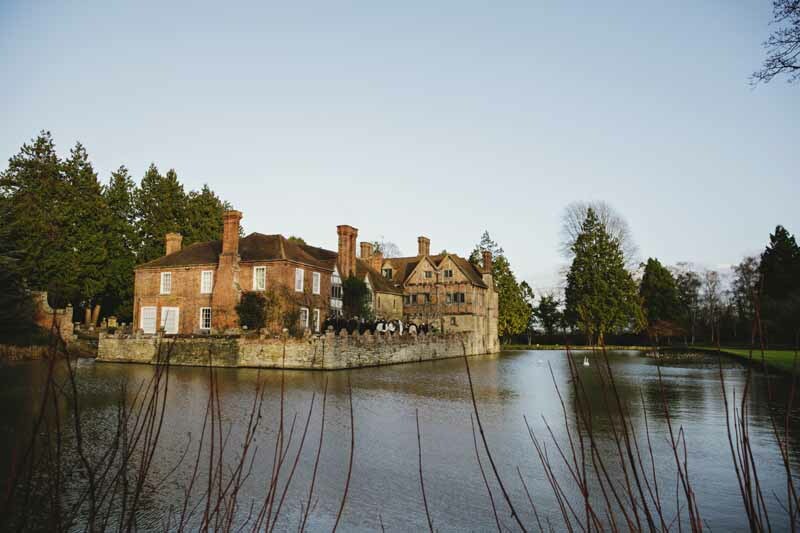 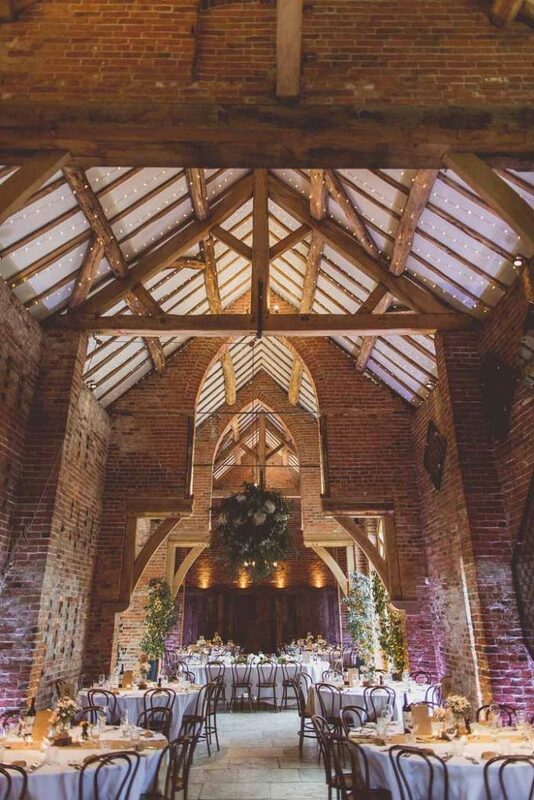 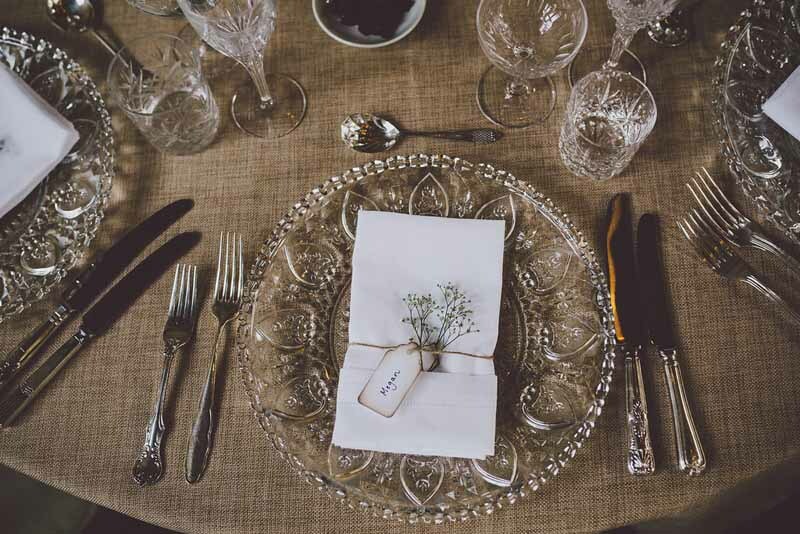 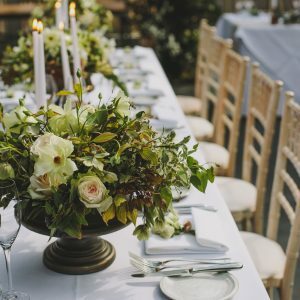 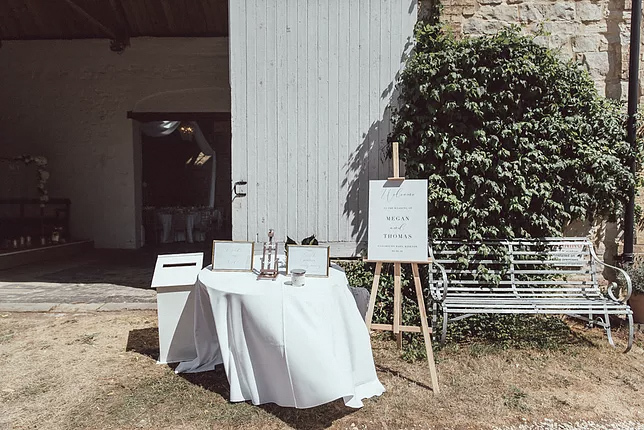 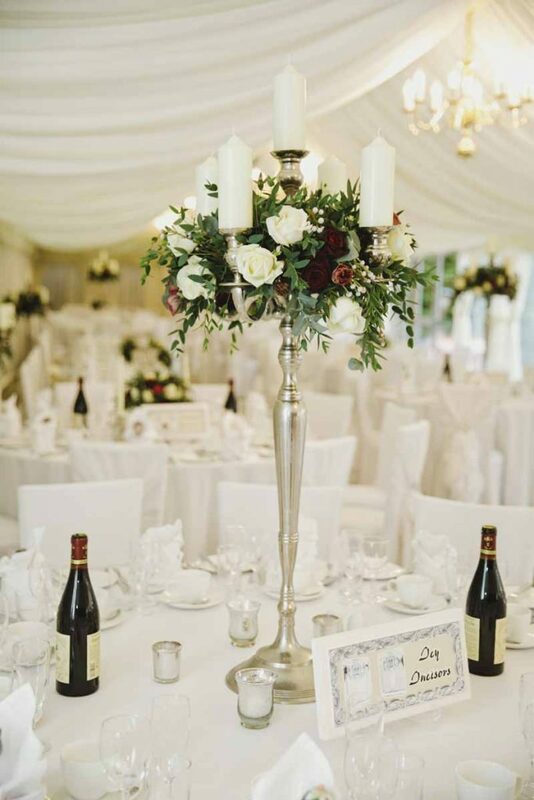 She wanted a romantic reception set in the grounds of Priory Farm. 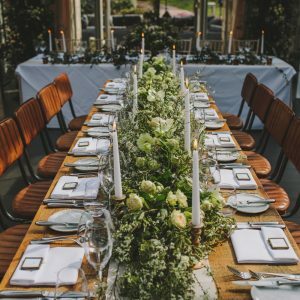 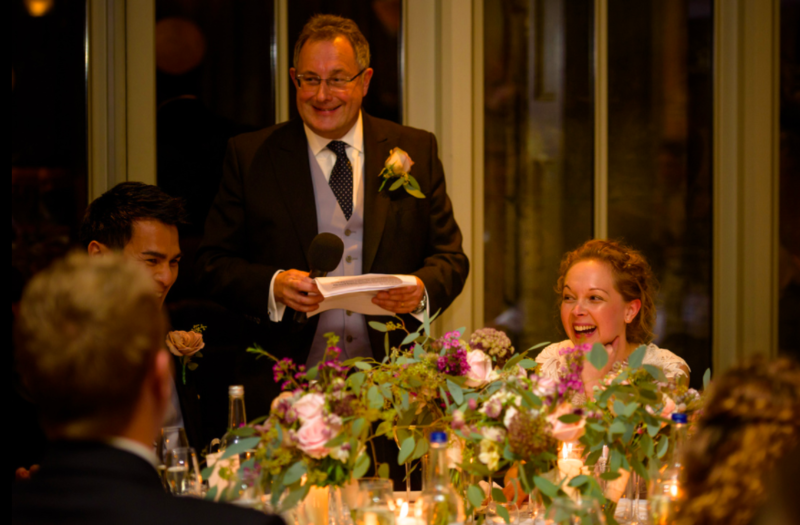 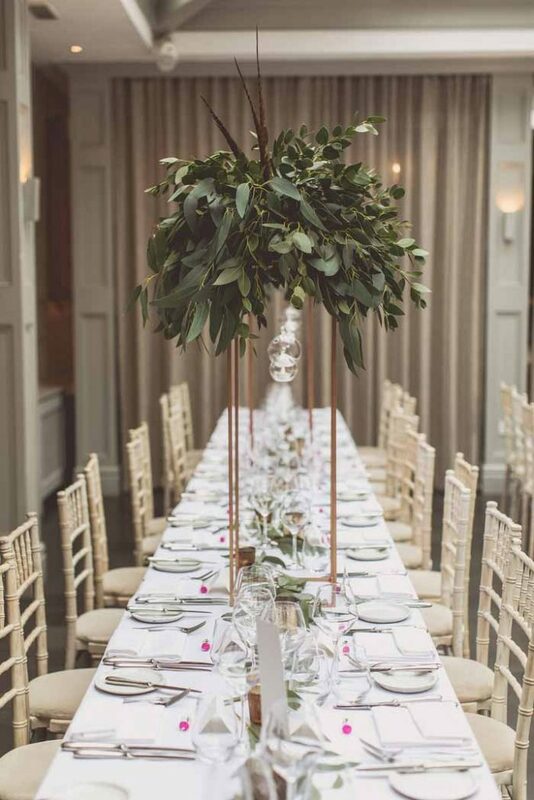 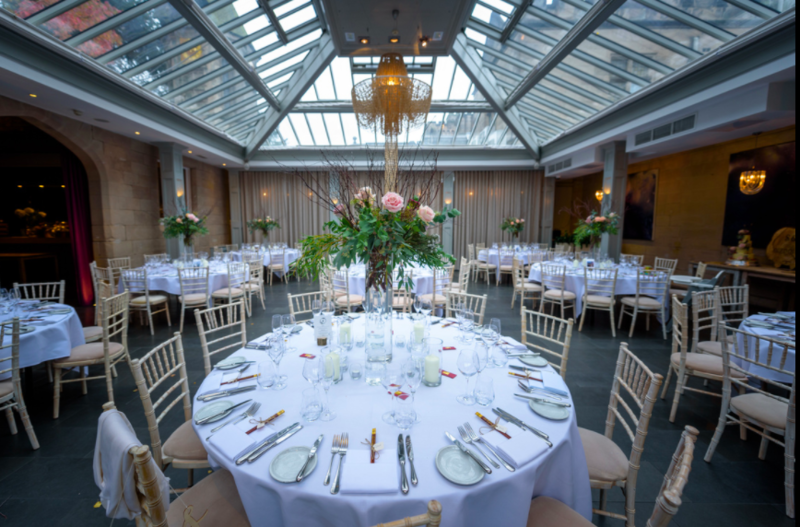 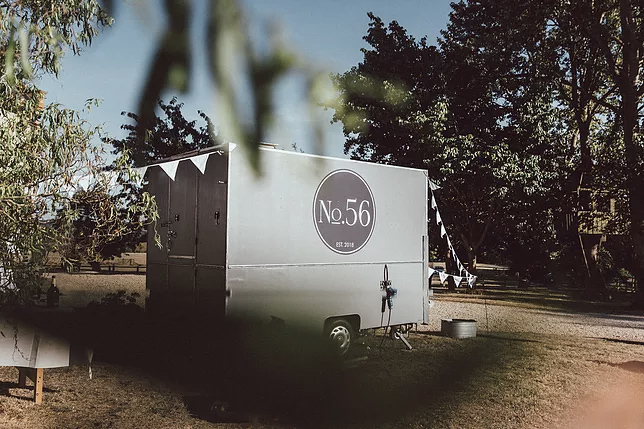 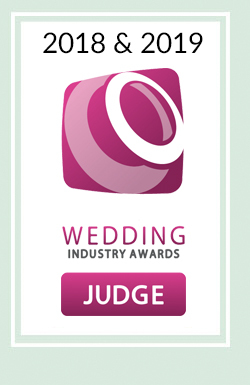 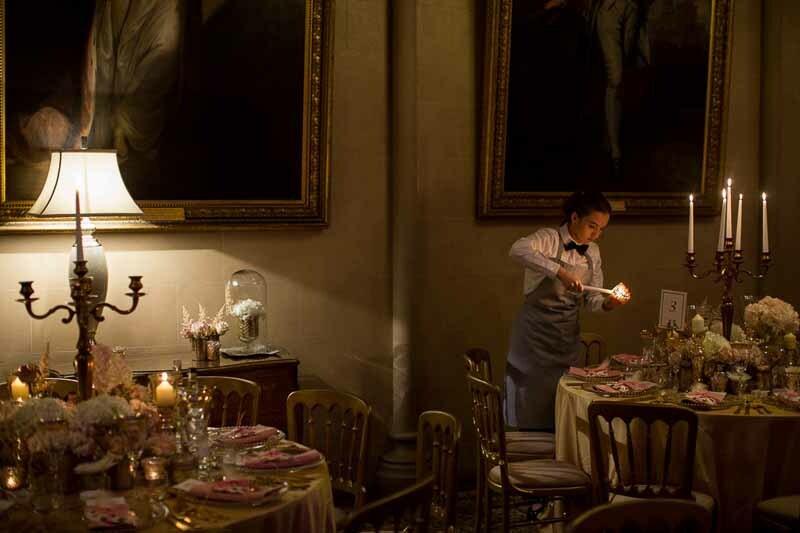 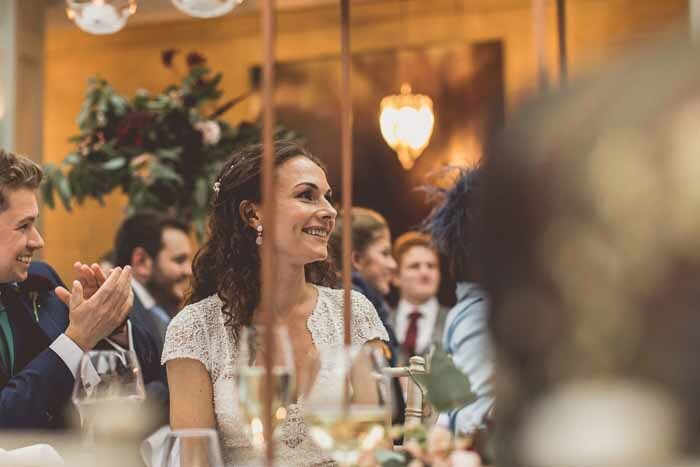 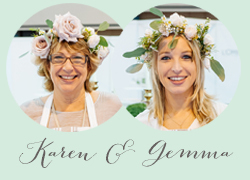 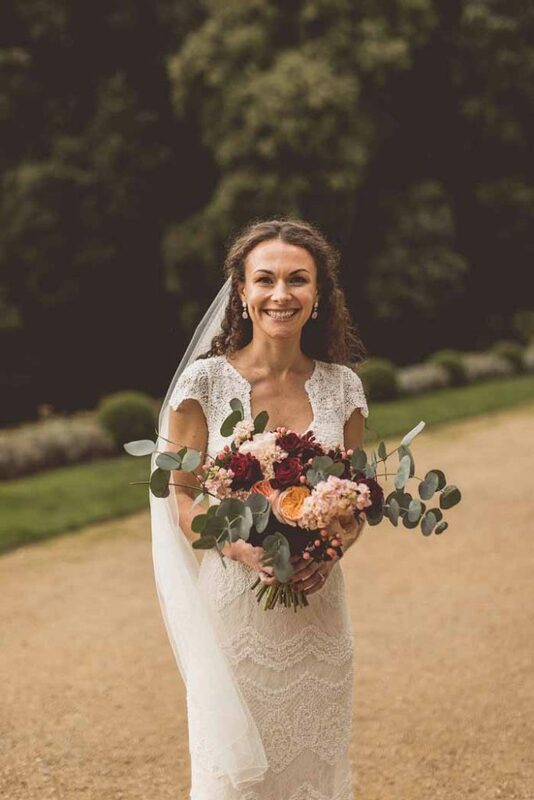 Imogen runs Capital Cooking in London a well respected catering company and it was a delight to work with her and the team on her wedding. 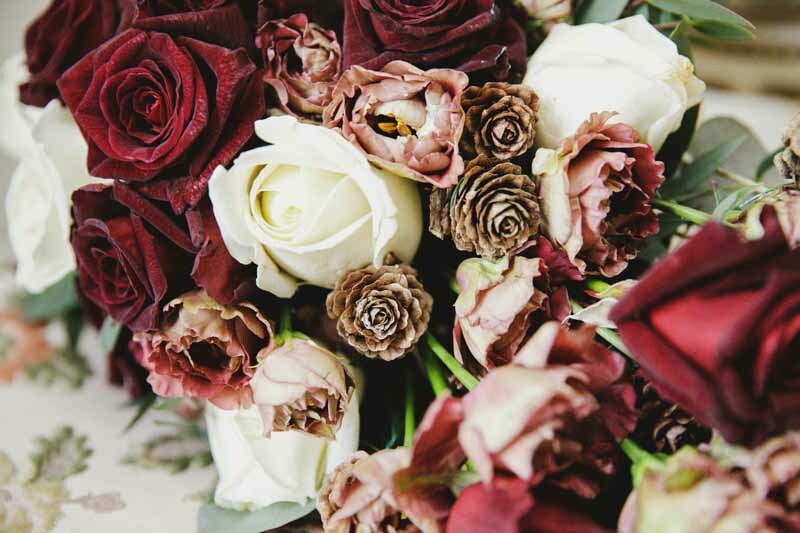 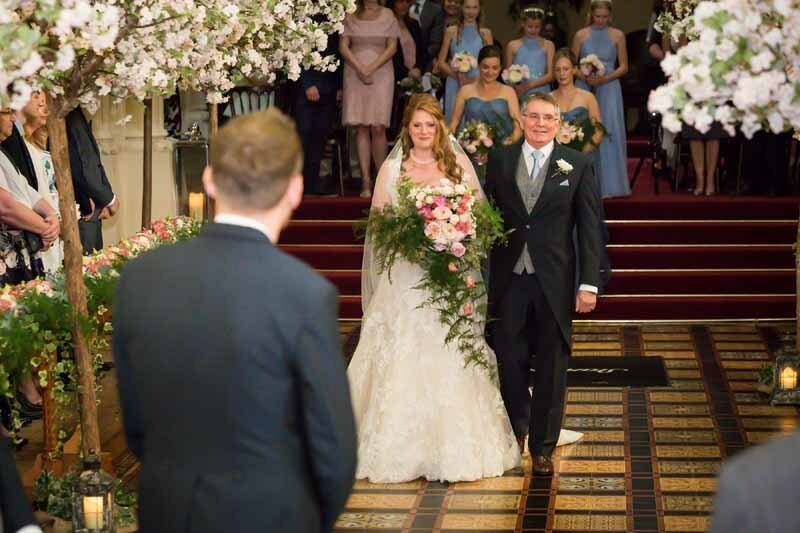 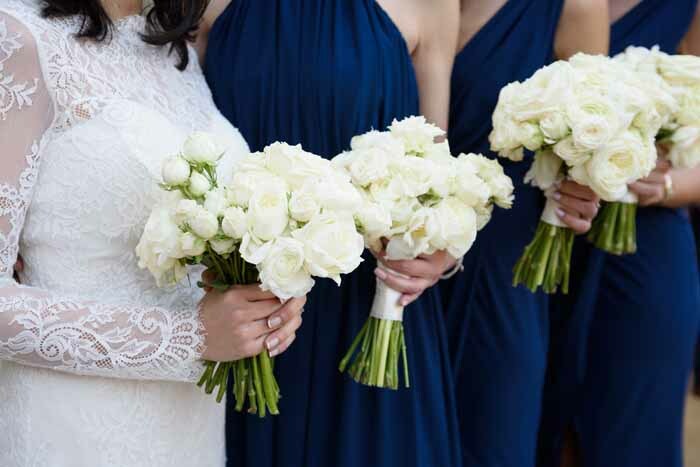 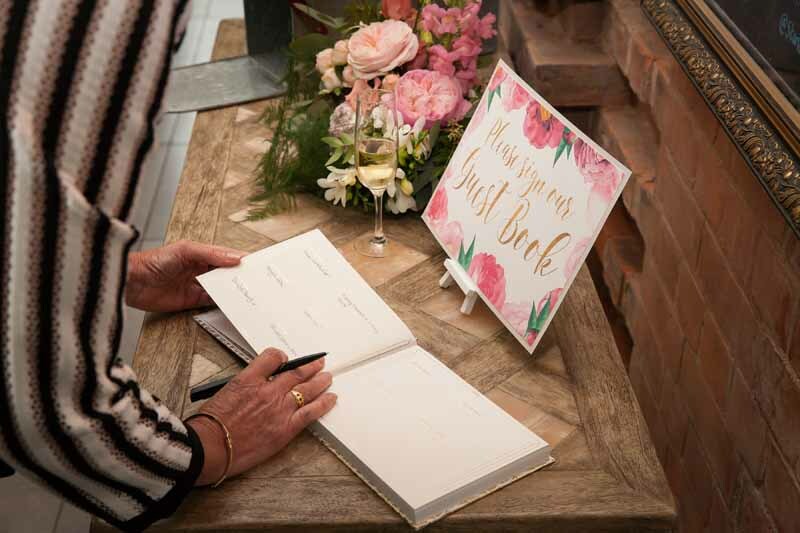 The young memebers of the bridal party sported cute button holes and flower crowns and the bouquets included a mix of scented roses hand tied with silk ribbons. 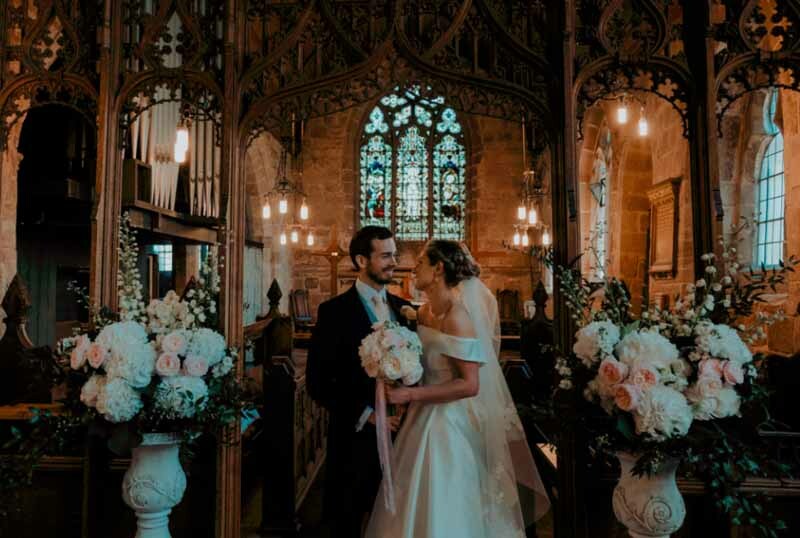 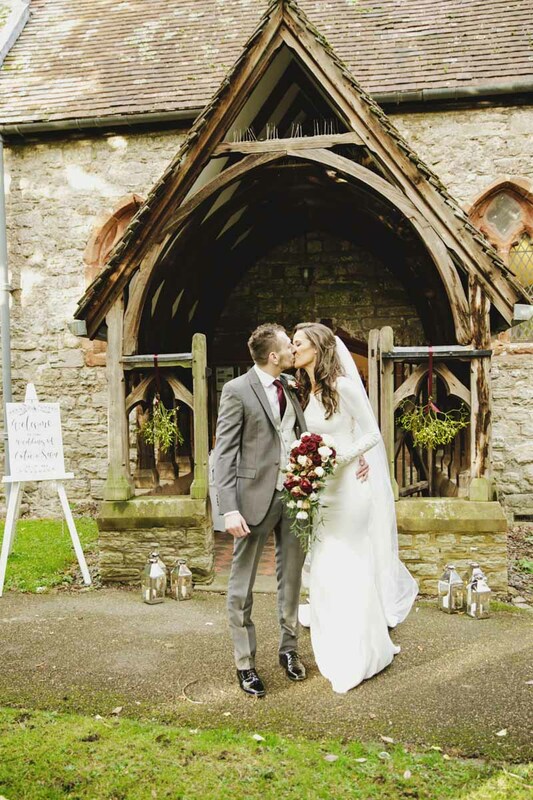 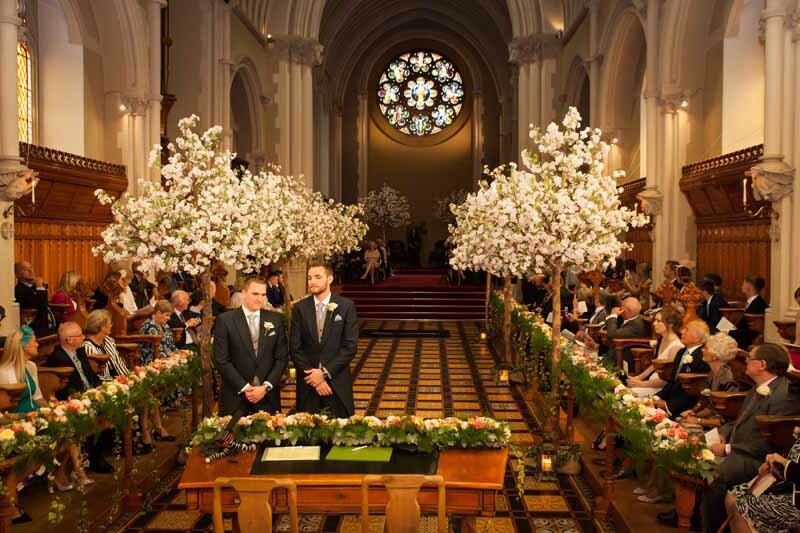 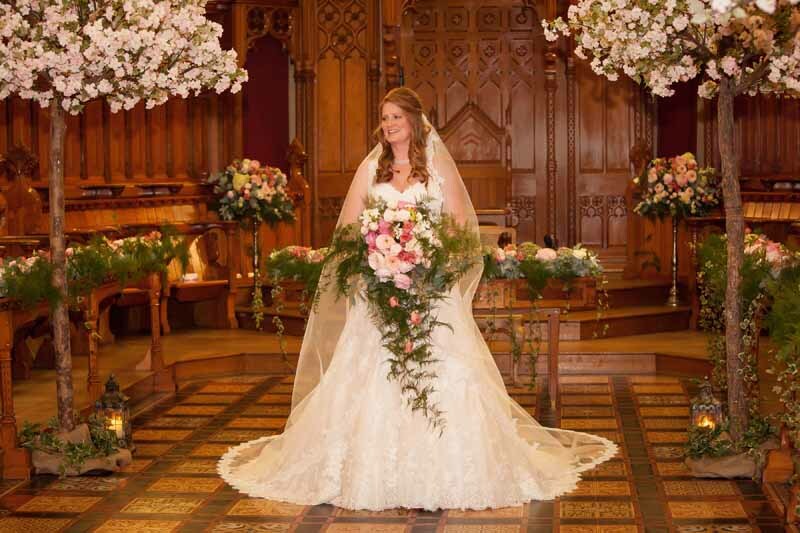 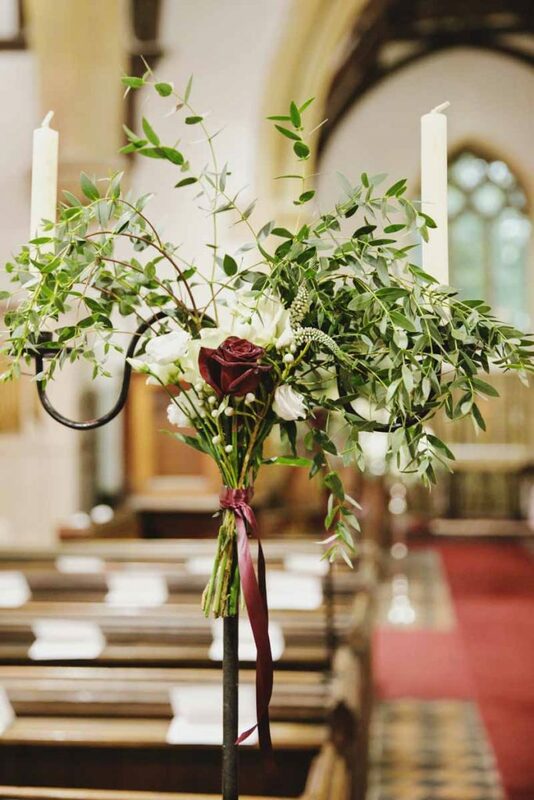 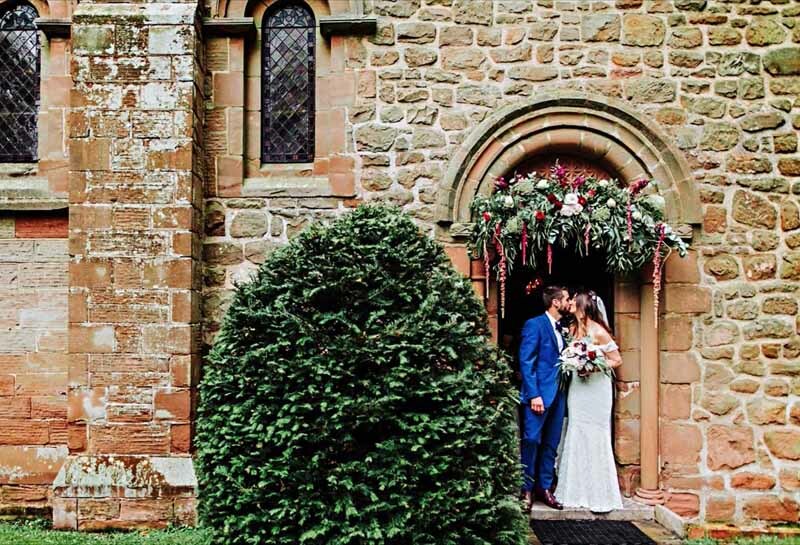 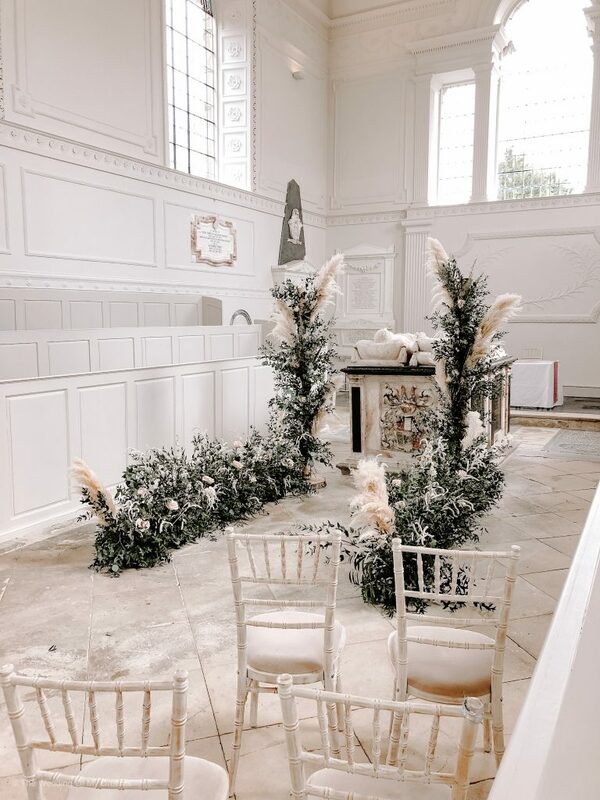 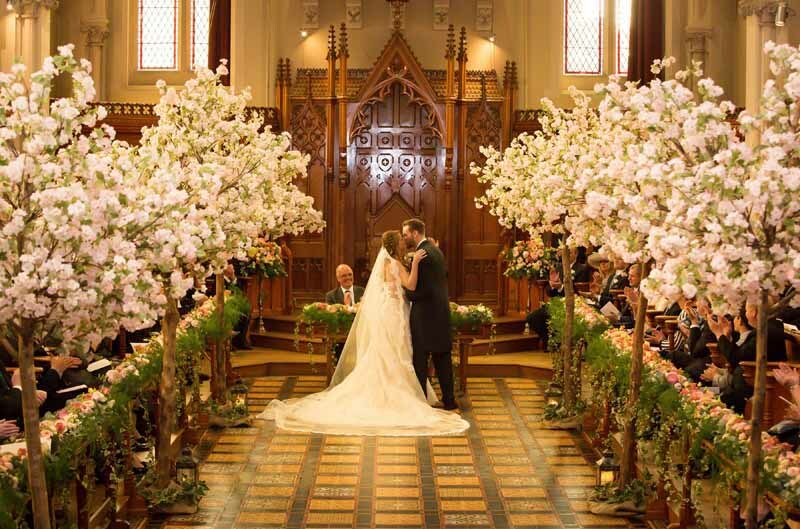 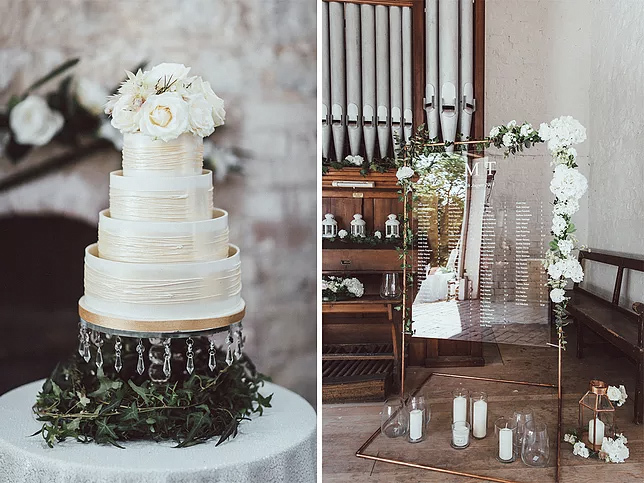 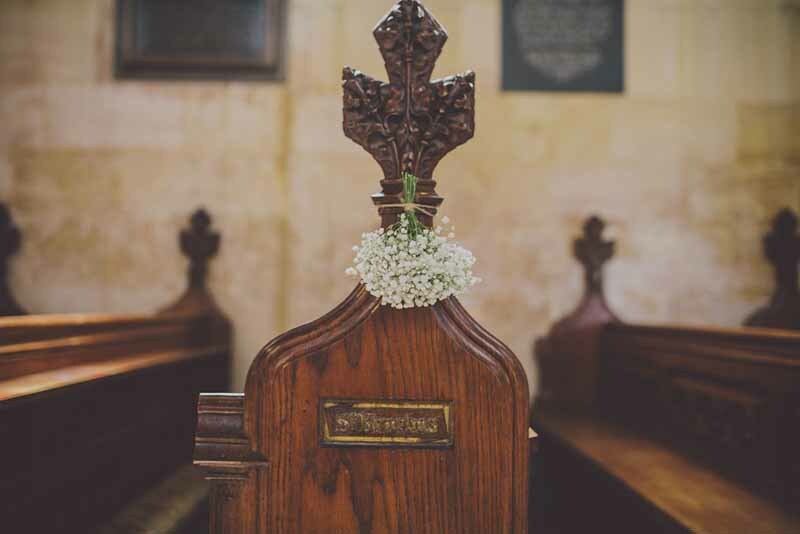 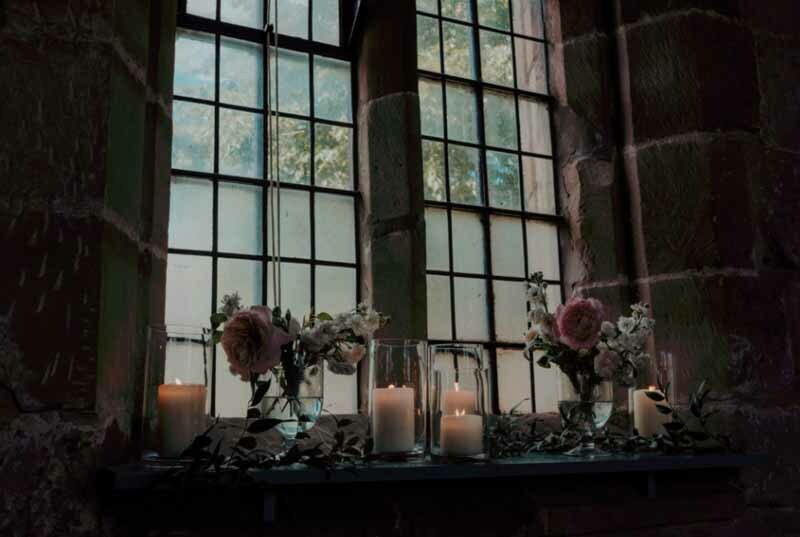 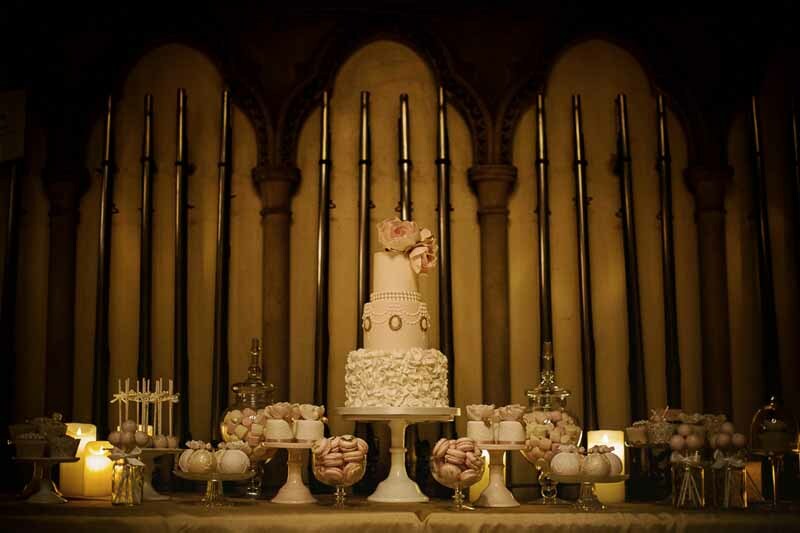 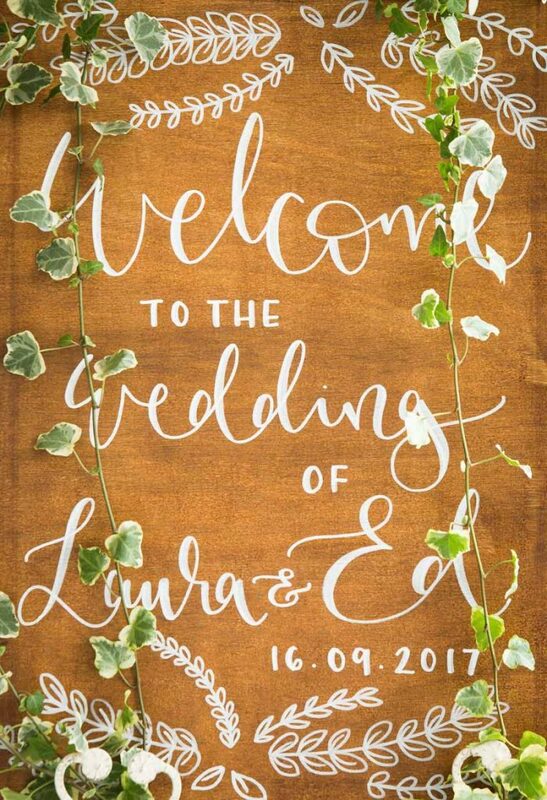 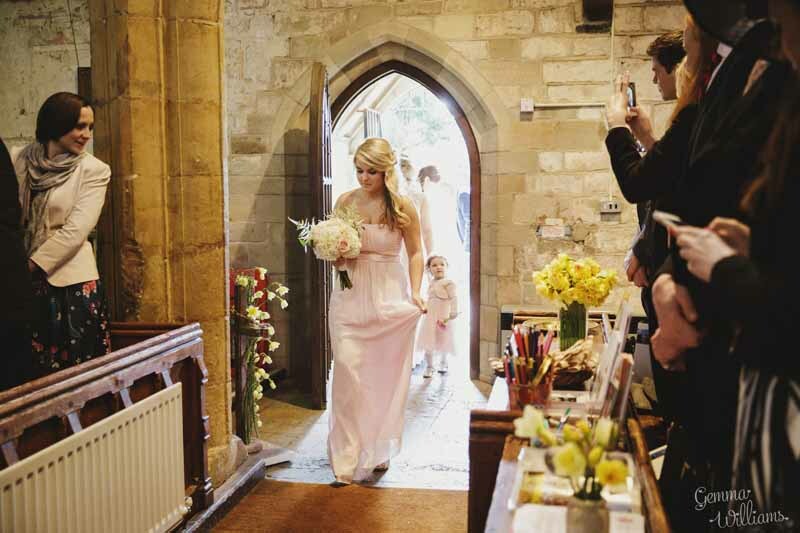 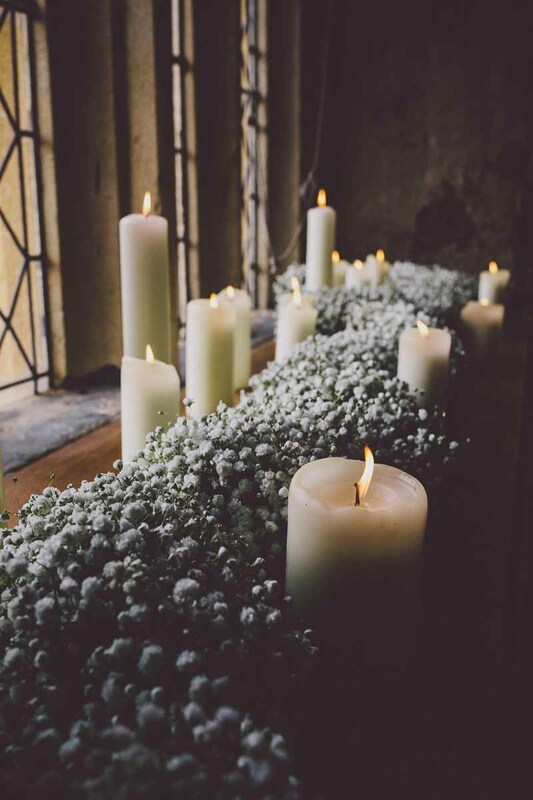 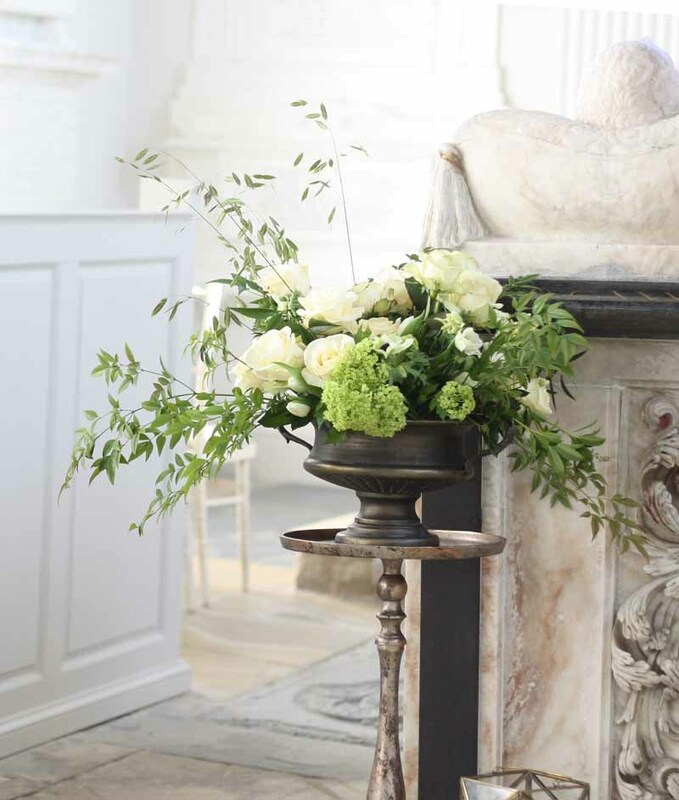 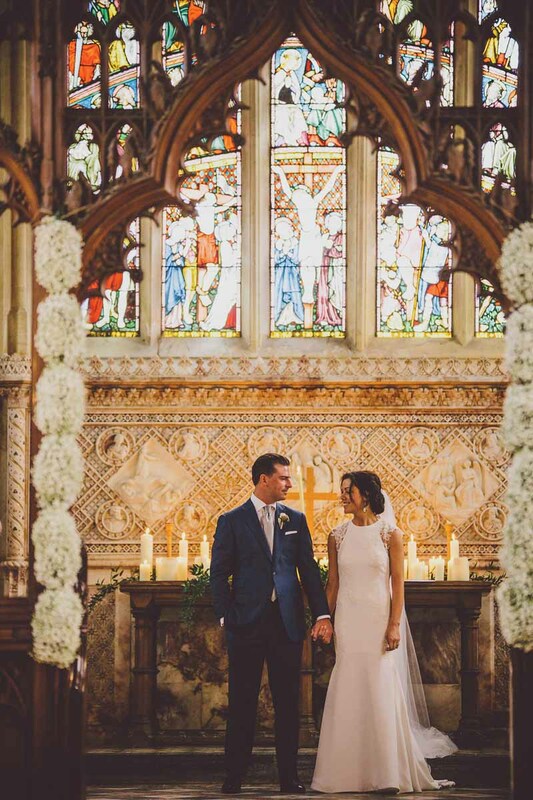 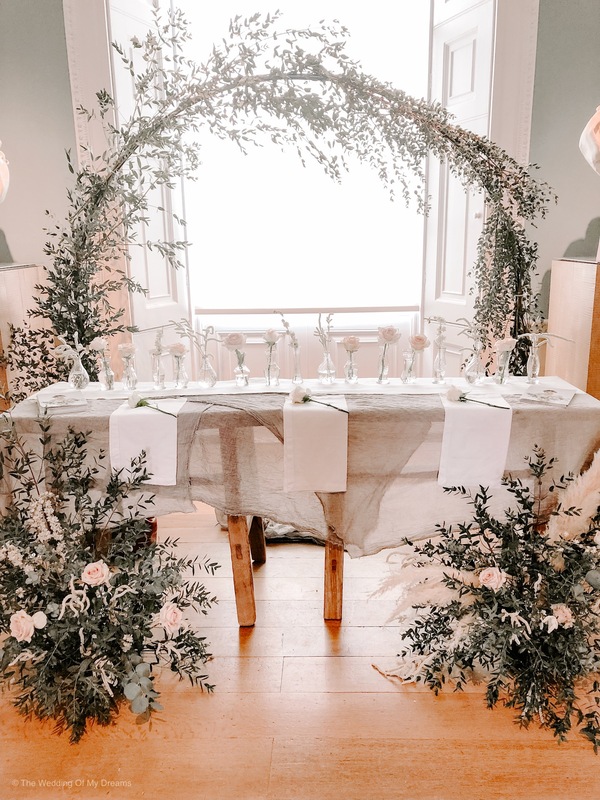 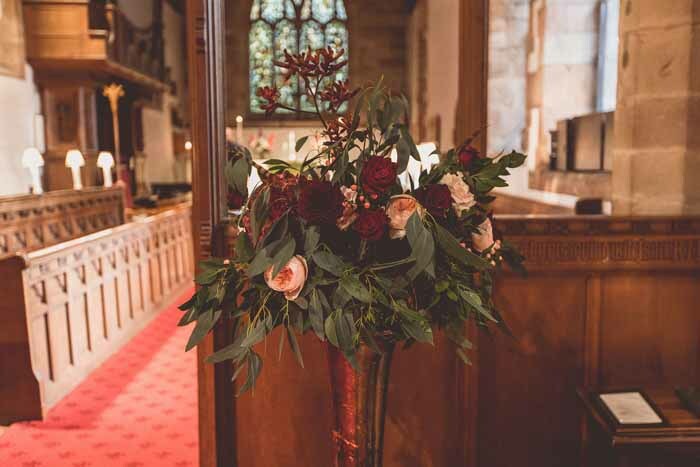 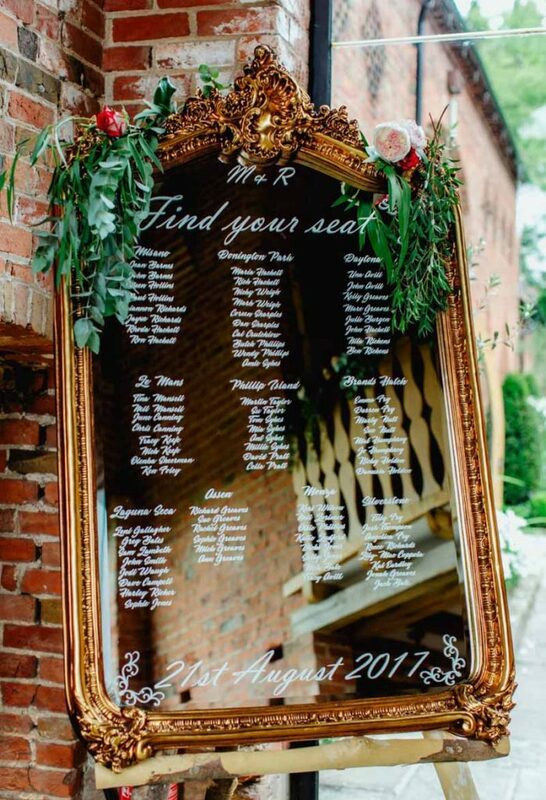 The village church was a delight to decorate with romantic flowers, scented roses, stocks adorned the windowsils with candlelight adding a soft glow. 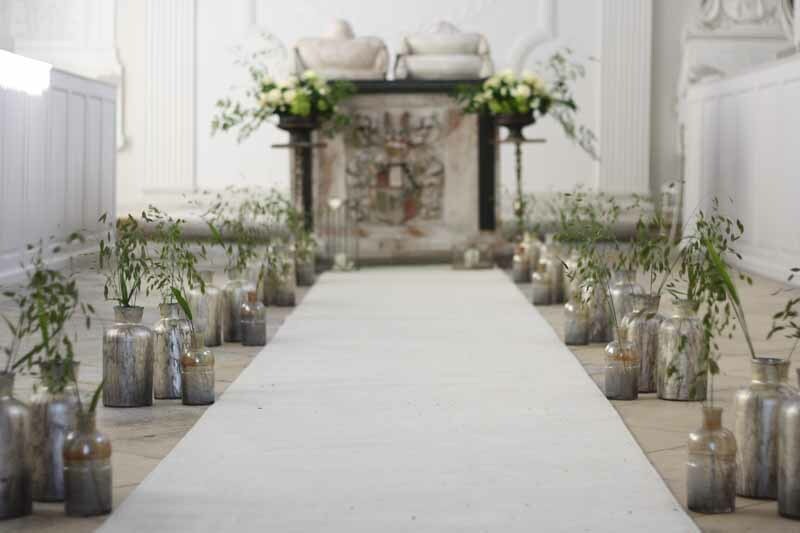 Large stone urns framed the ceremony, with tall delphiniums added for height. 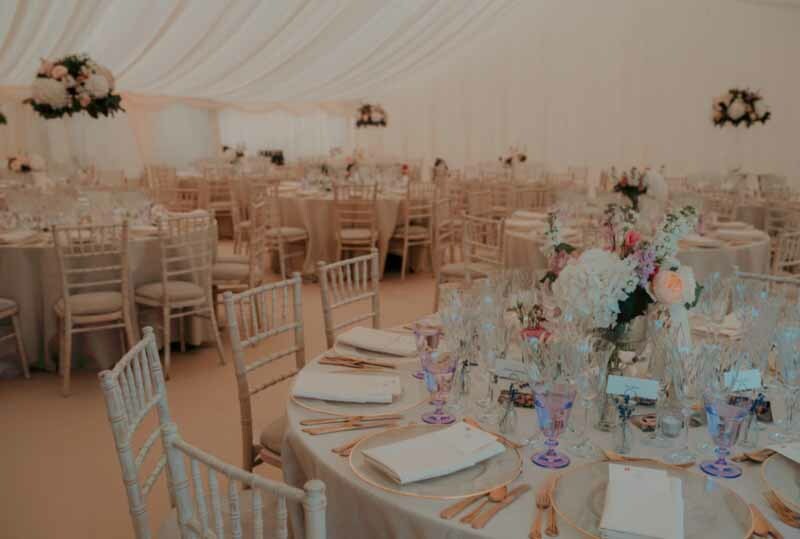 Inside the marquee we continued the romantic look with a mix of high and low centrepeice designs with lush flowers from the day. 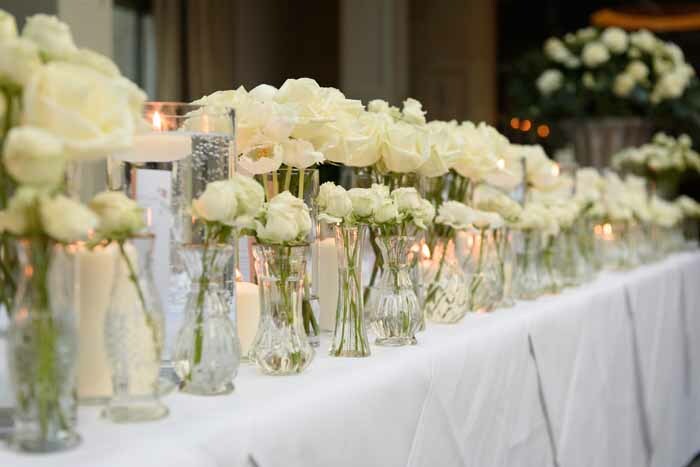 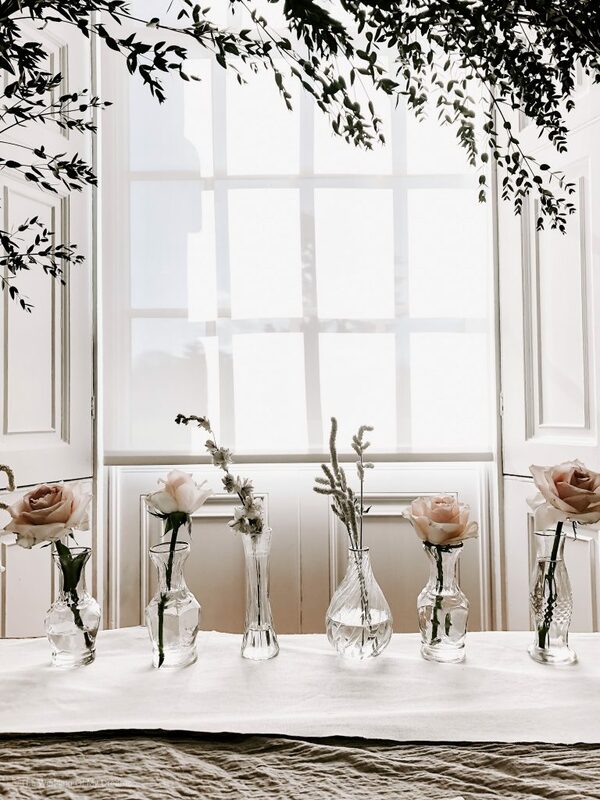 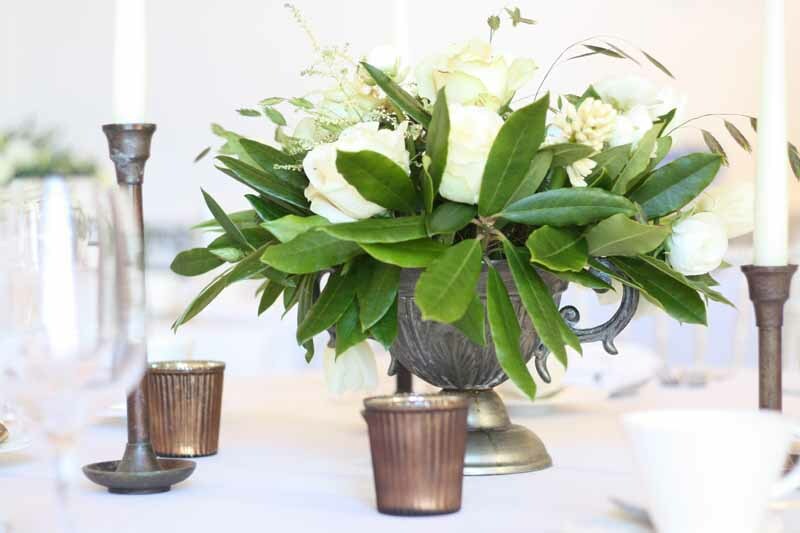 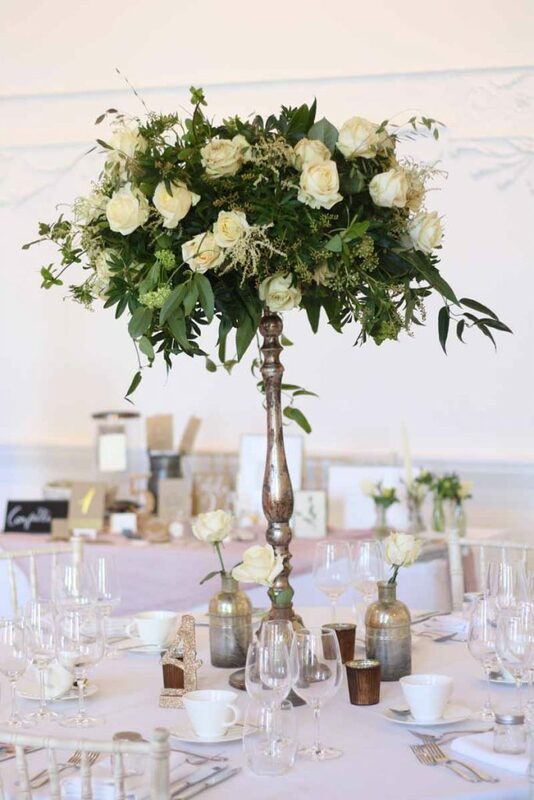 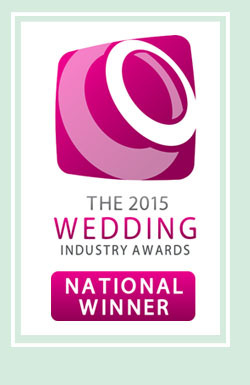 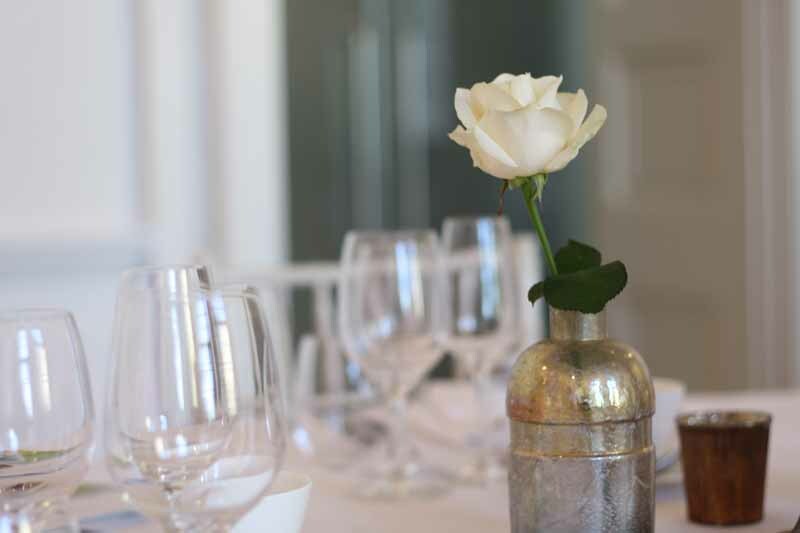 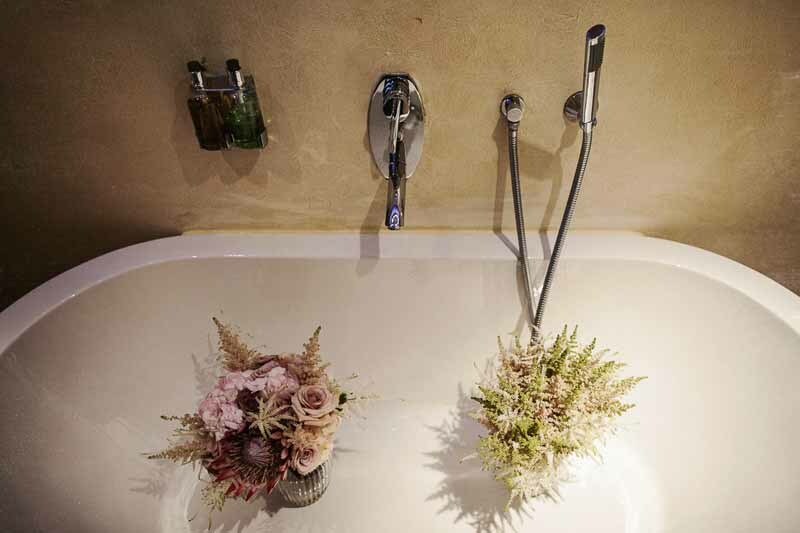 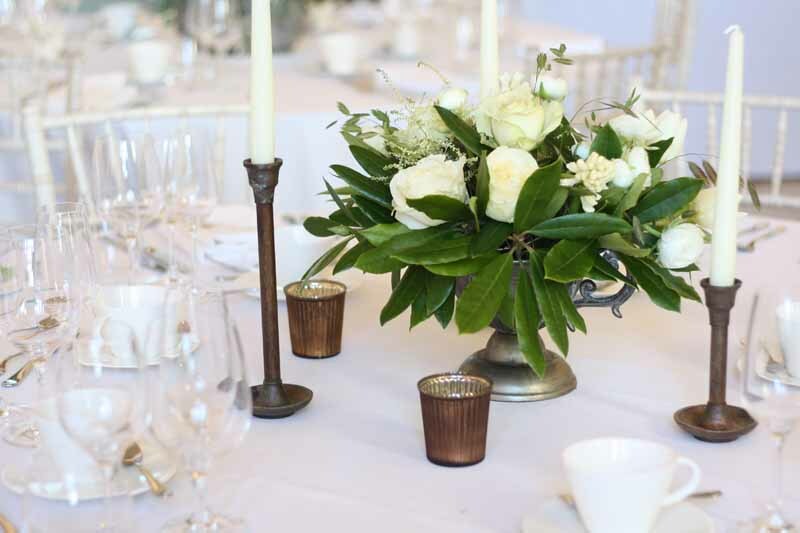 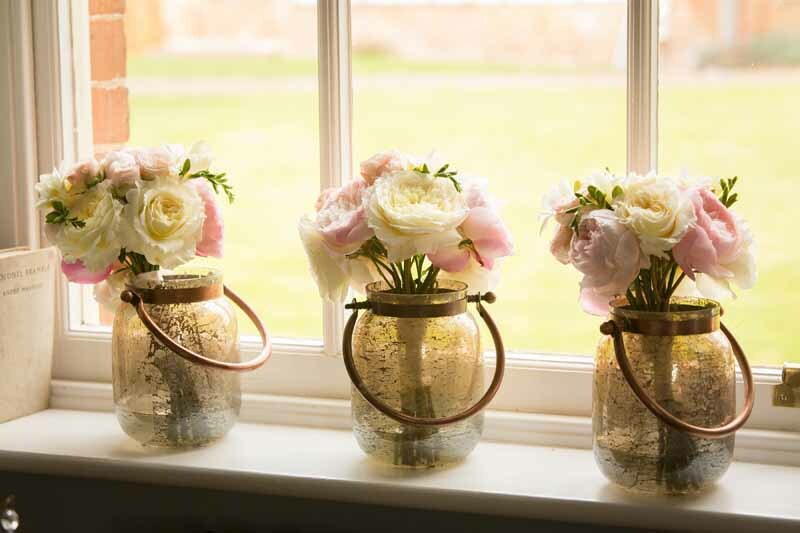 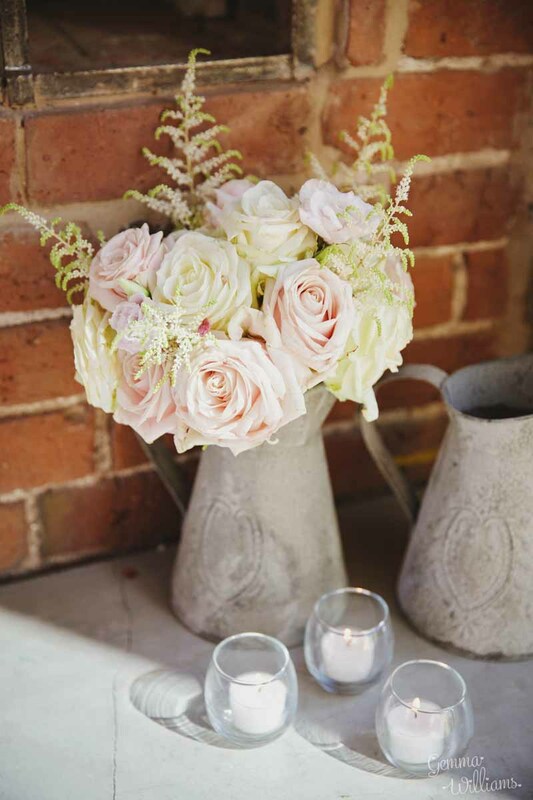 Scented roses, lisianthus, stocks and hydrangea with touches of lavender in the smaller vases. 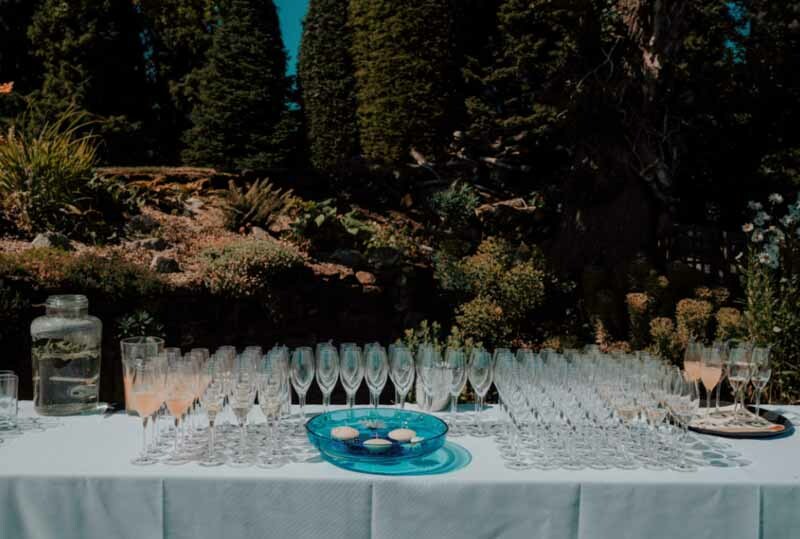 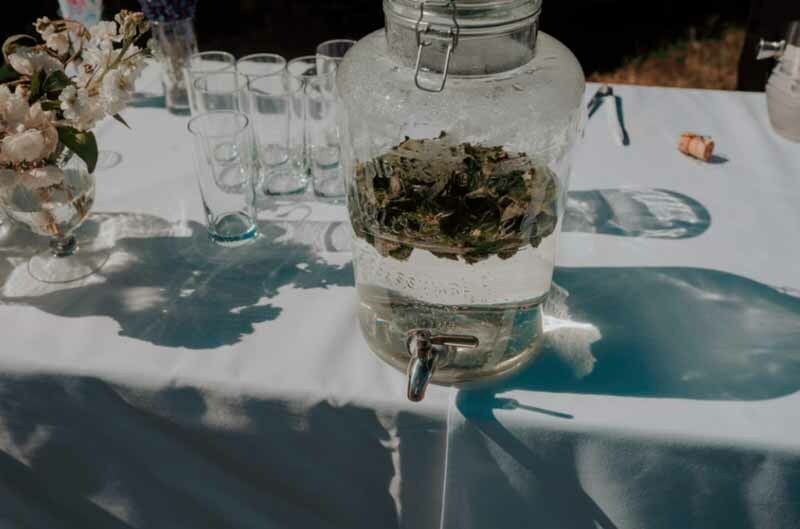 The drinks station was set out around the lake with refreshing drinks on a hot summer’s day. 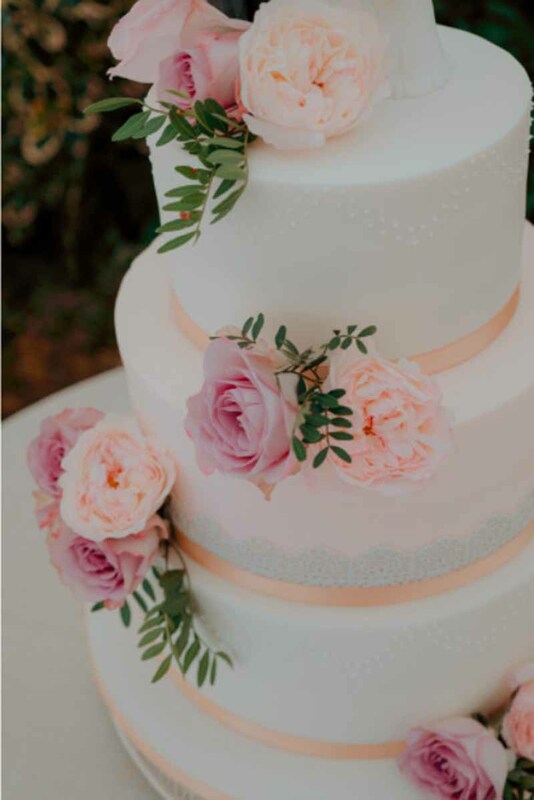 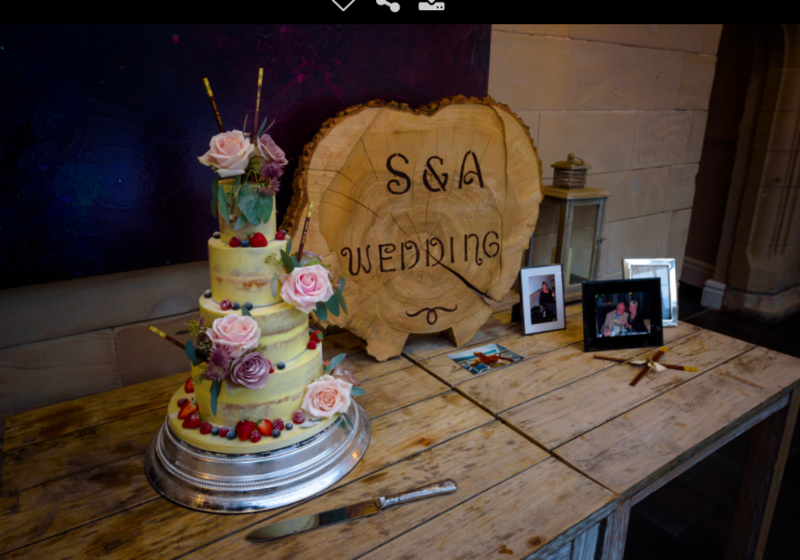 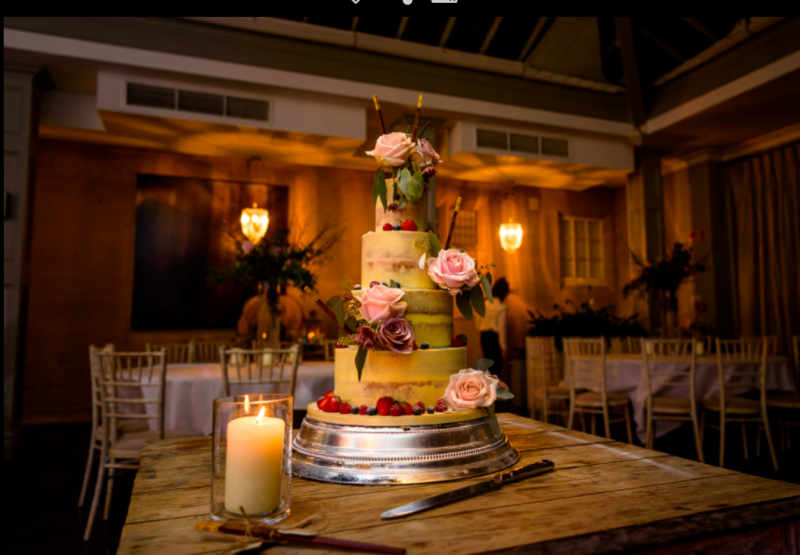 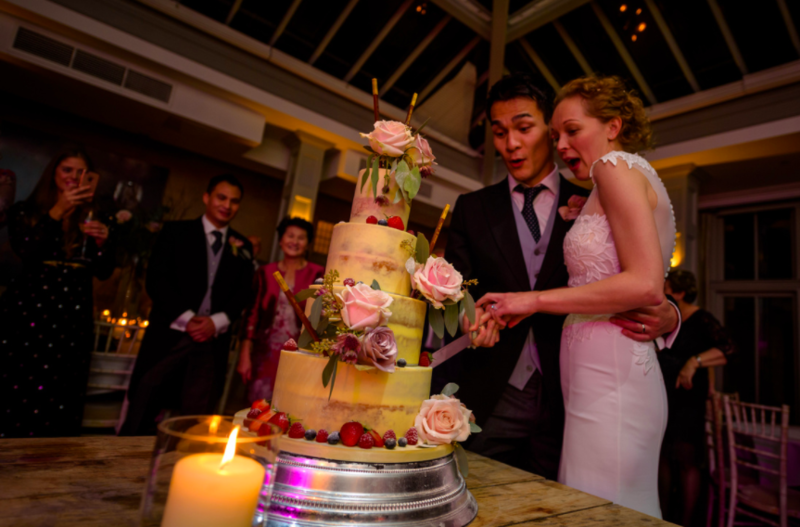 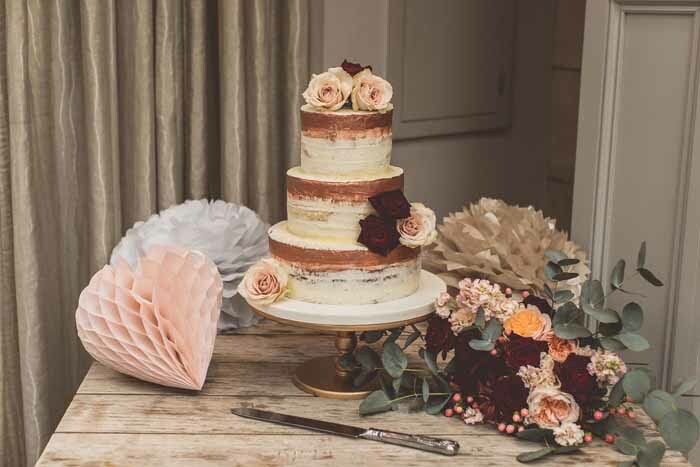 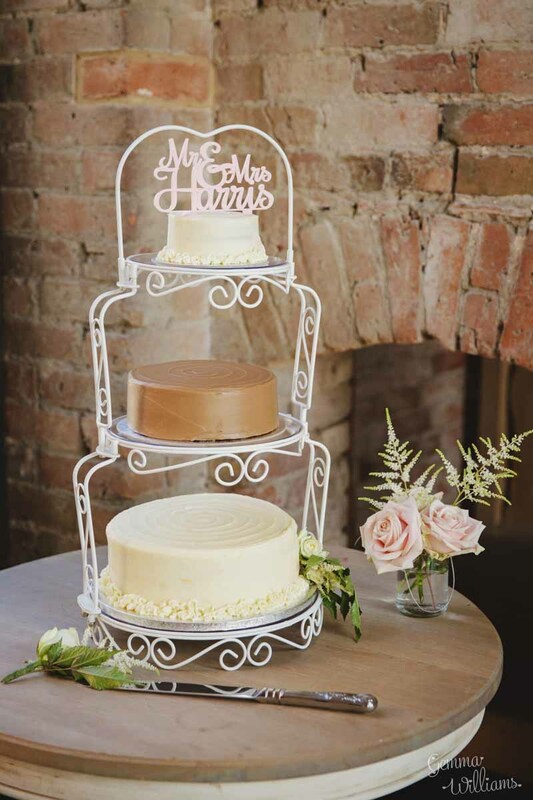 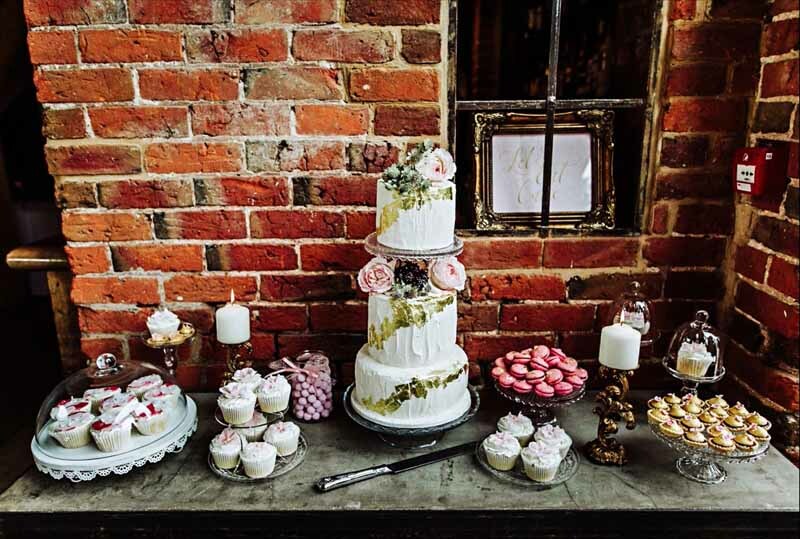 The cake was made to Imogen’s design by her cake maker and we added blooms for complete the romantic look. 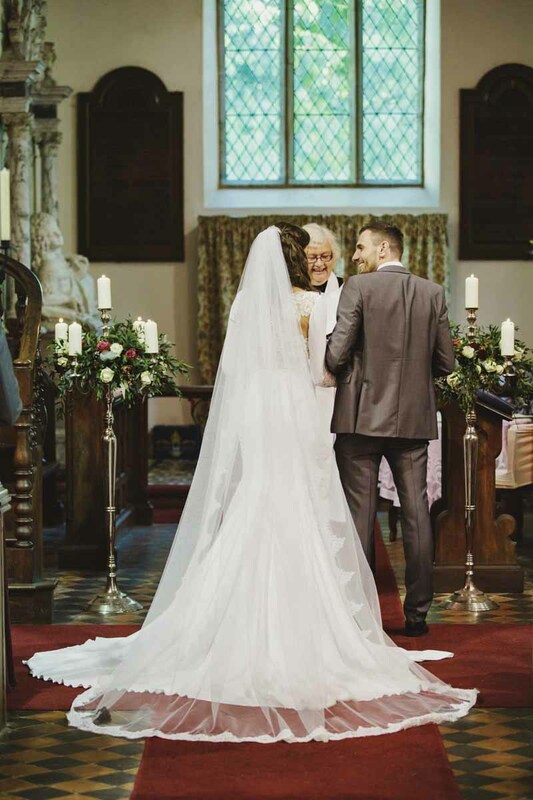 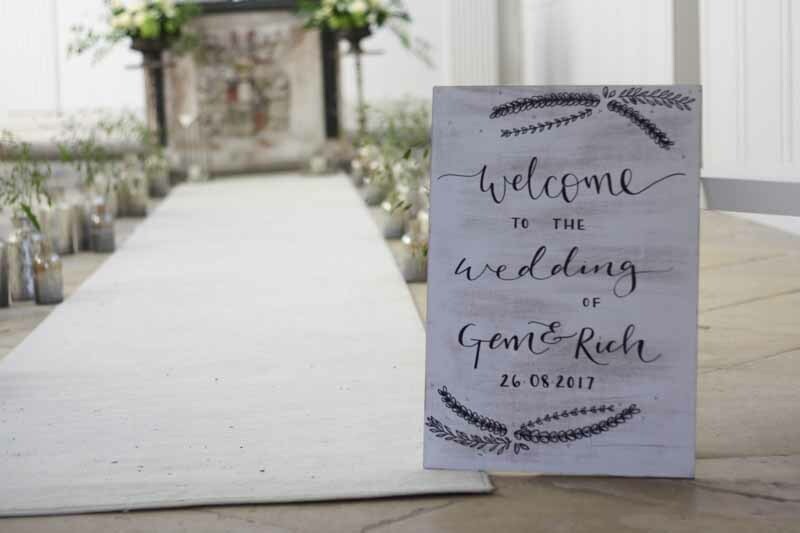 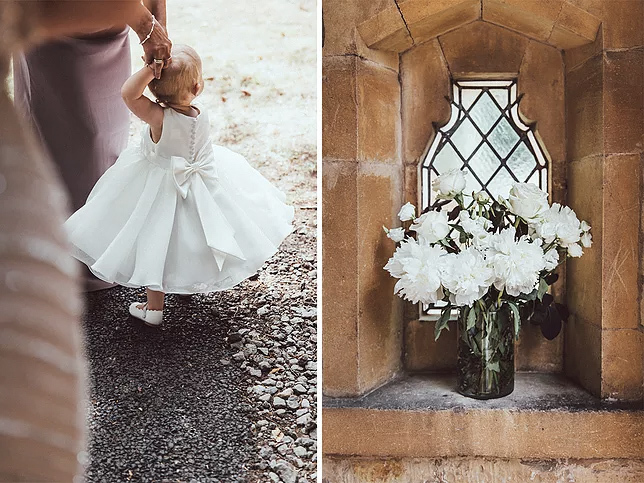 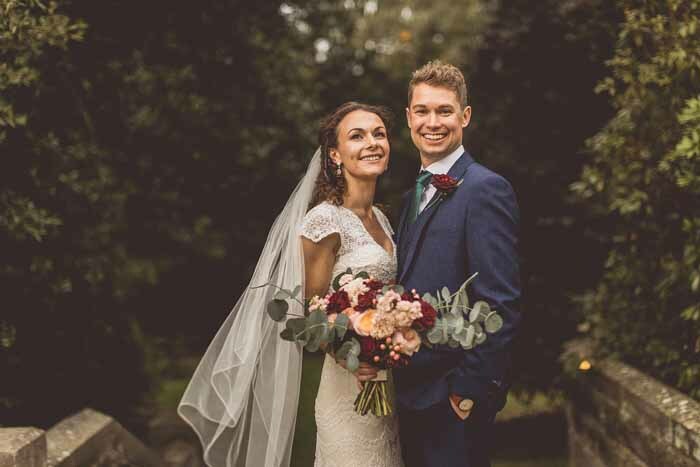 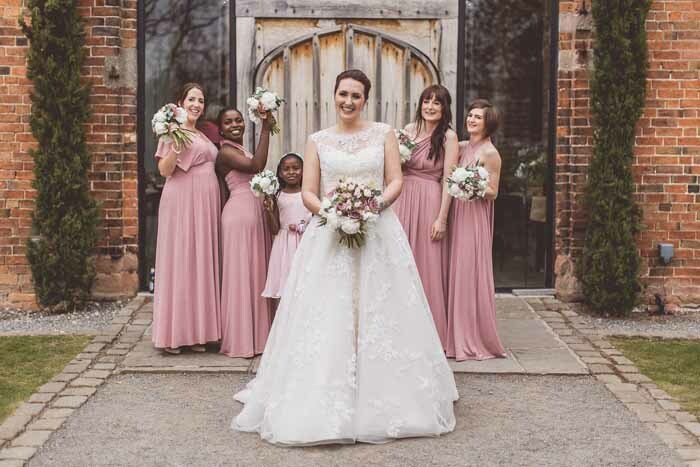 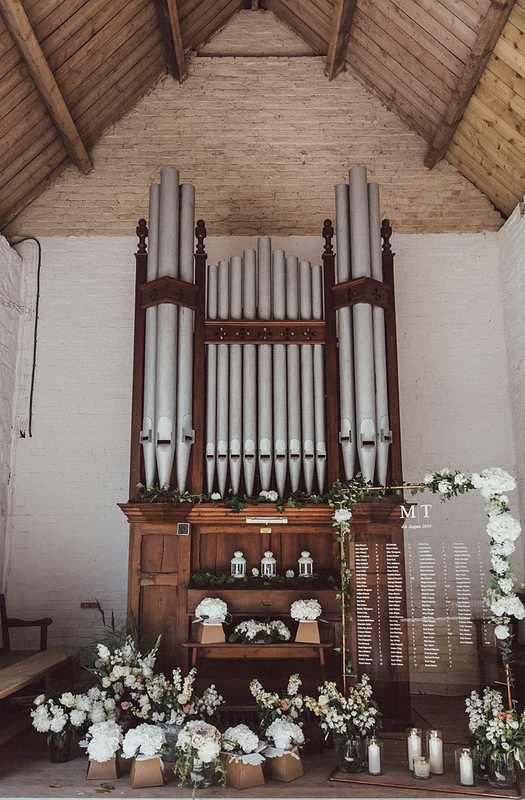 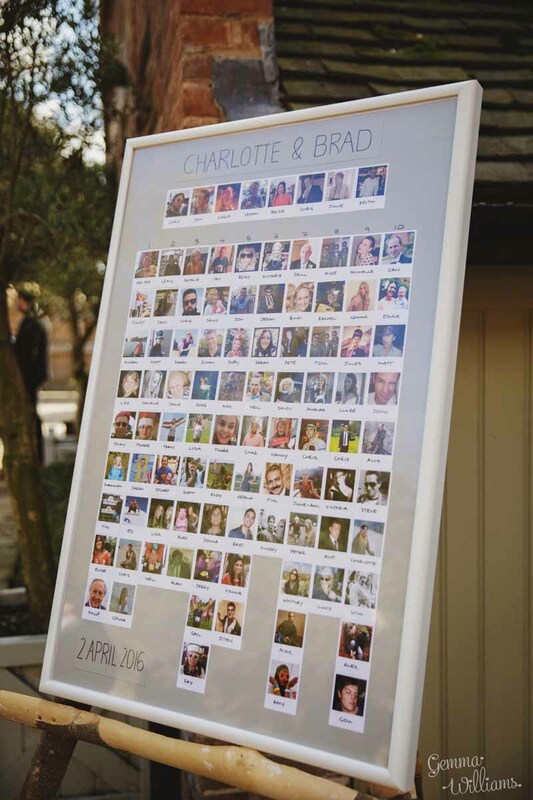 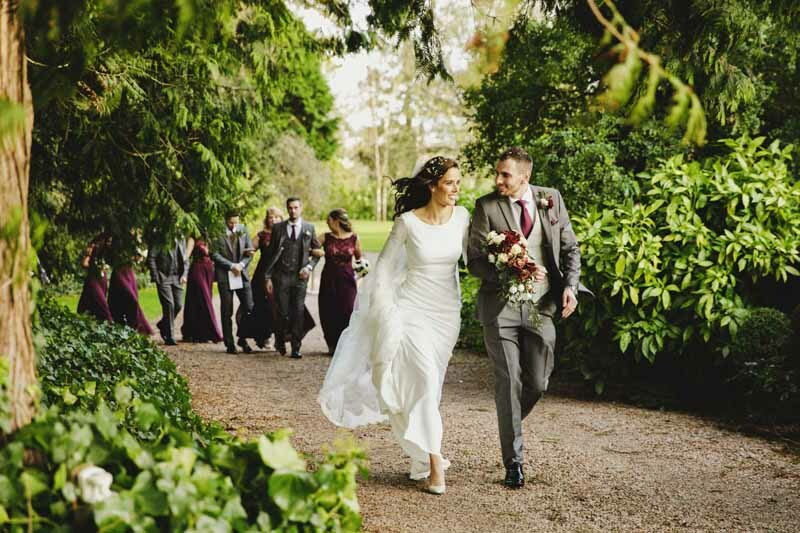 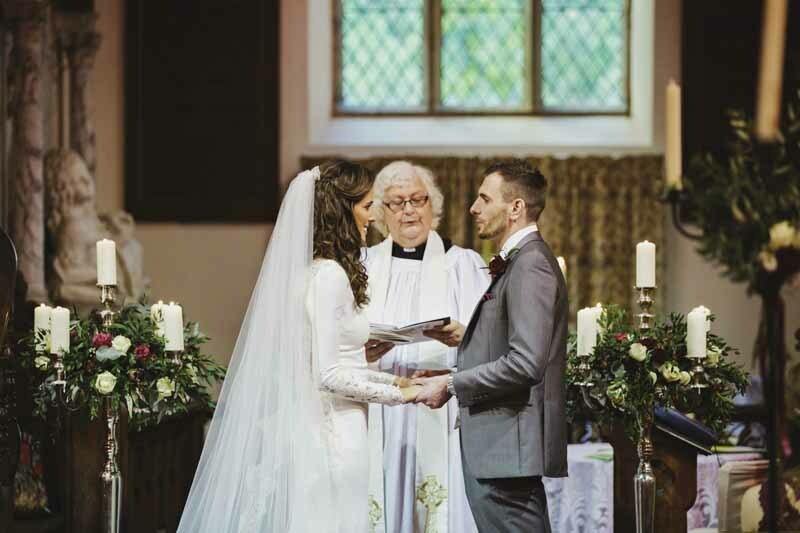 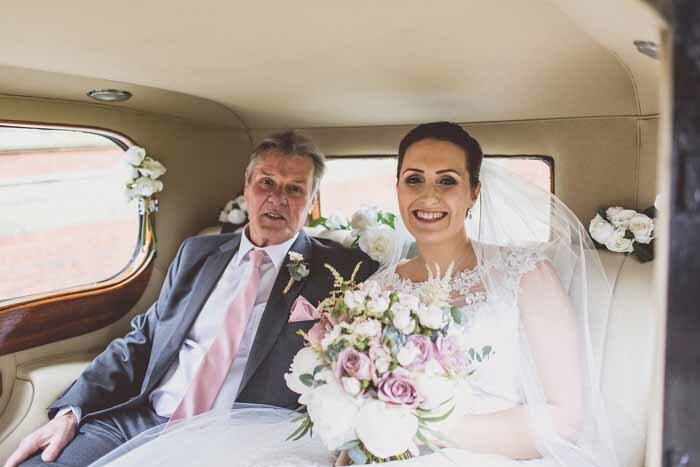 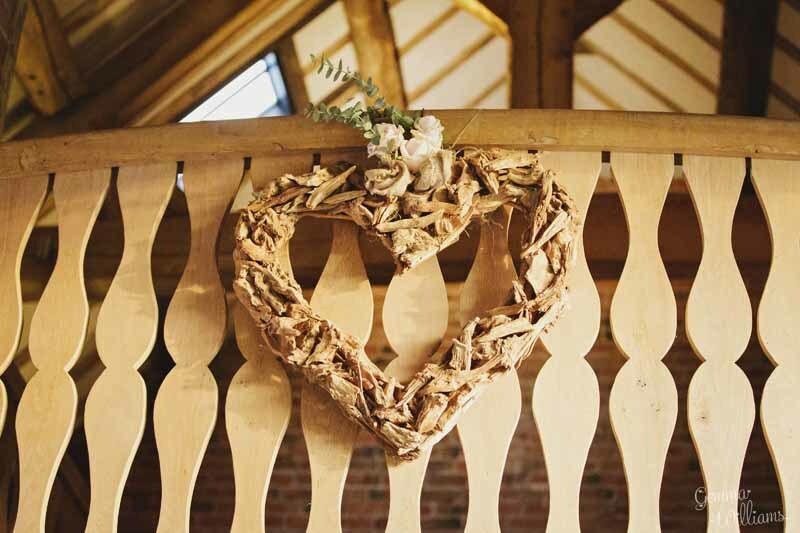 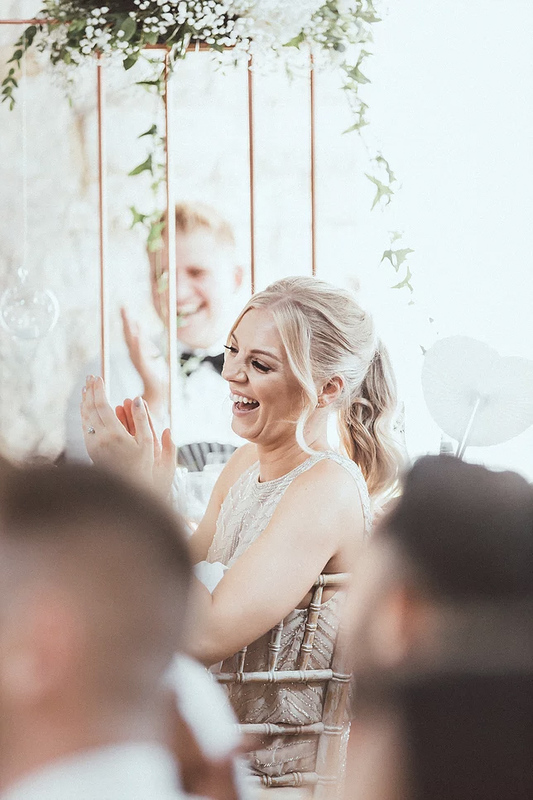 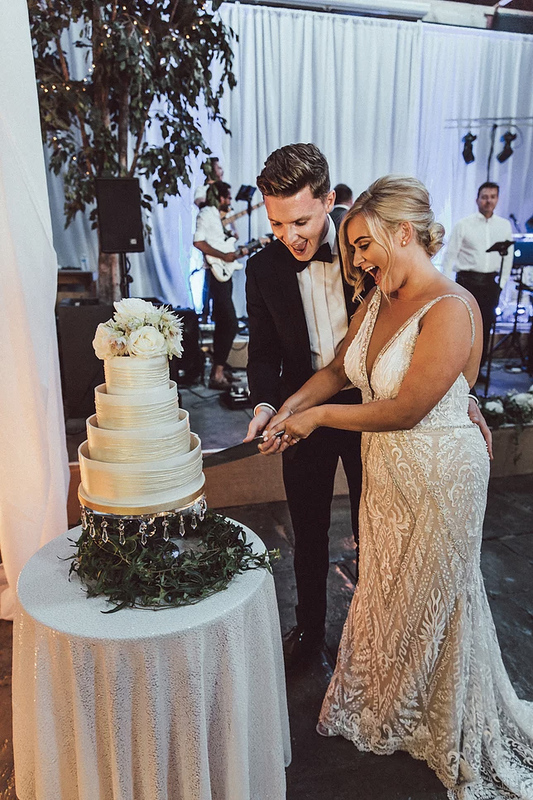 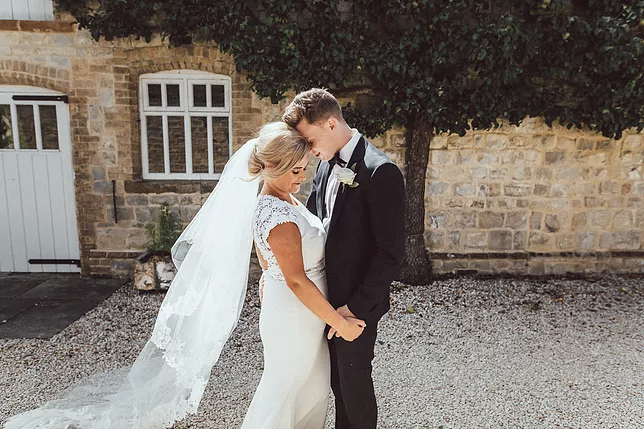 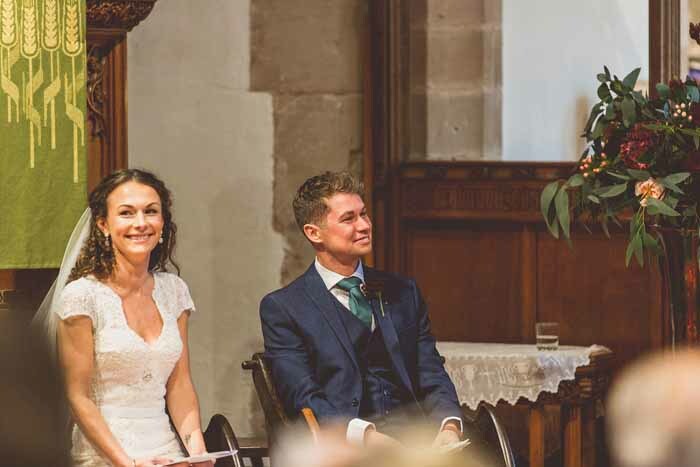 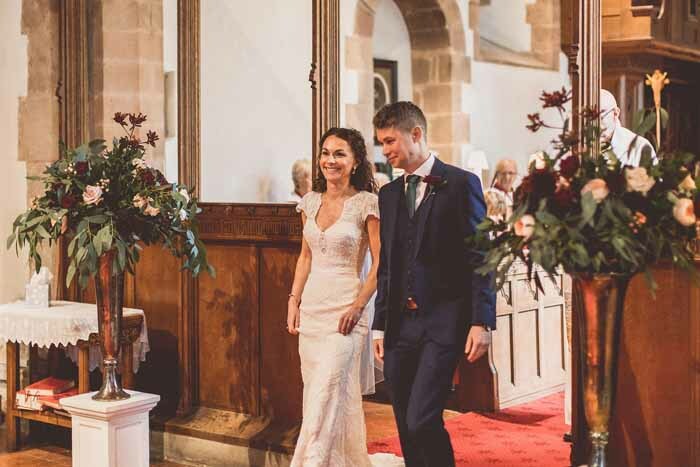 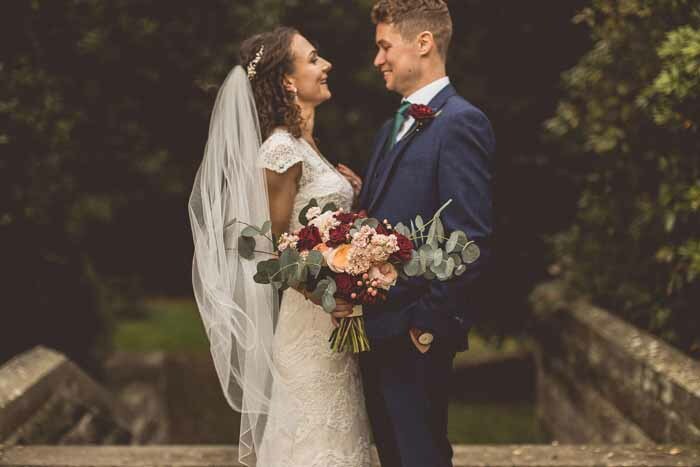 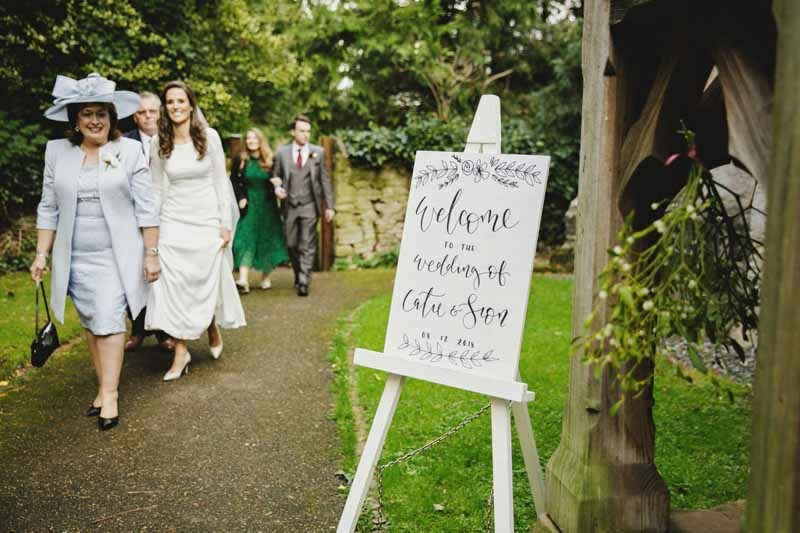 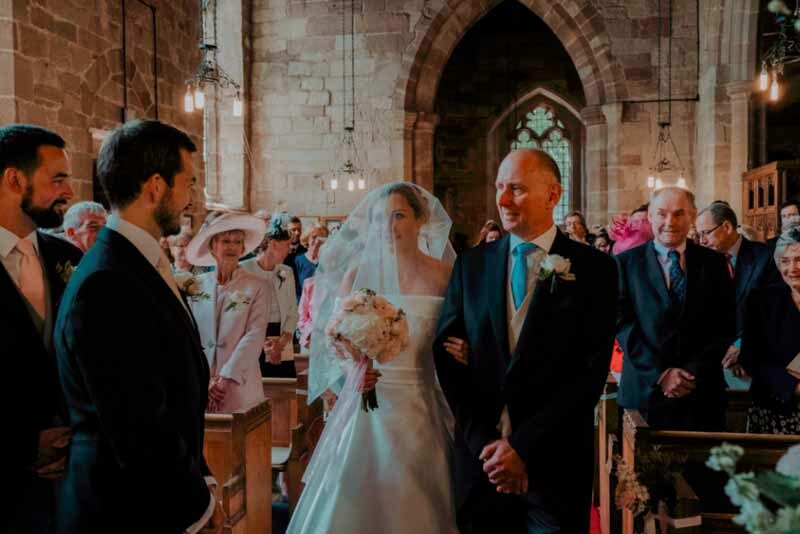 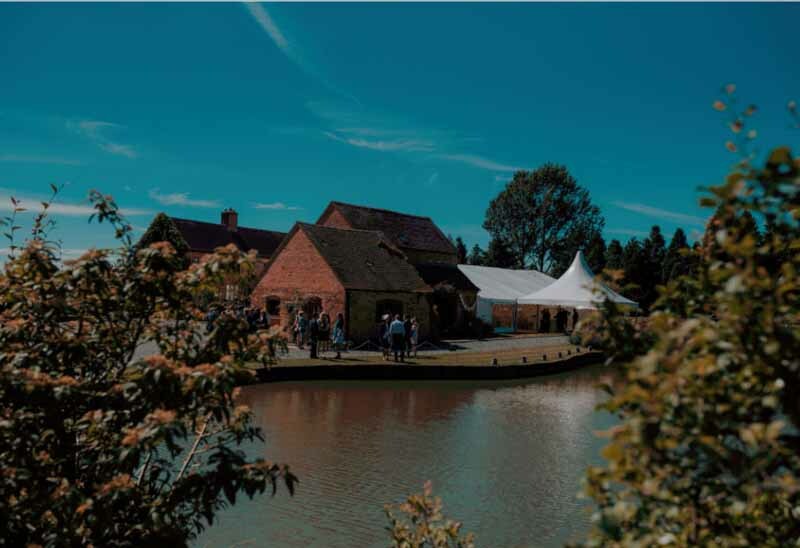 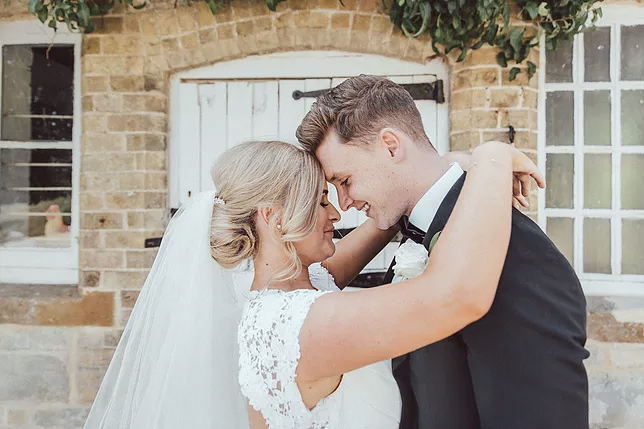 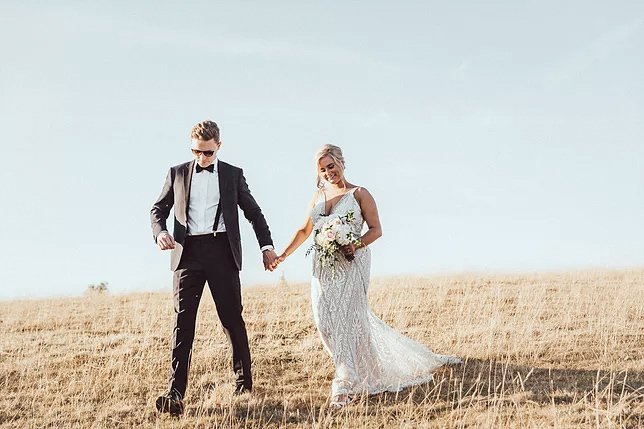 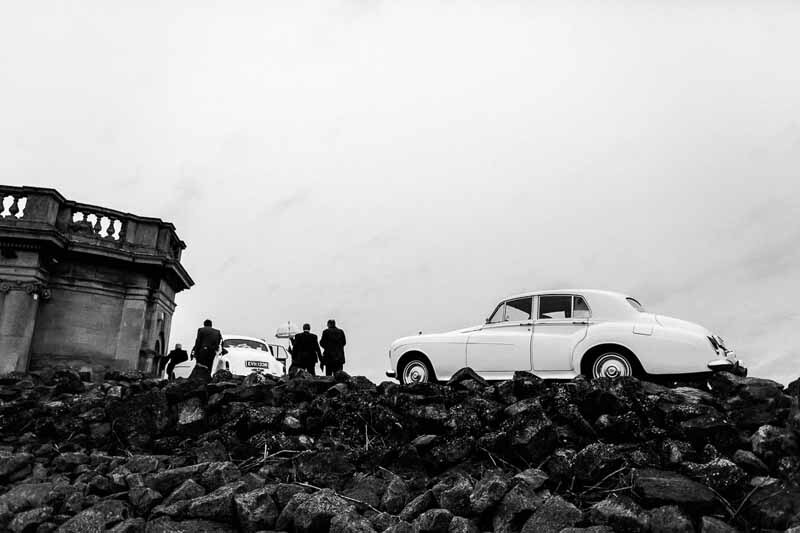 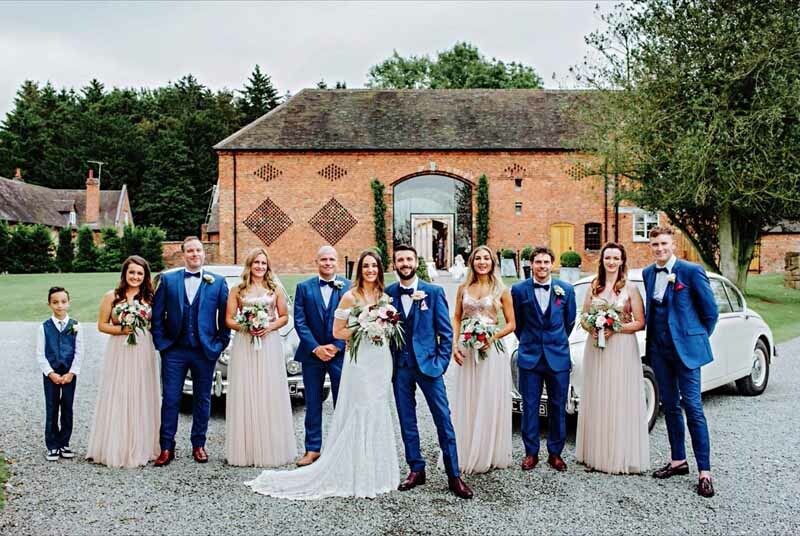 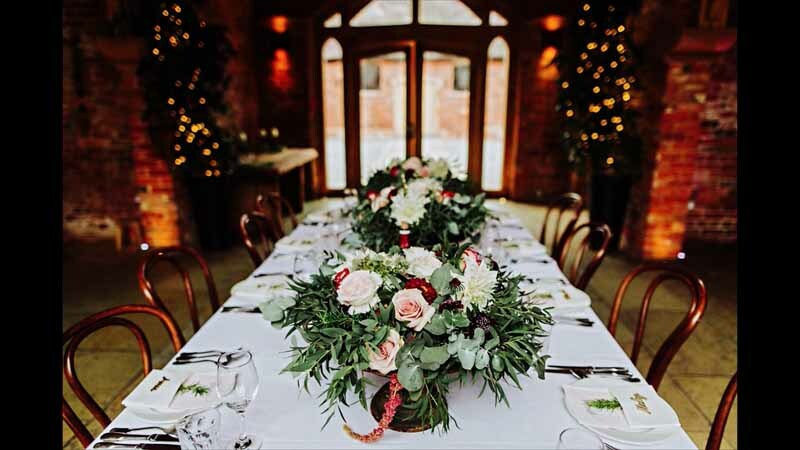 Charlotte and Brad chose Gemma Williams to capture their church wedding at Shustoke Farm Barns, what a lovely set of images to savour. 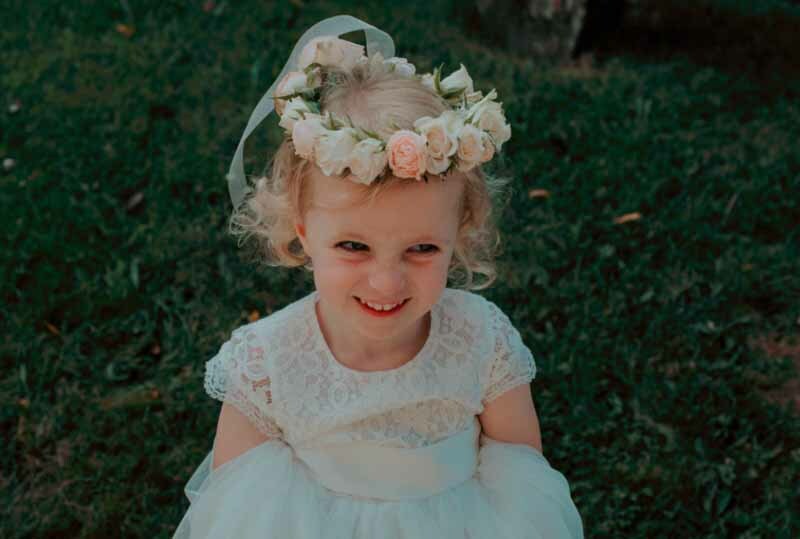 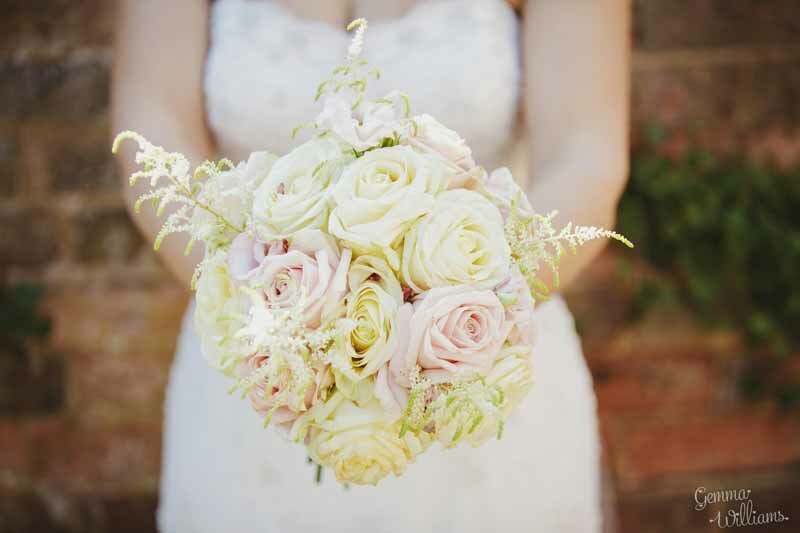 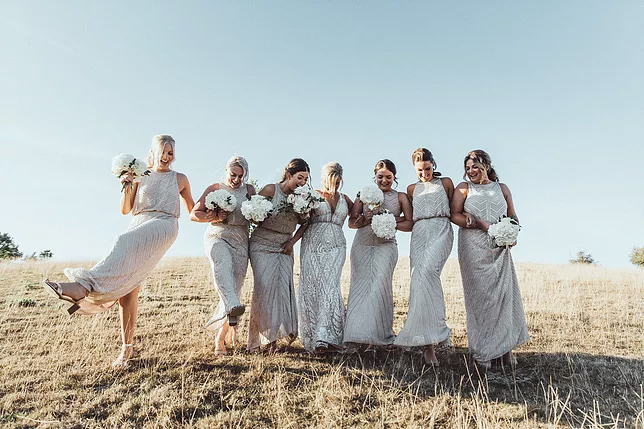 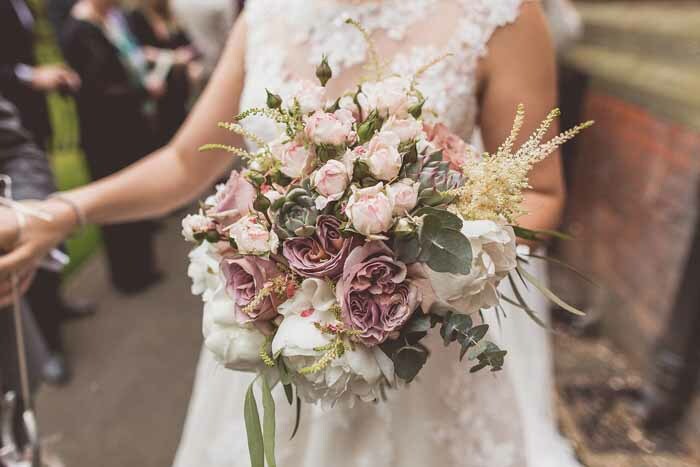 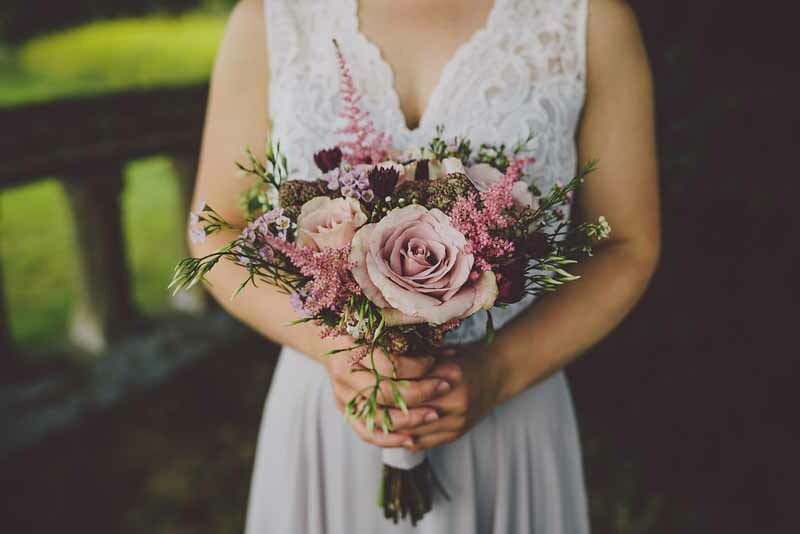 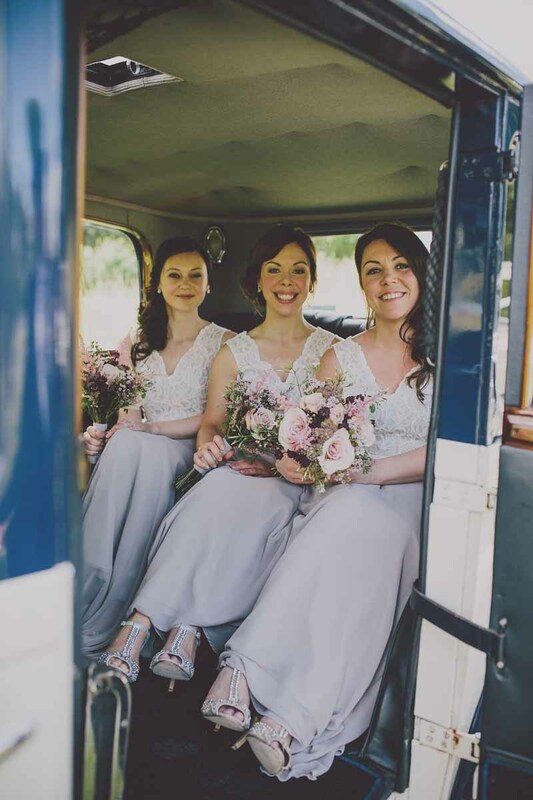 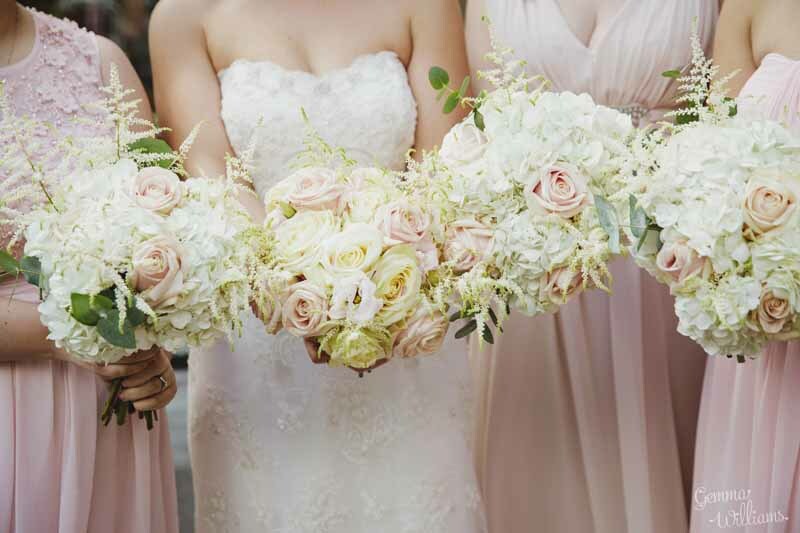 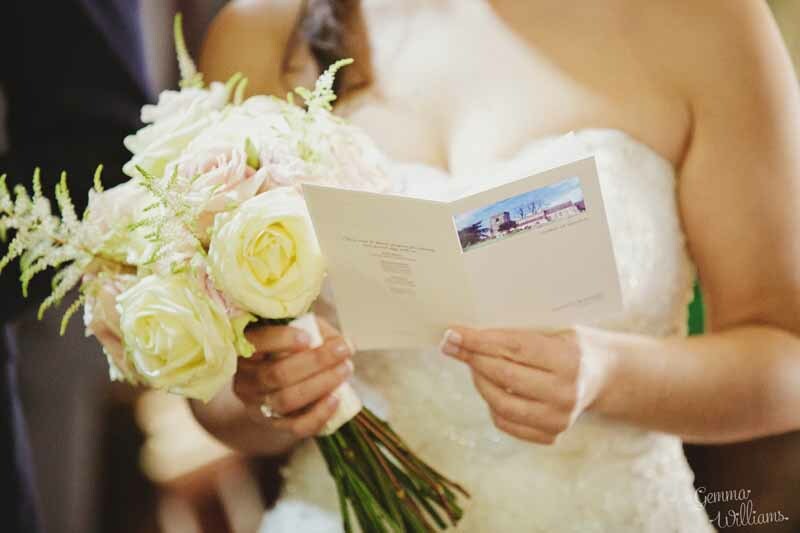 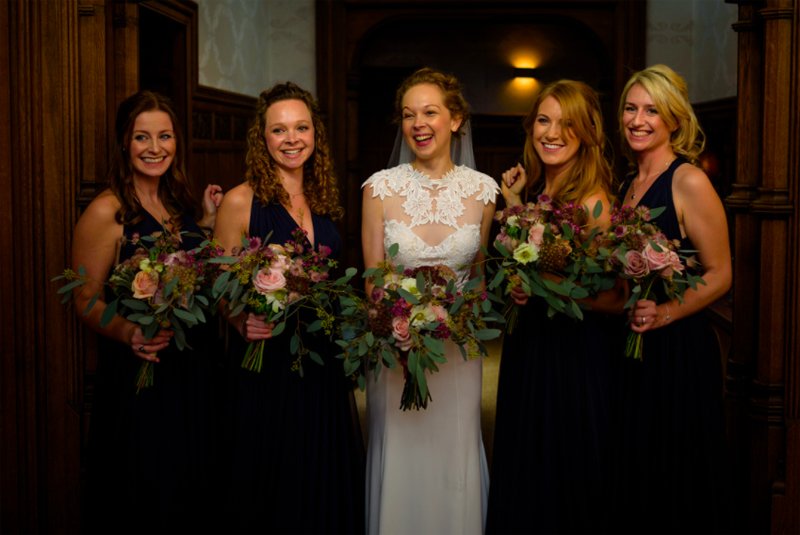 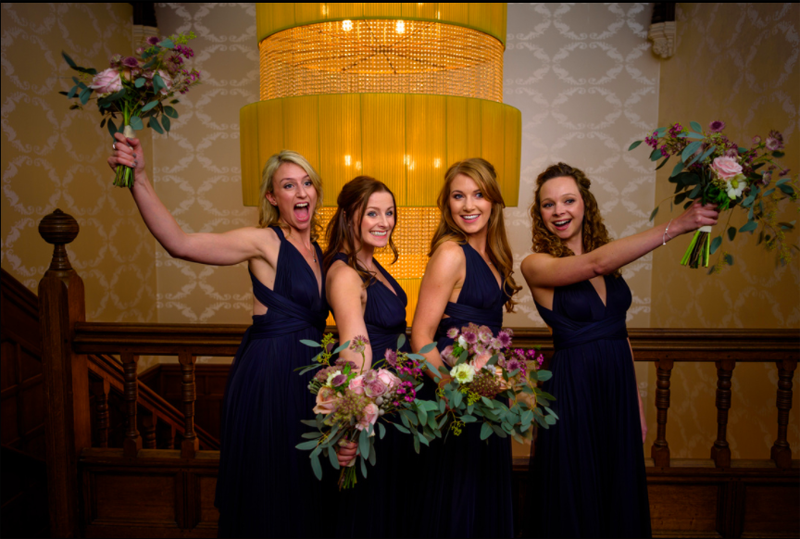 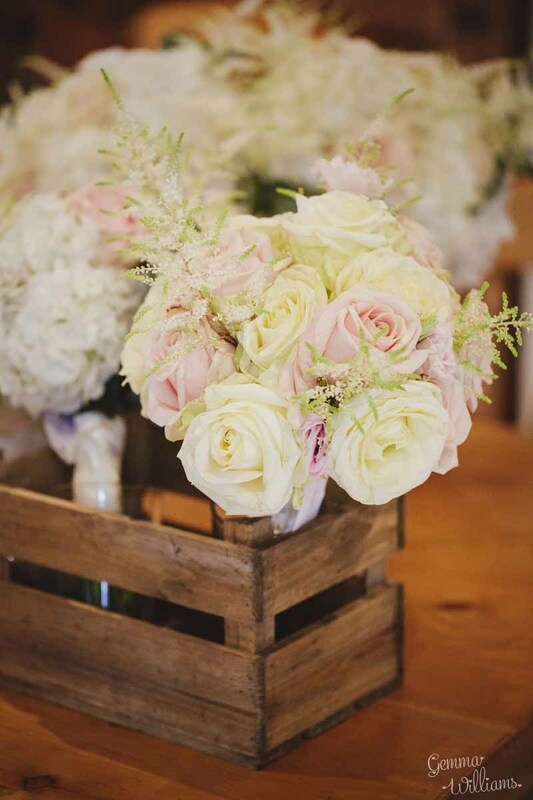 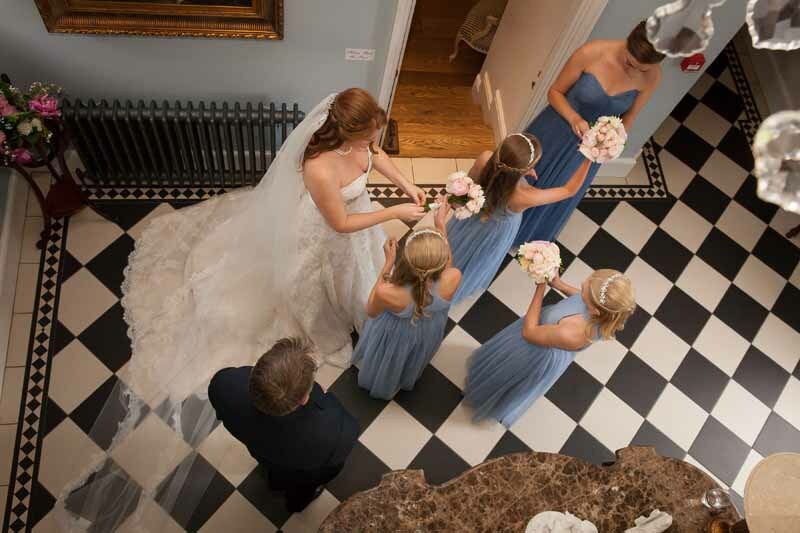 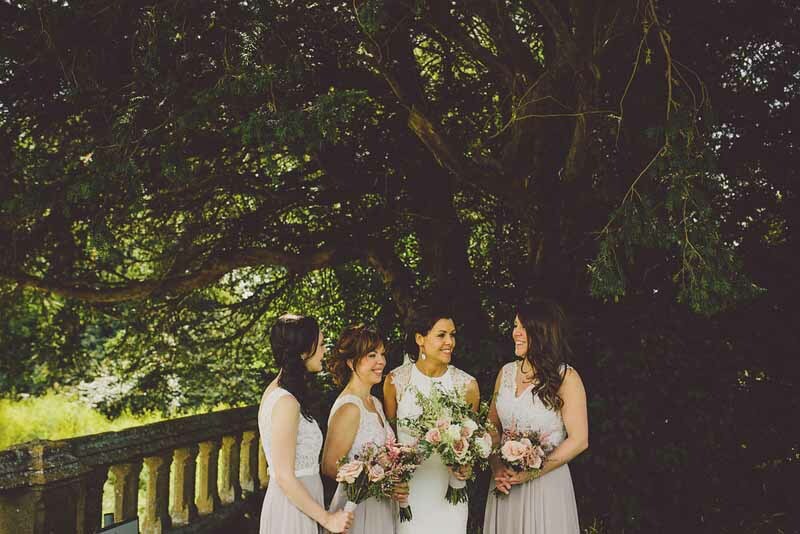 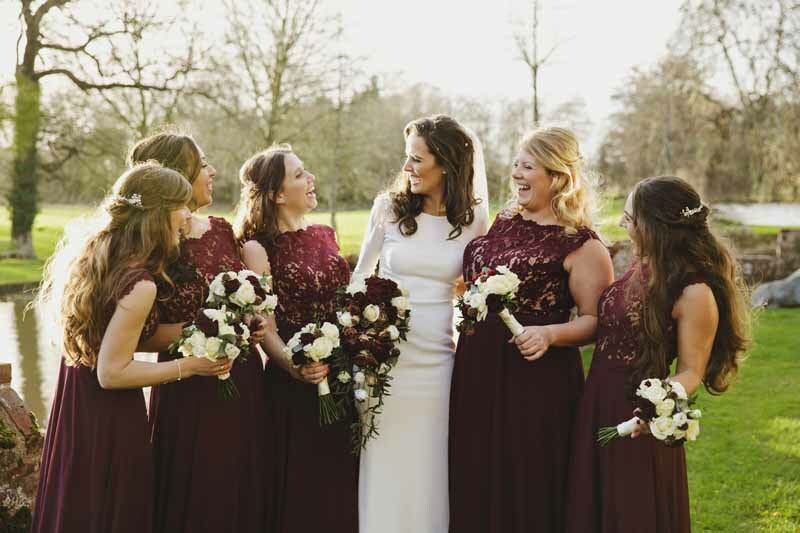 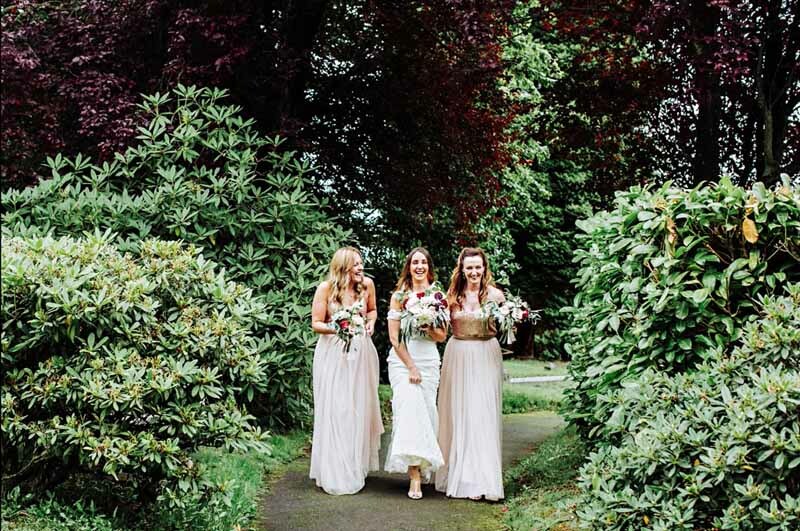 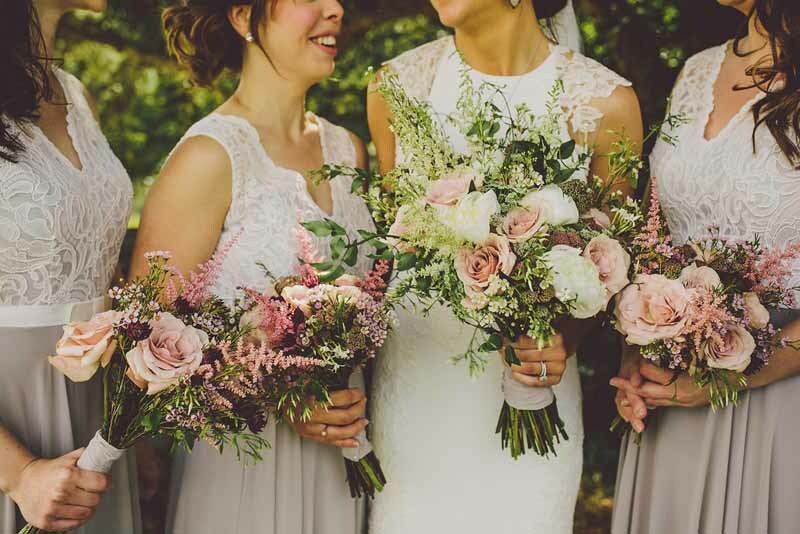 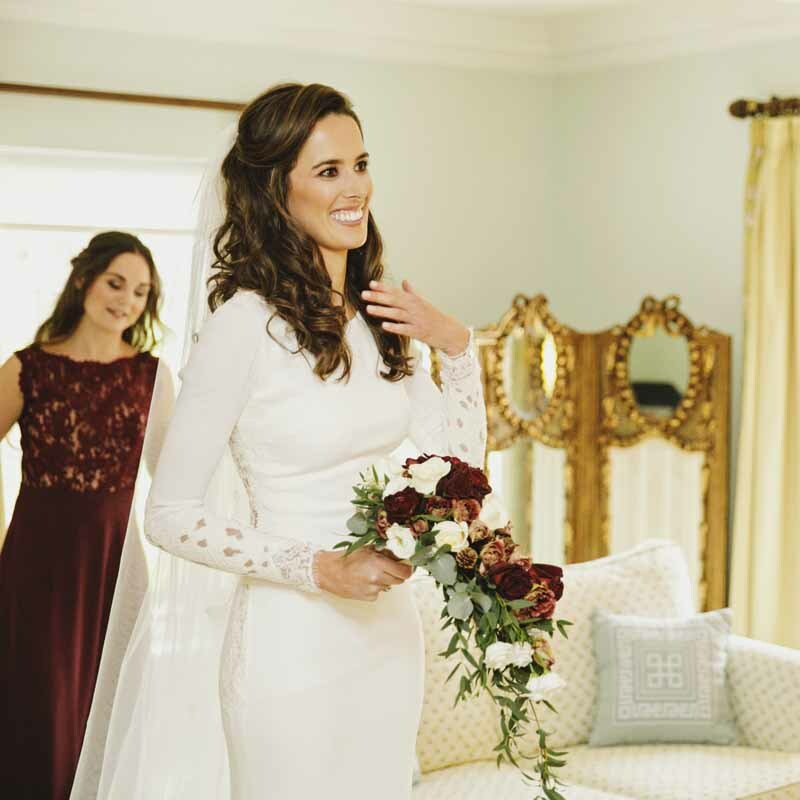 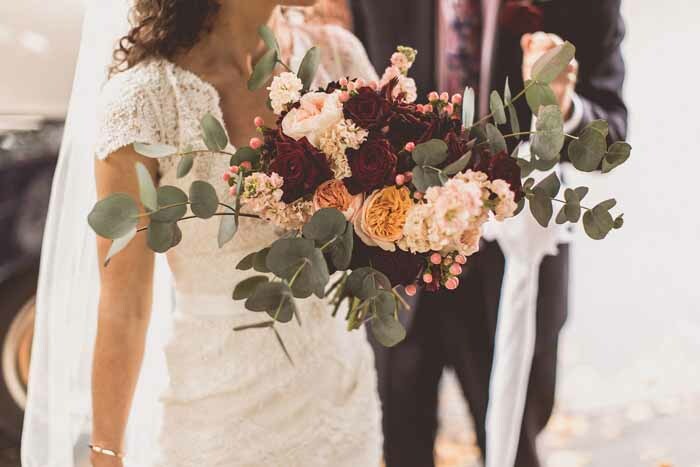 Charlotte and her girls carried blush pink bouquets with a mix of blooms. 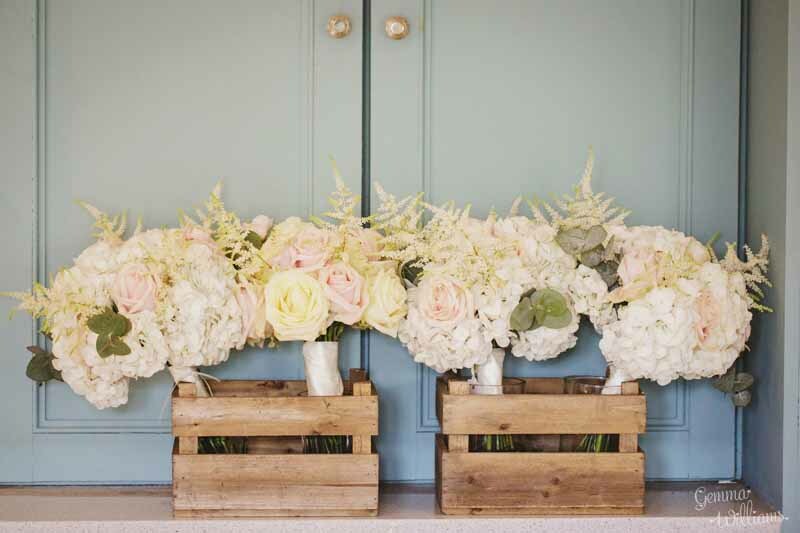 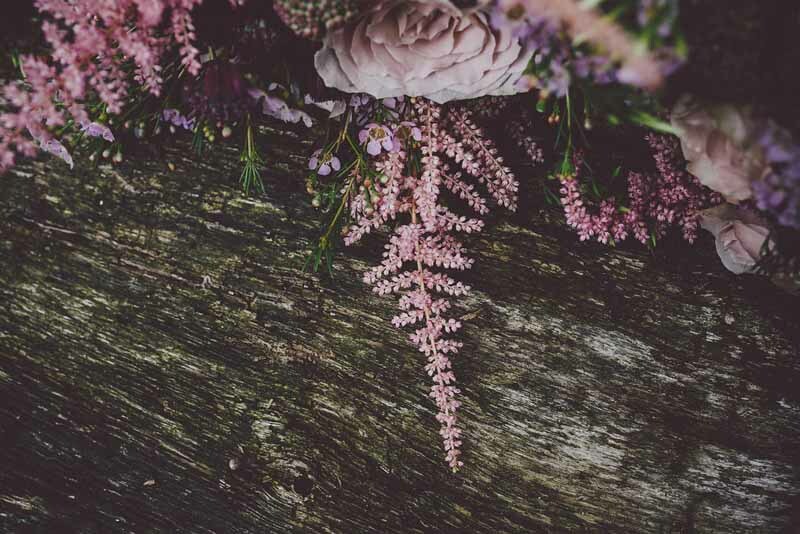 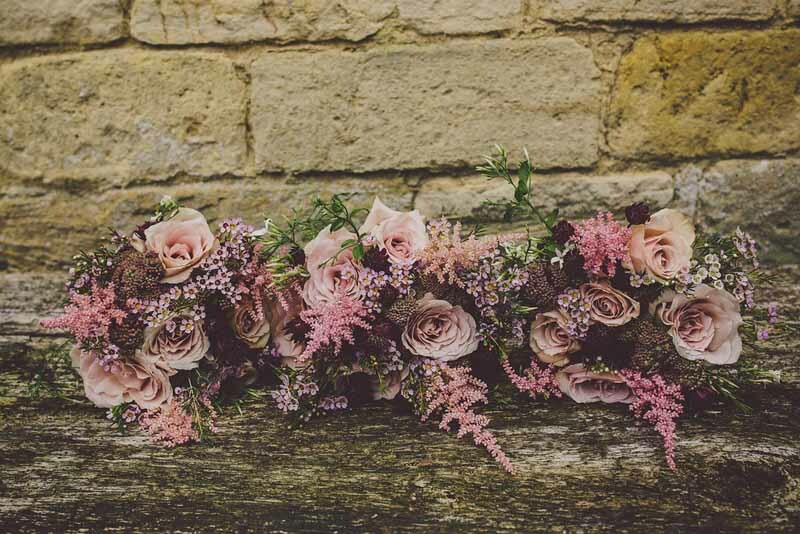 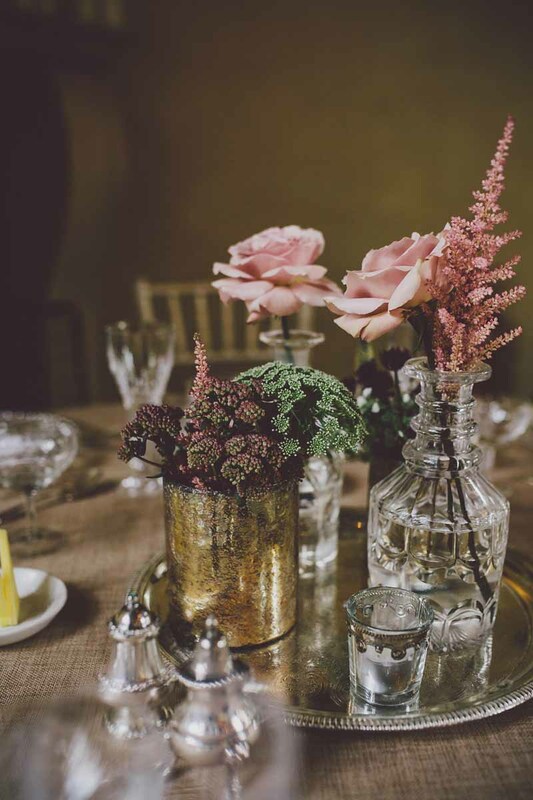 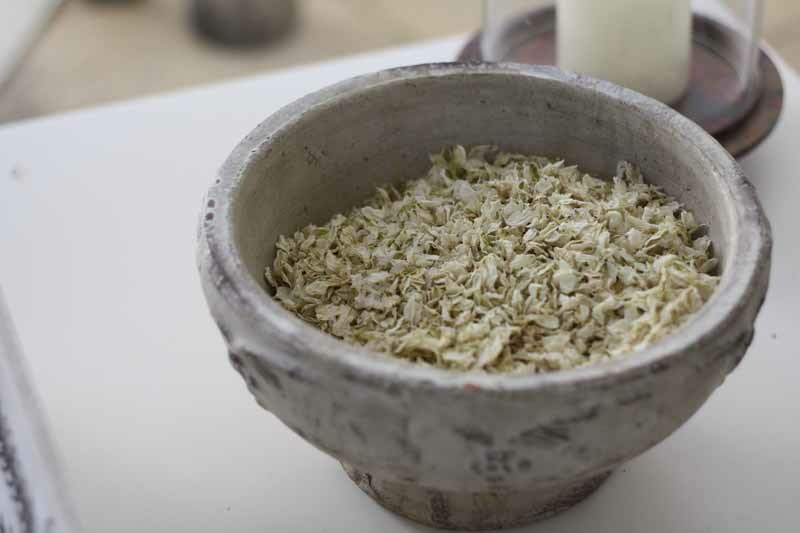 Feathery astilbe is perfect for a bit of texture to a rustic bouquet. 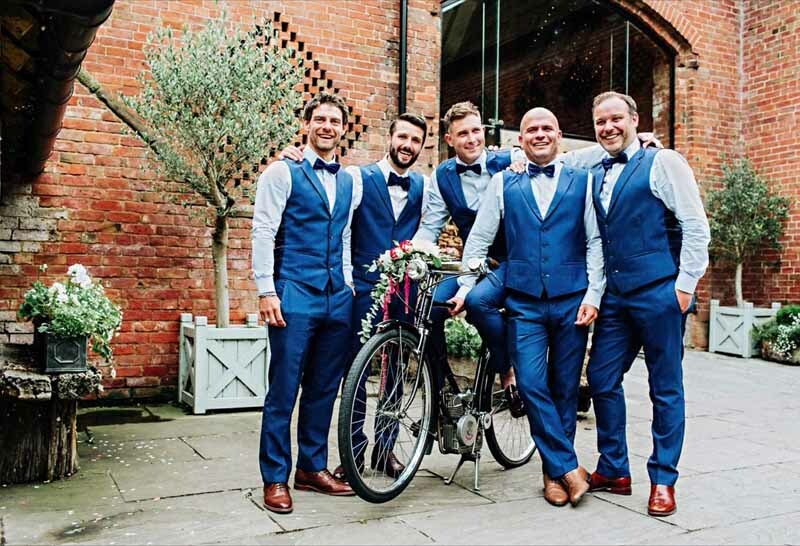 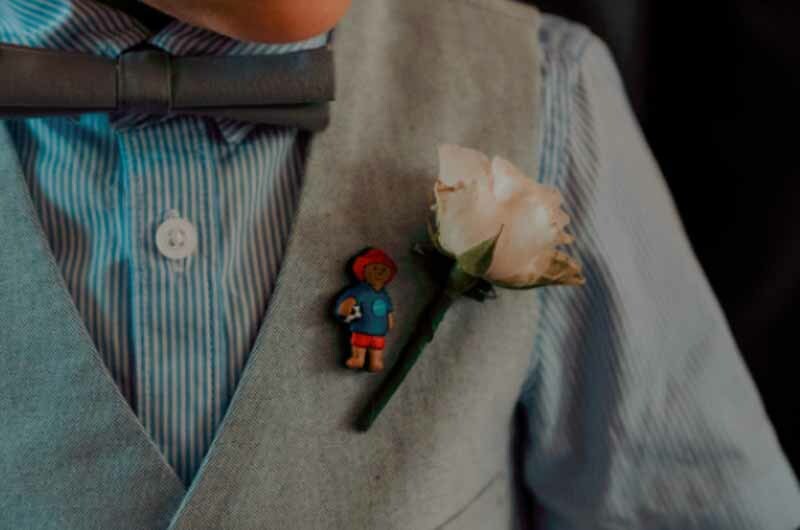 The boys wore spring button holes to complement the boouquets. 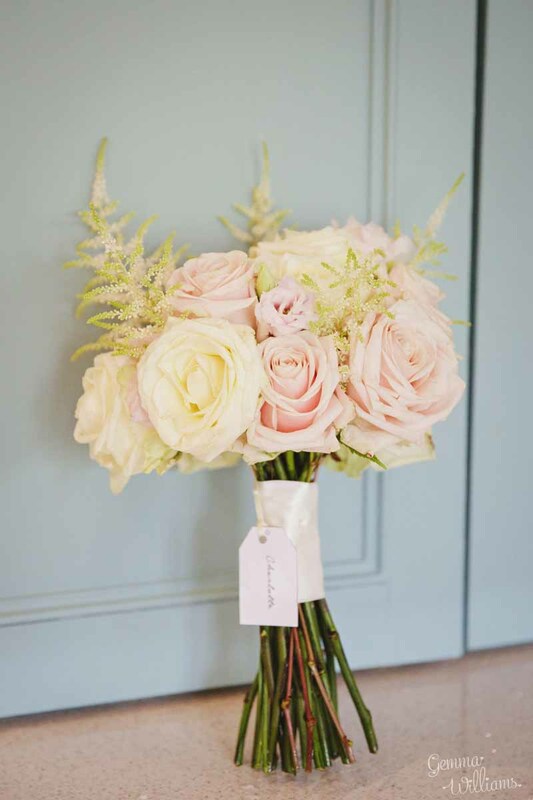 For the ladies astilbe was added to the blush pink roses. 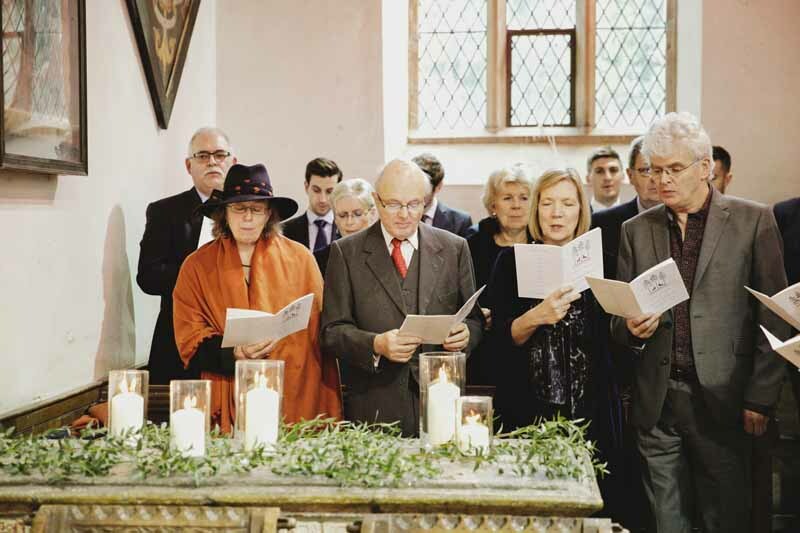 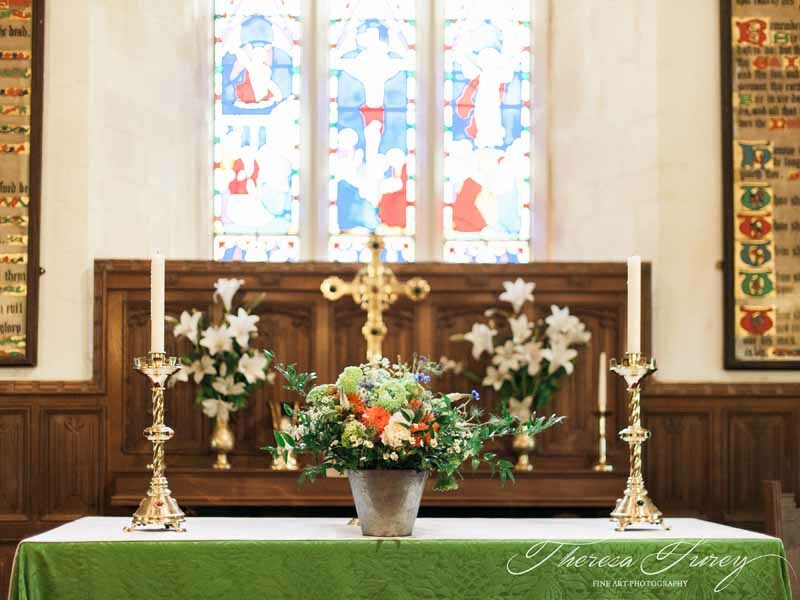 The country church at Bishops Tachbrook was dressed for spring with a mass of daffodils. 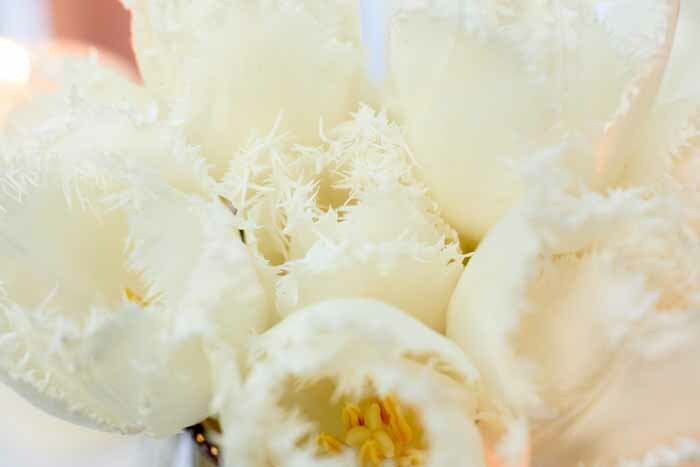 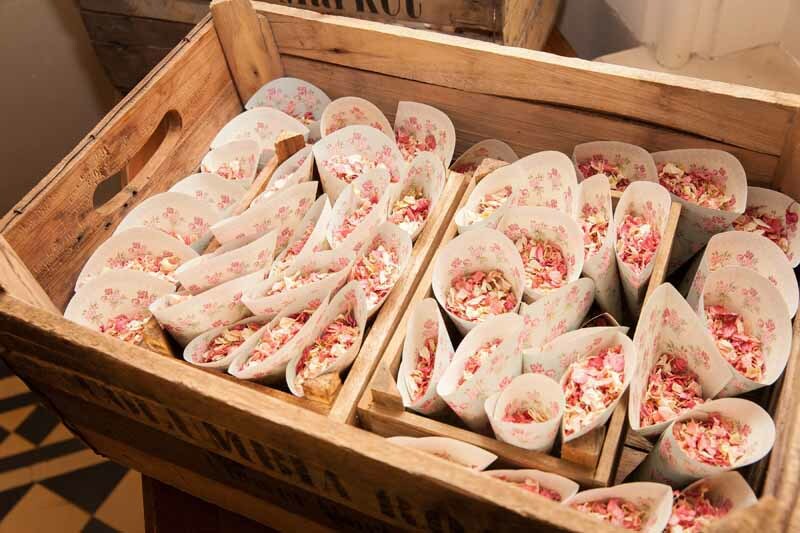 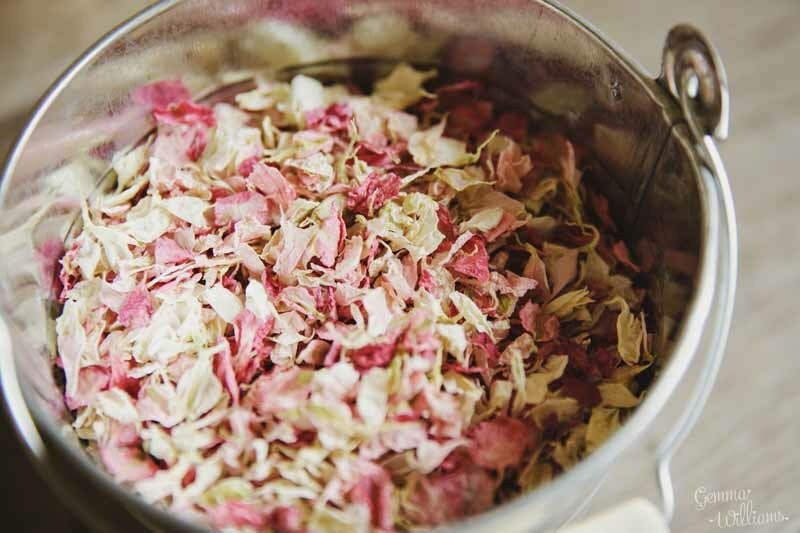 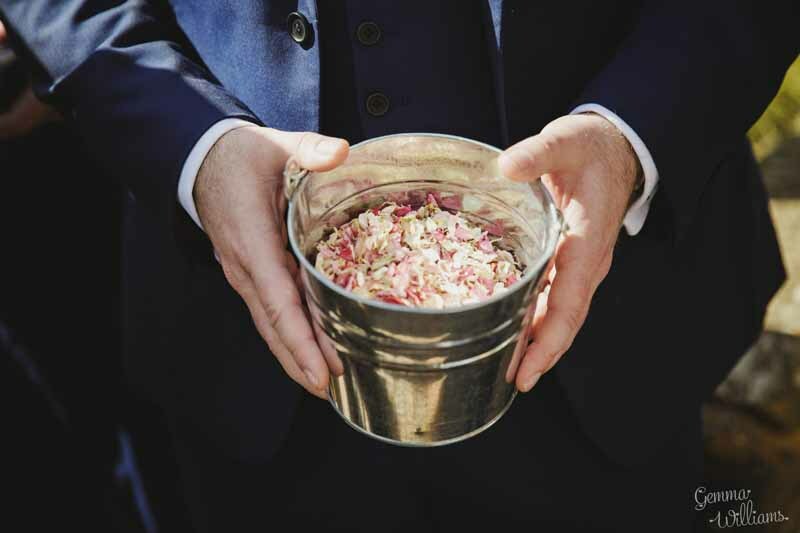 The blush pink confetti petals were soft and scented. 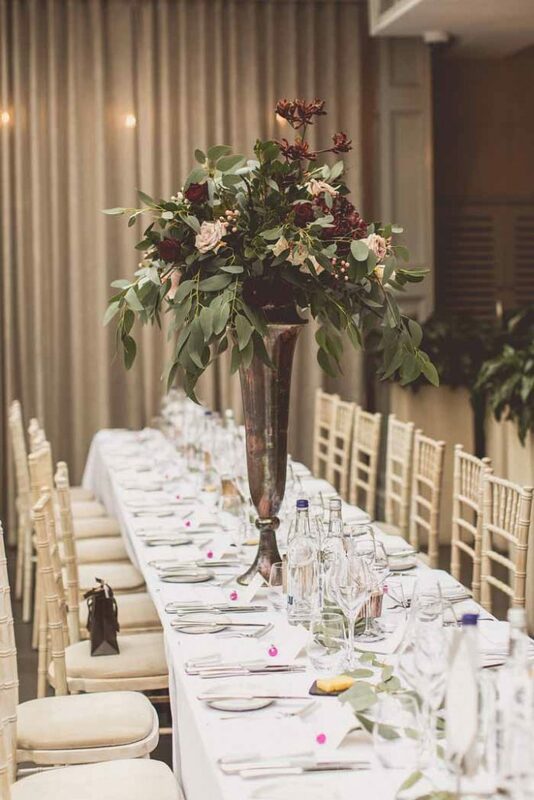 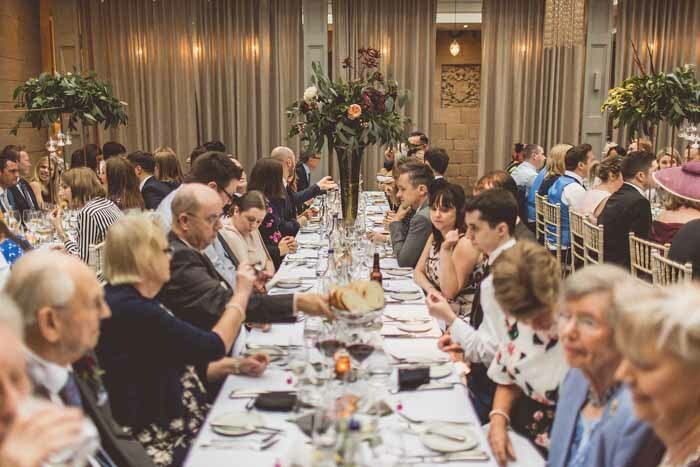 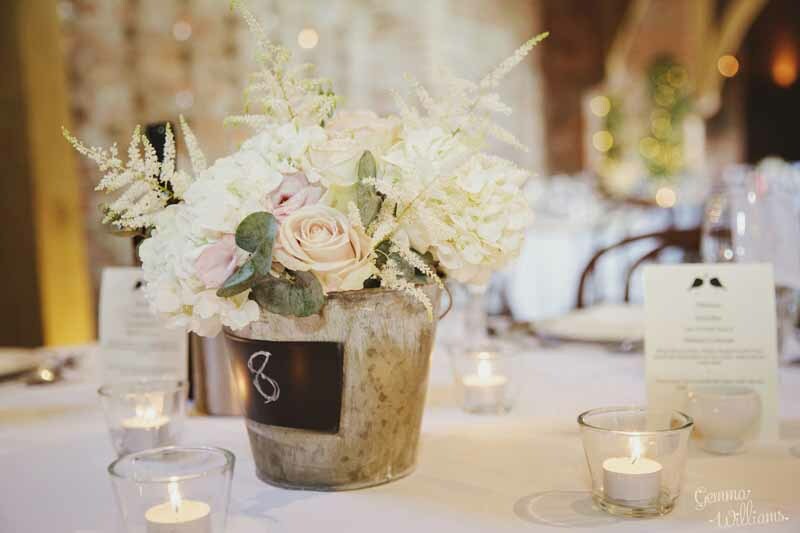 Blackboarad buckets make great centrepieces for a rustic wedding and the guests were gifted the arrangements at the end of the evening. 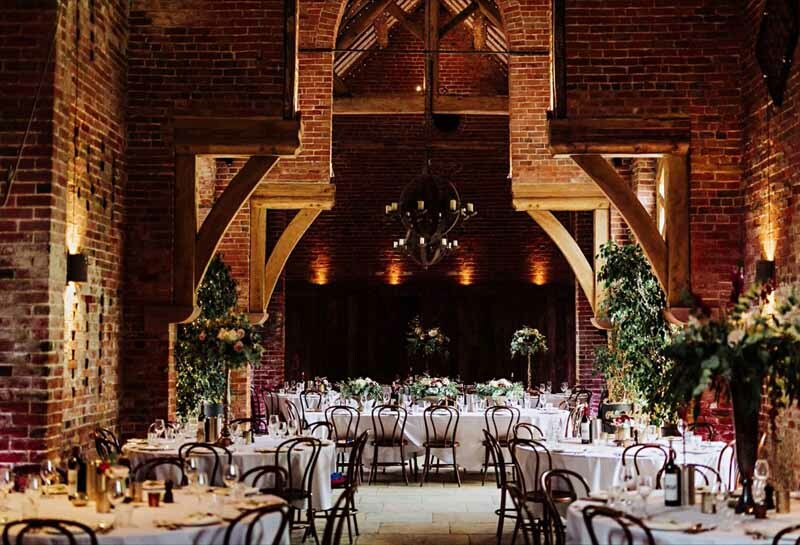 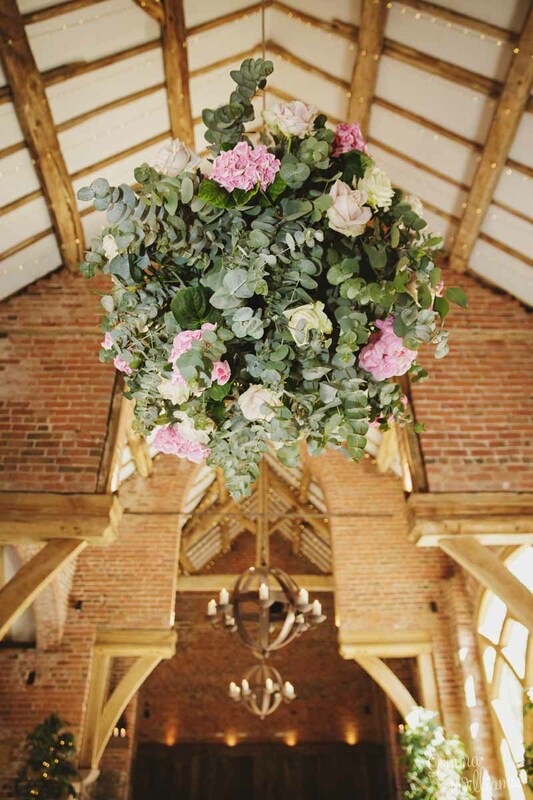 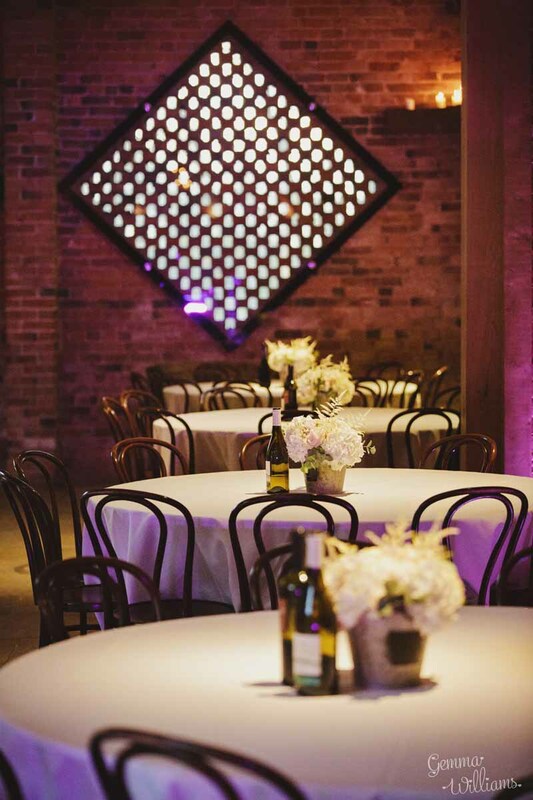 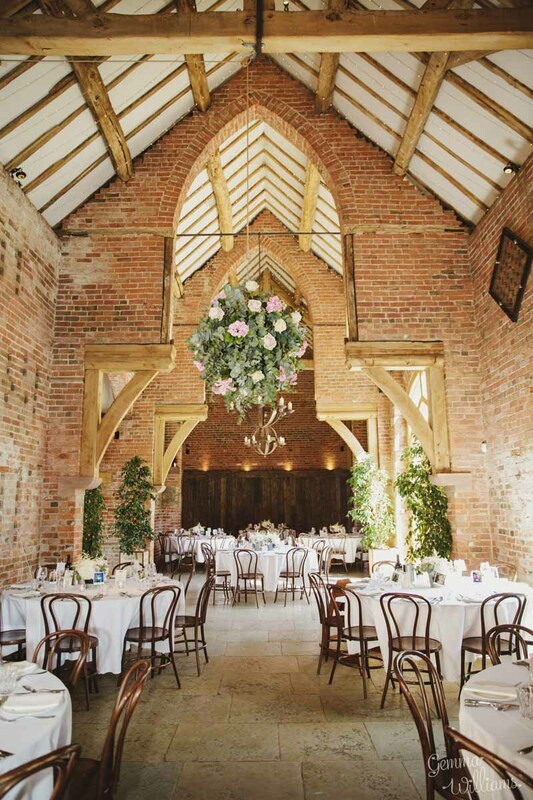 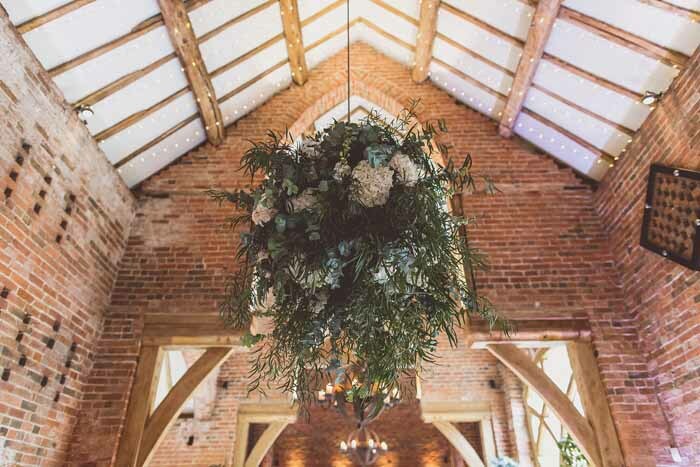 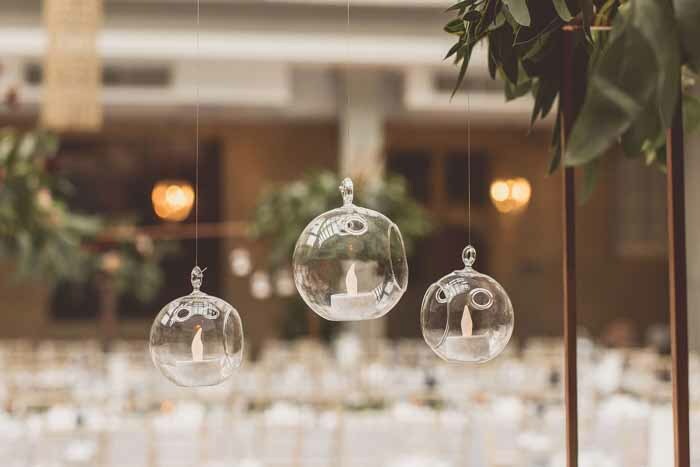 Pink hydragea were added to the hanging flower globes to create a romantic look to the barn. 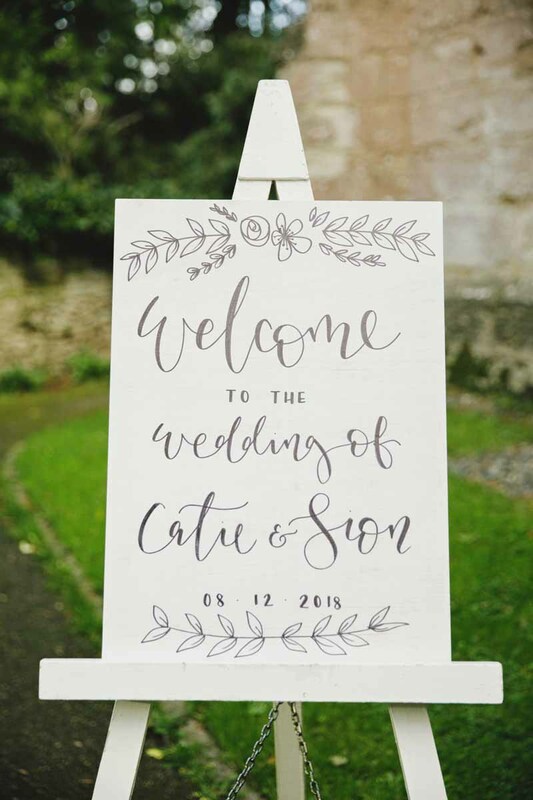 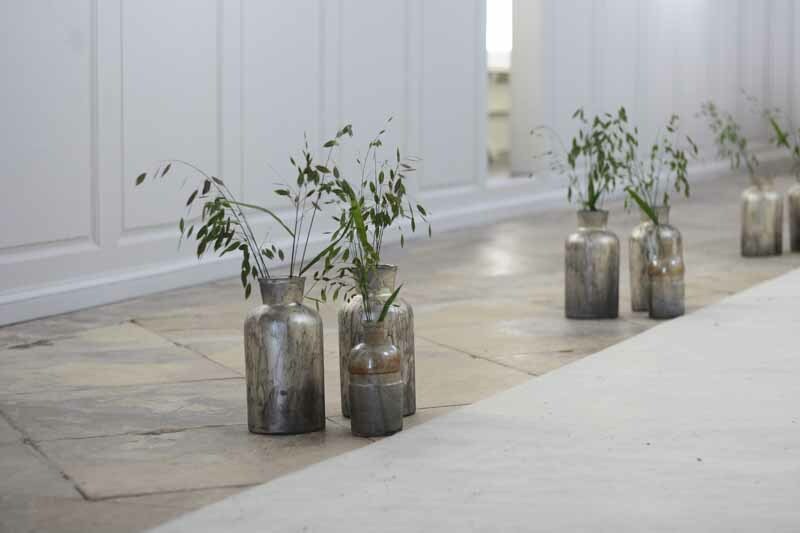 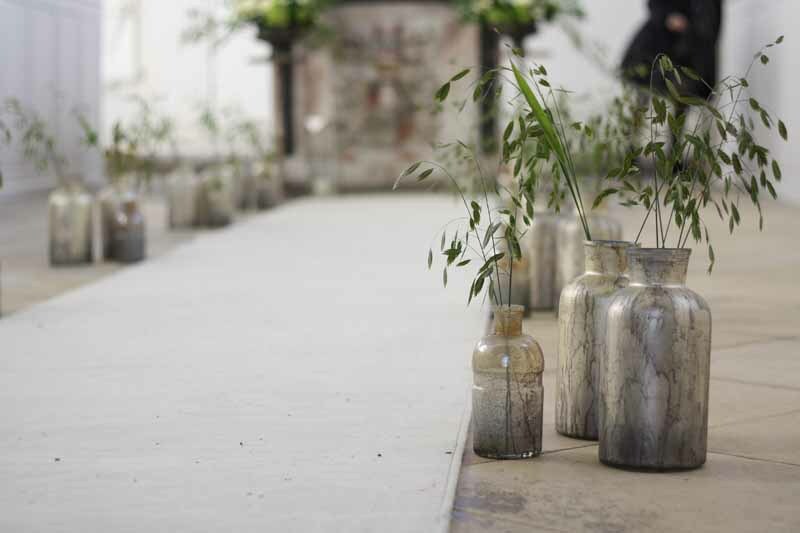 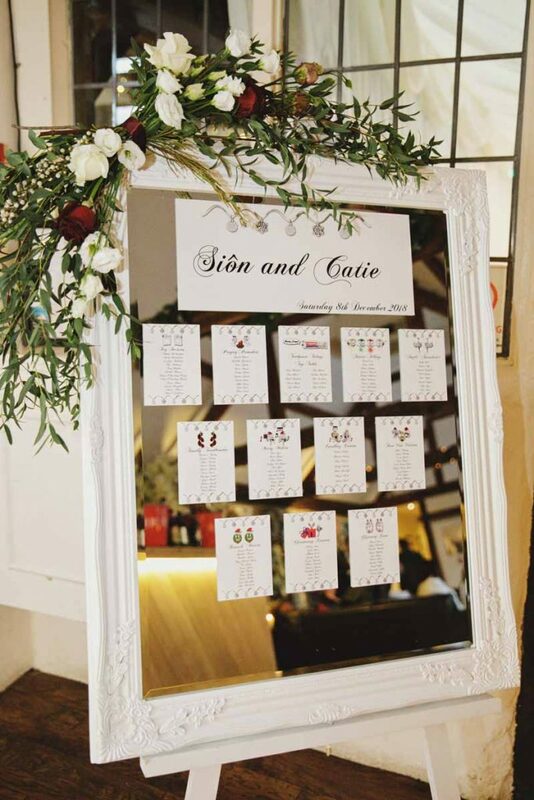 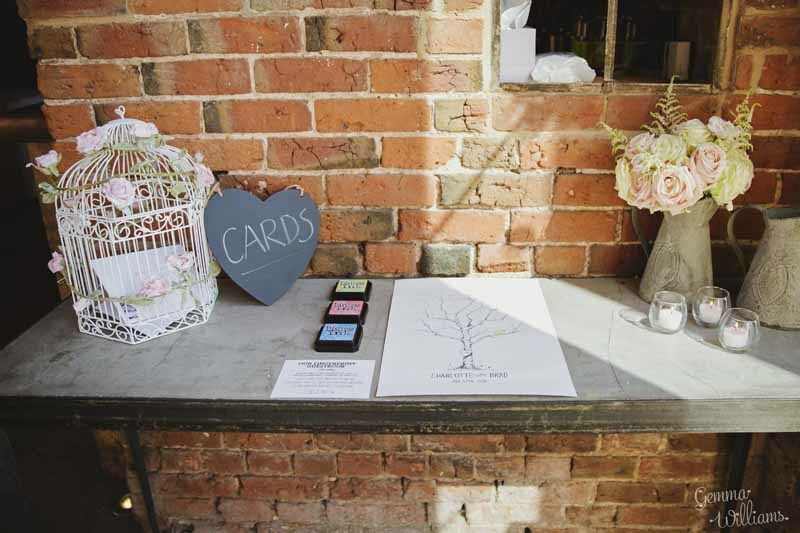 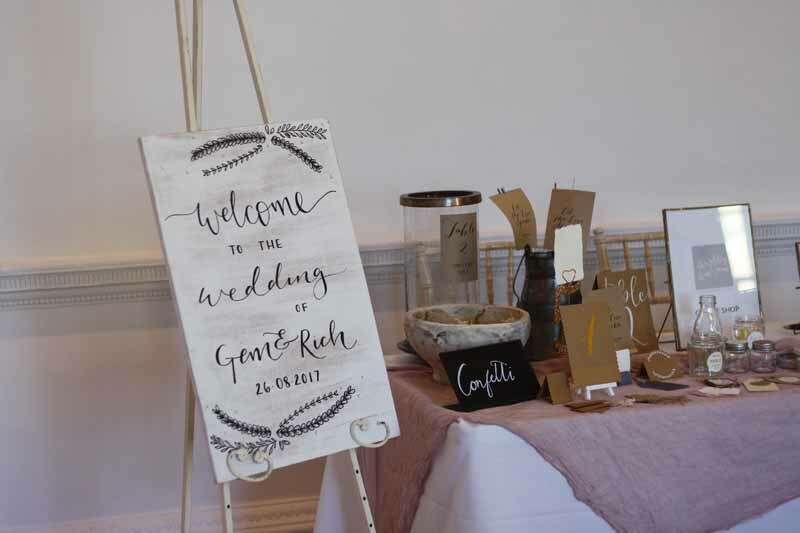 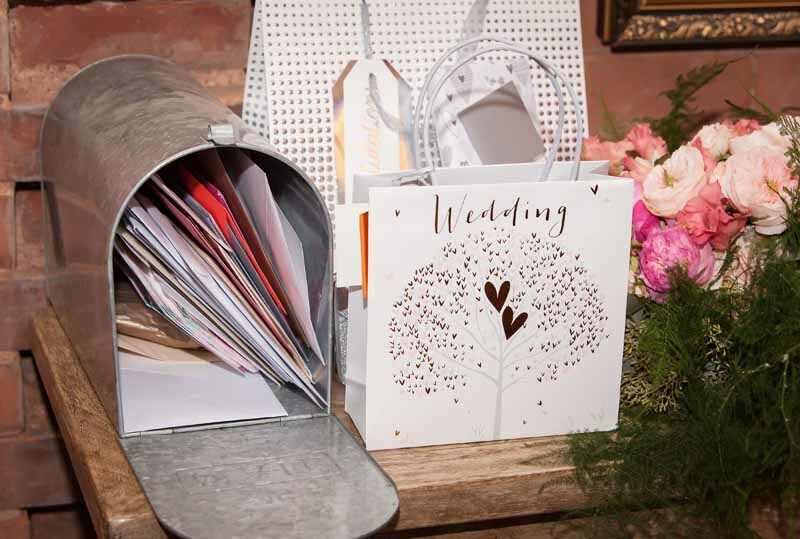 Rustic grey jugs were added to the card and guest book tables to keep the bouquets fresh. 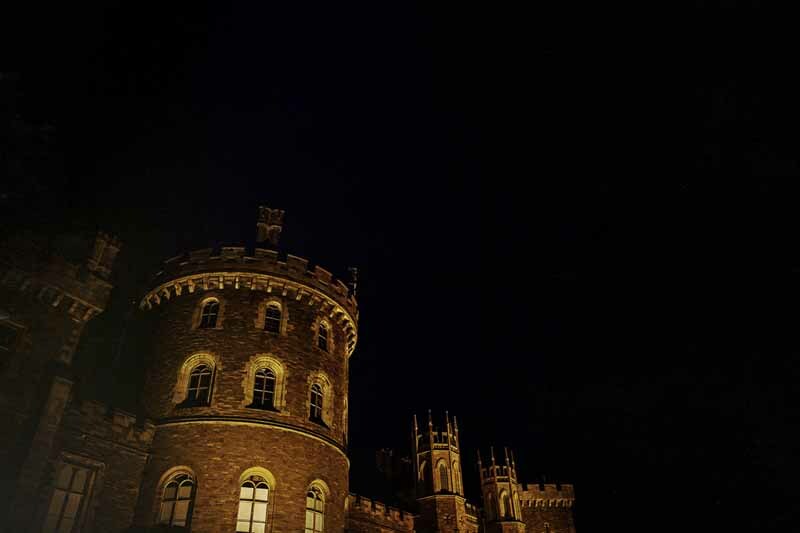 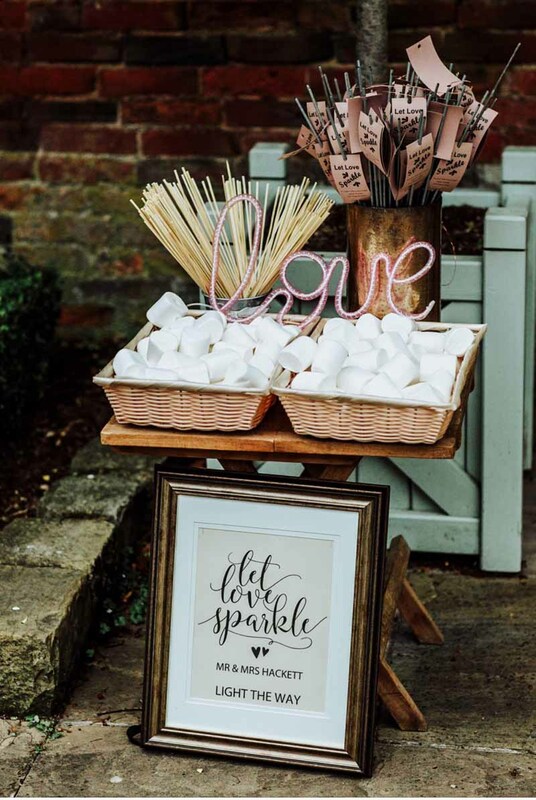 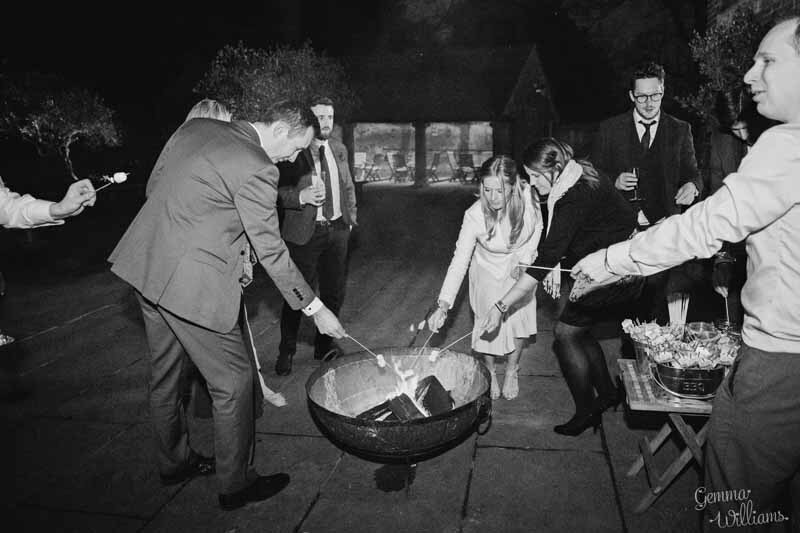 The evening entertainment included a fun photo booth and sparklers by the fire pit in the courtyard. 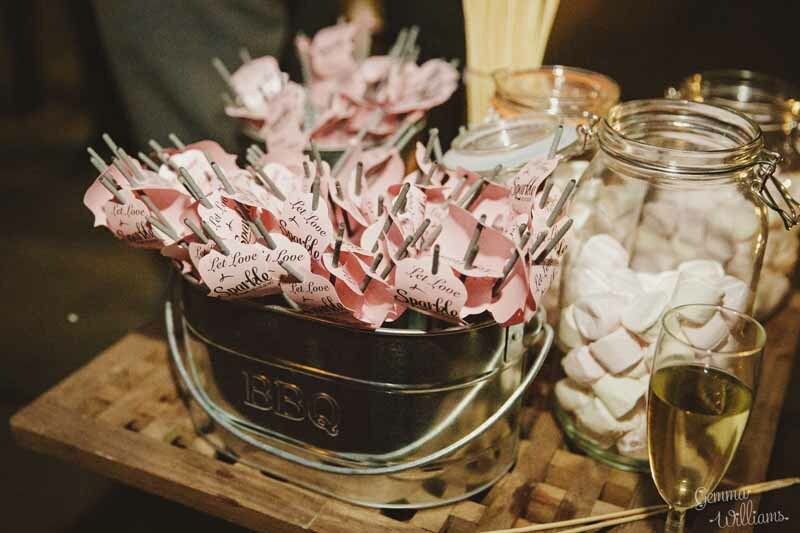 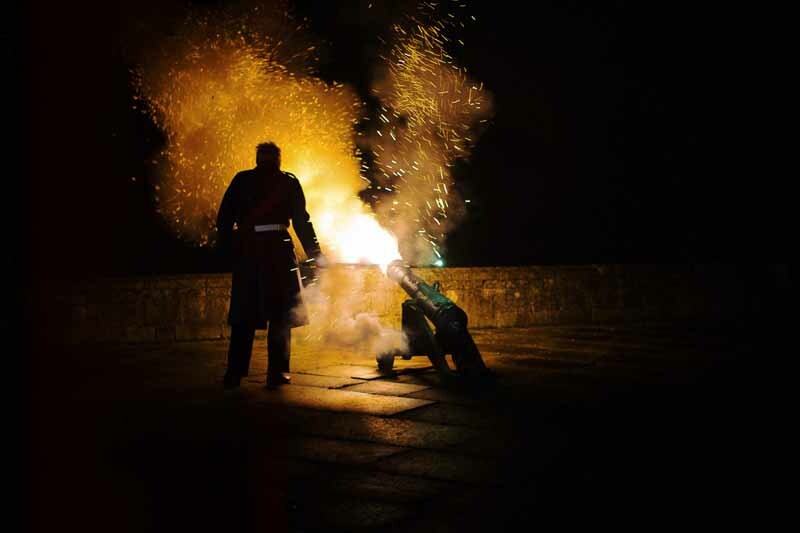 Marshmallows are always a favourite for a late night treat. 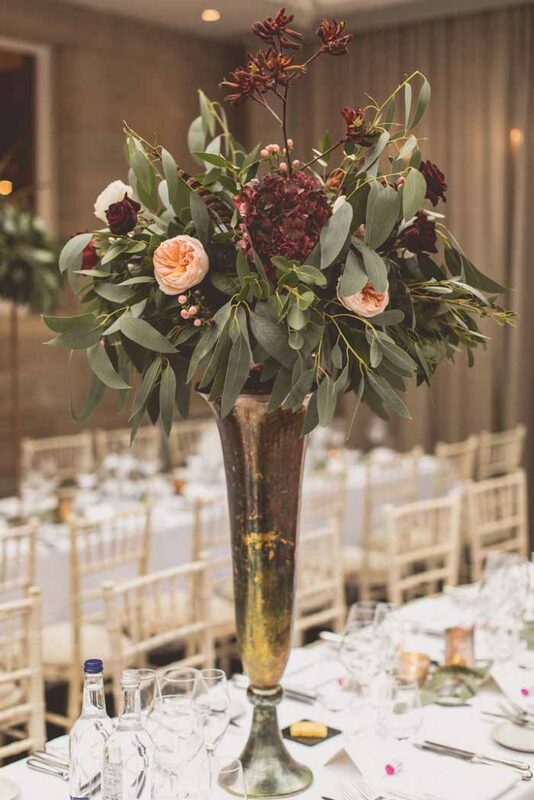 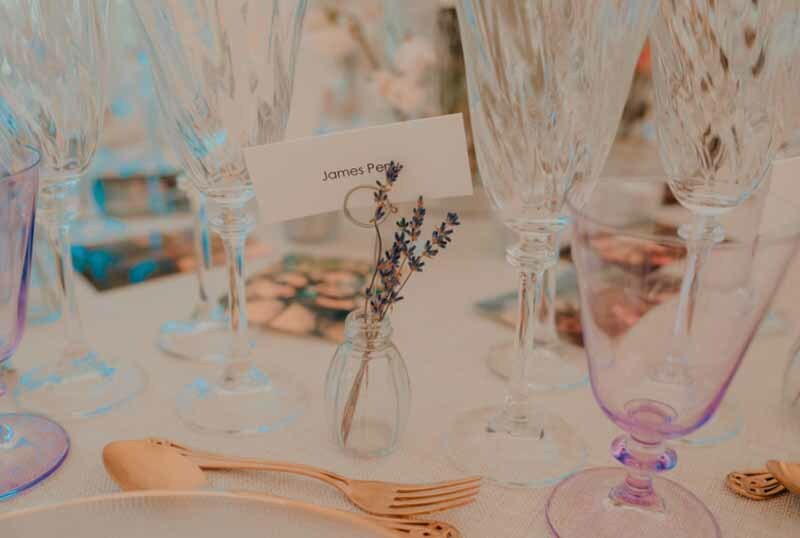 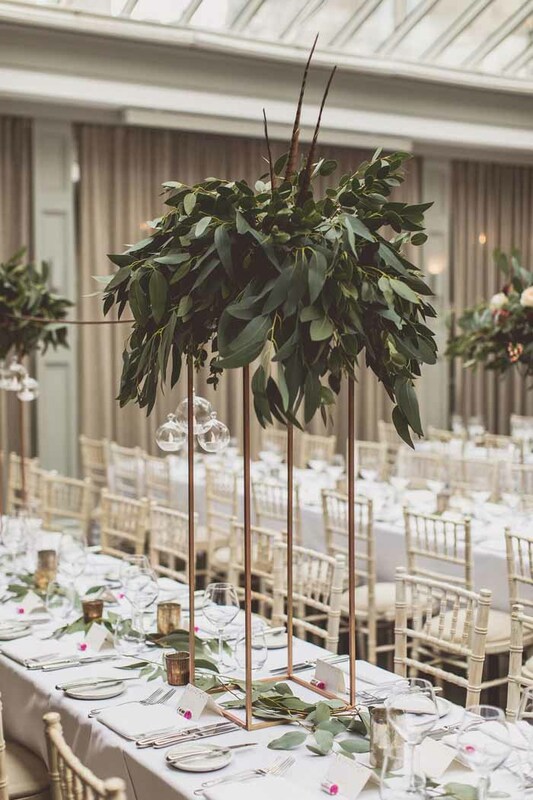 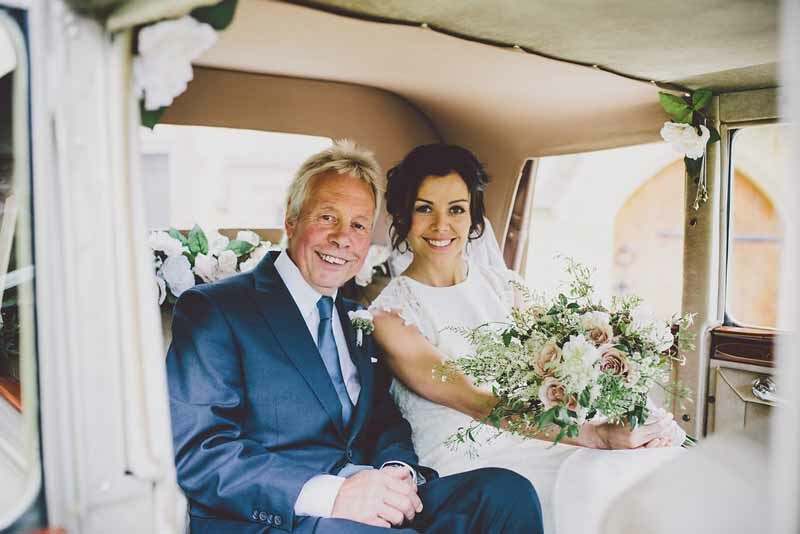 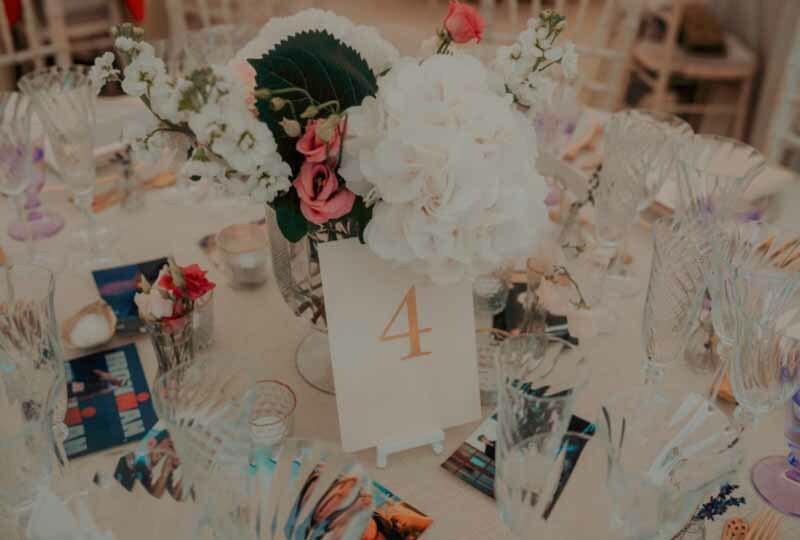 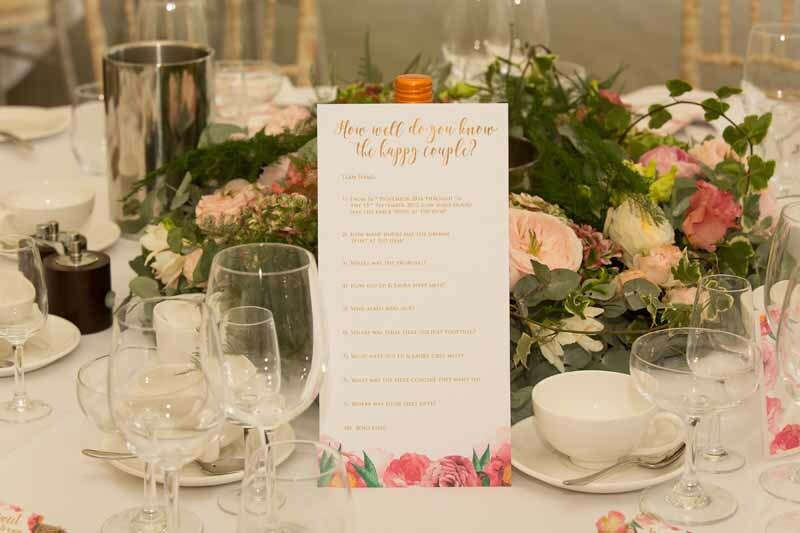 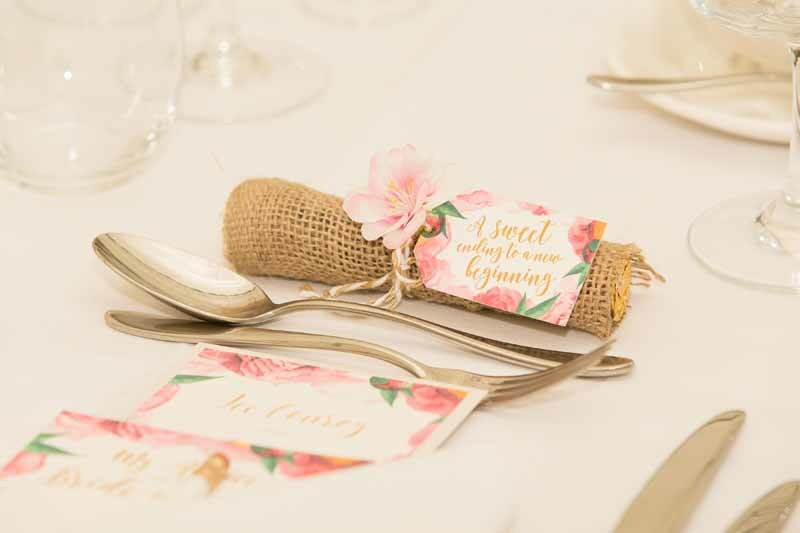 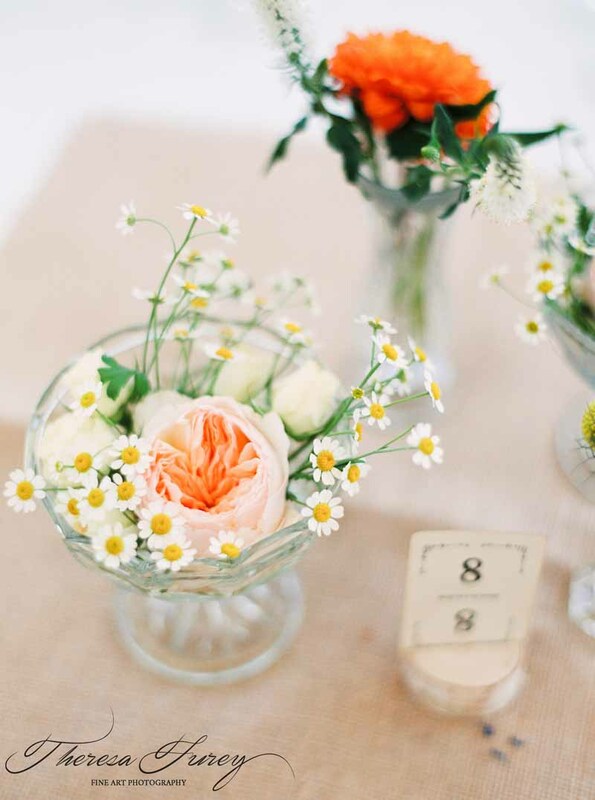 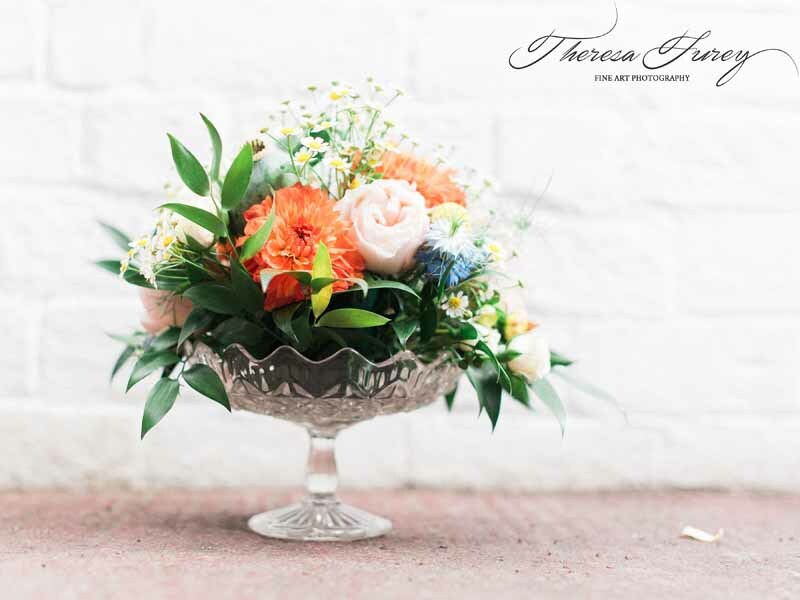 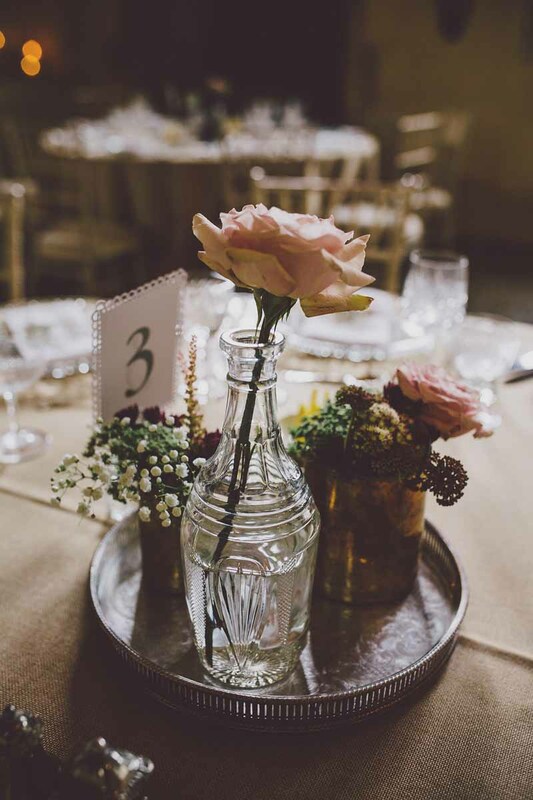 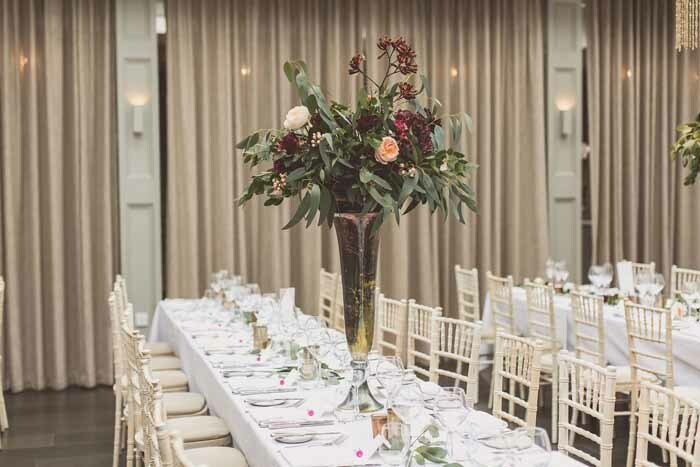 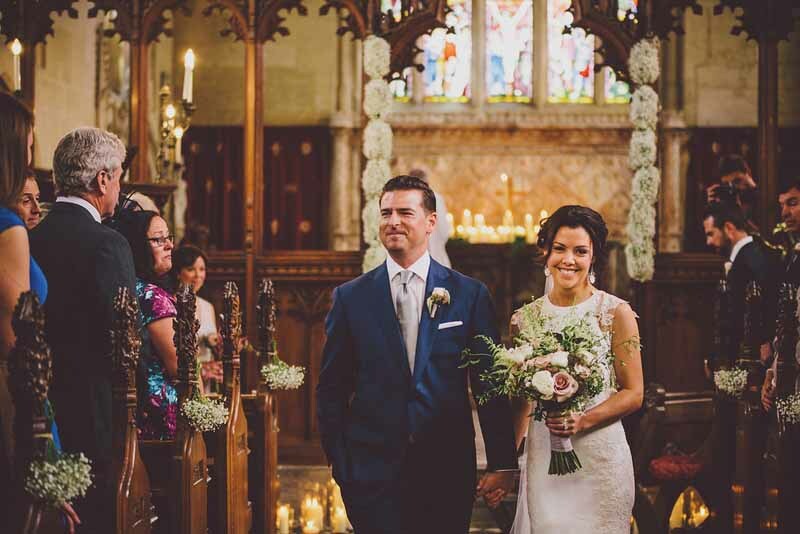 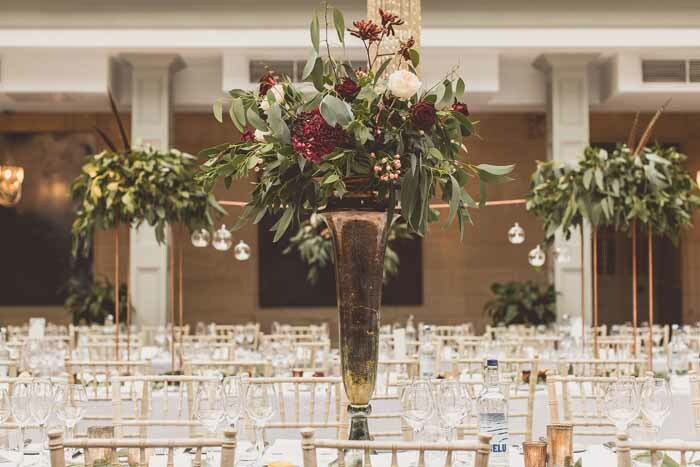 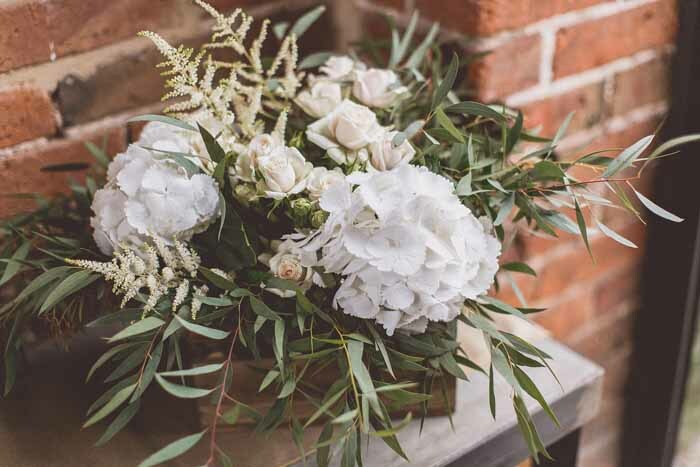 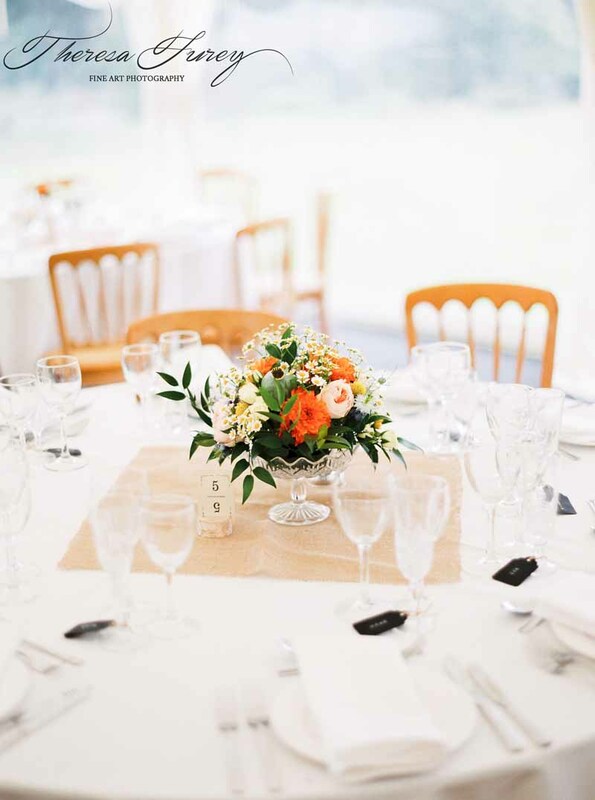 I am delighted to share these images from the most relaxed summer wedding flowers we created for Jacquie and Neil with a 60’s Rock and Roll vibe and natural looking flowers. 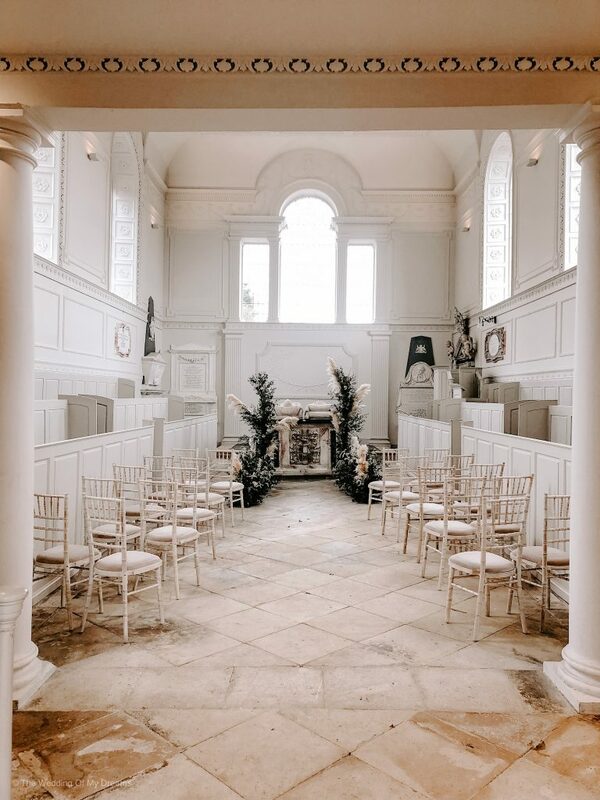 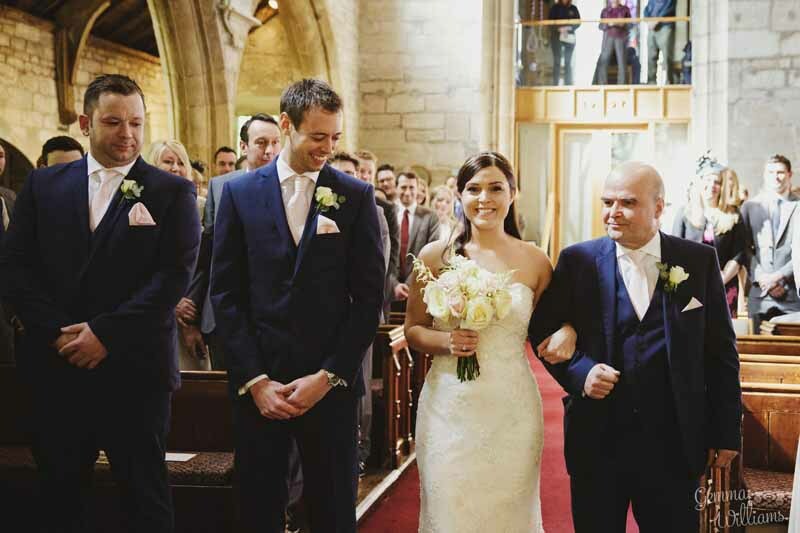 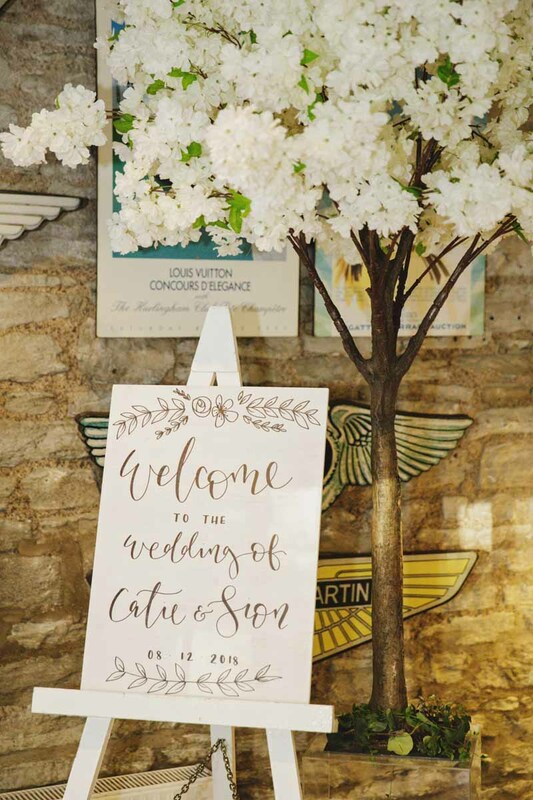 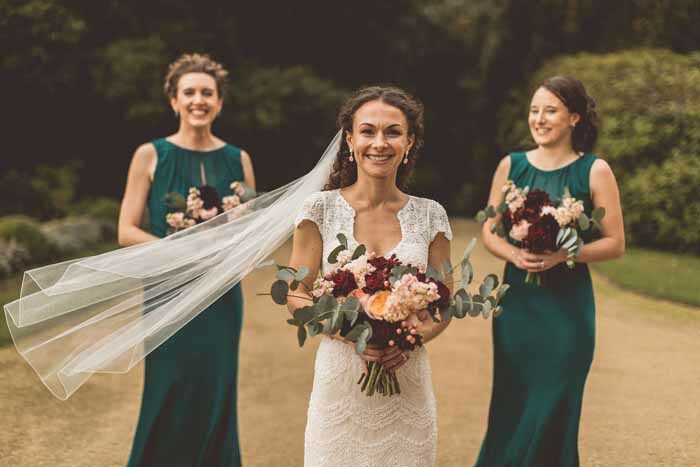 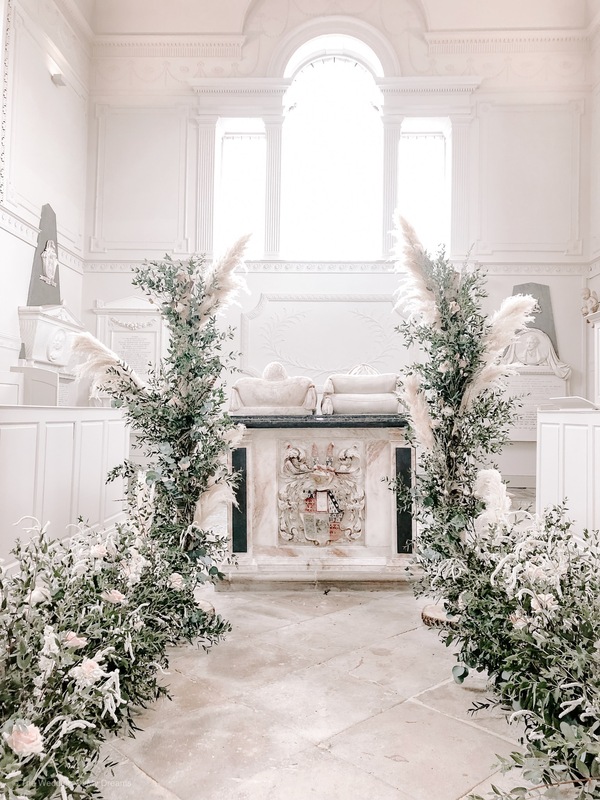 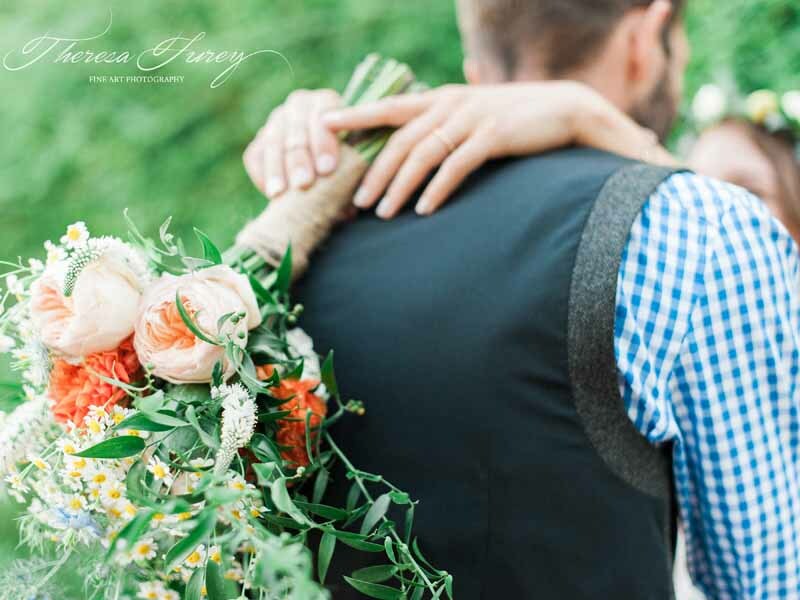 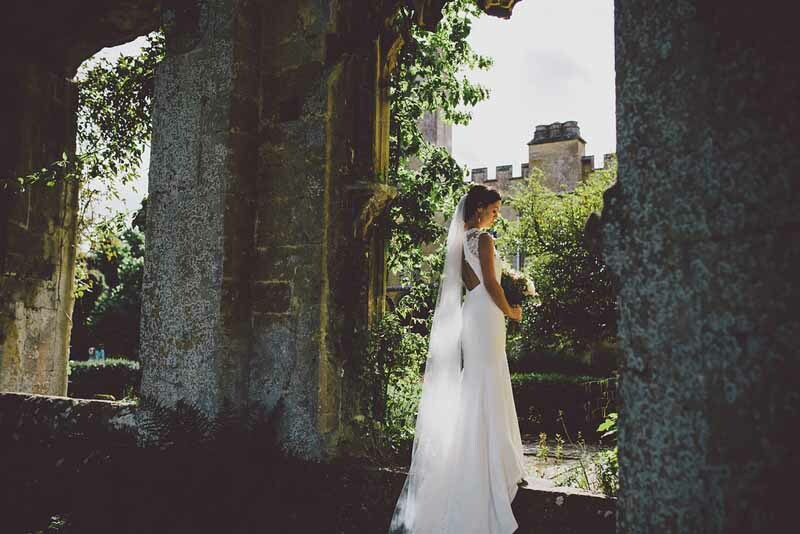 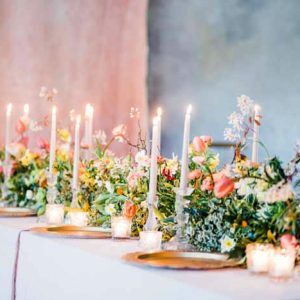 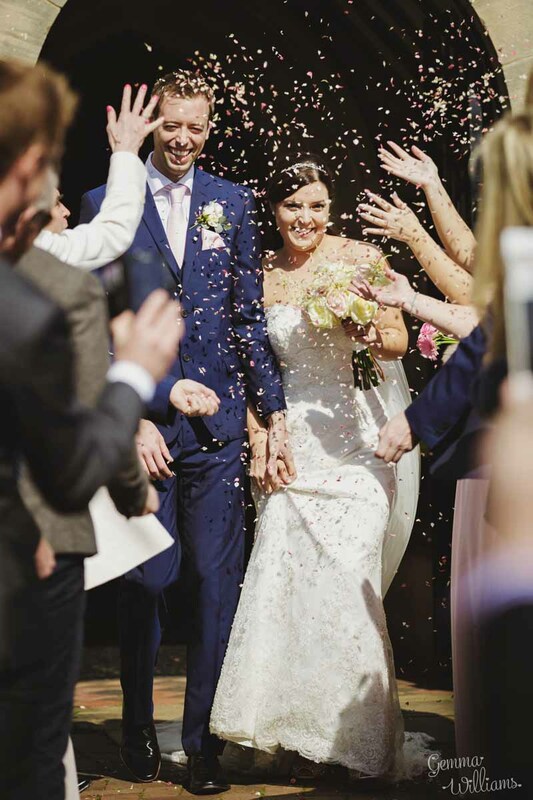 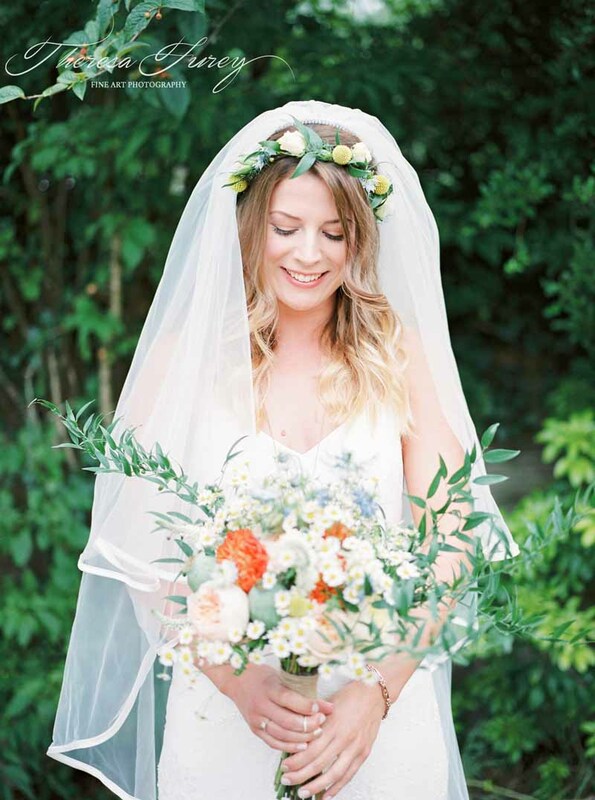 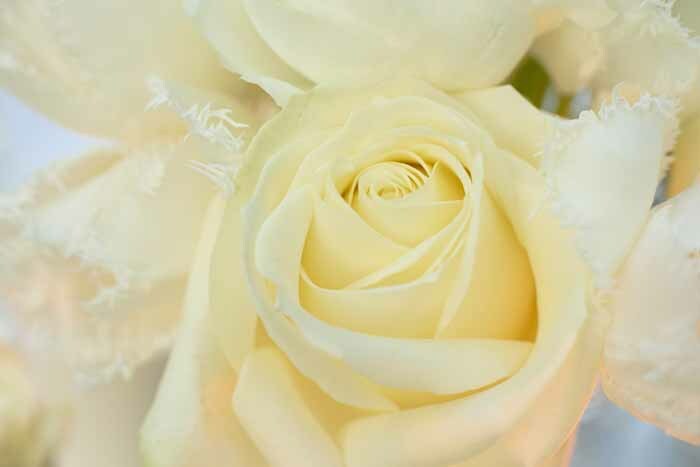 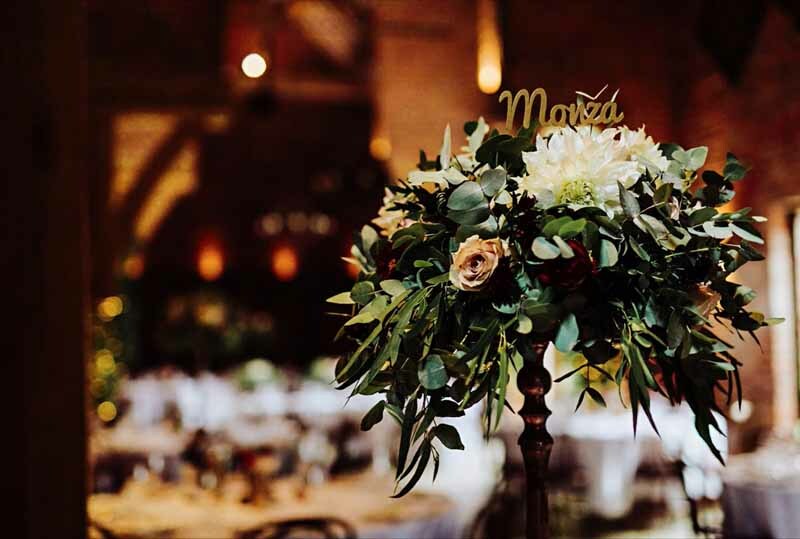 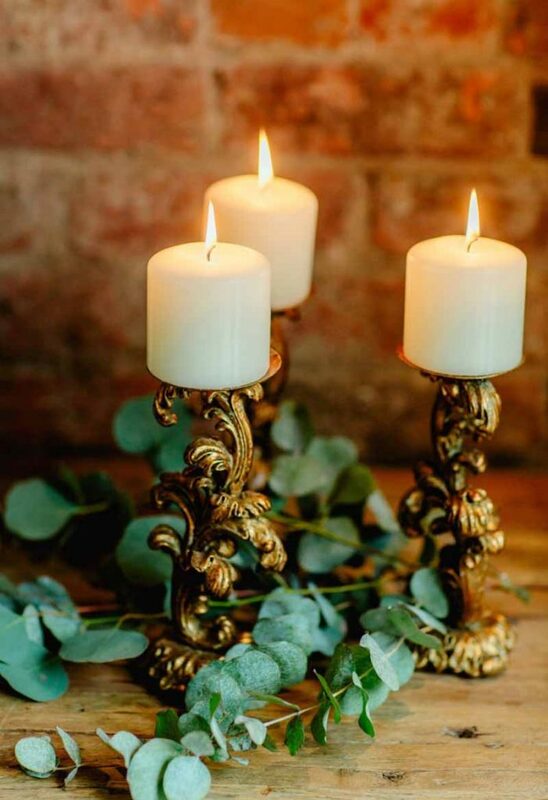 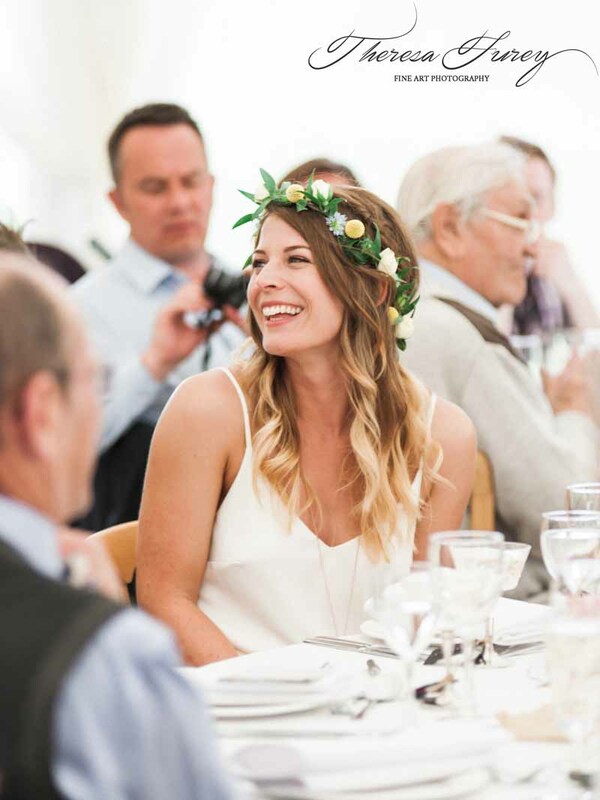 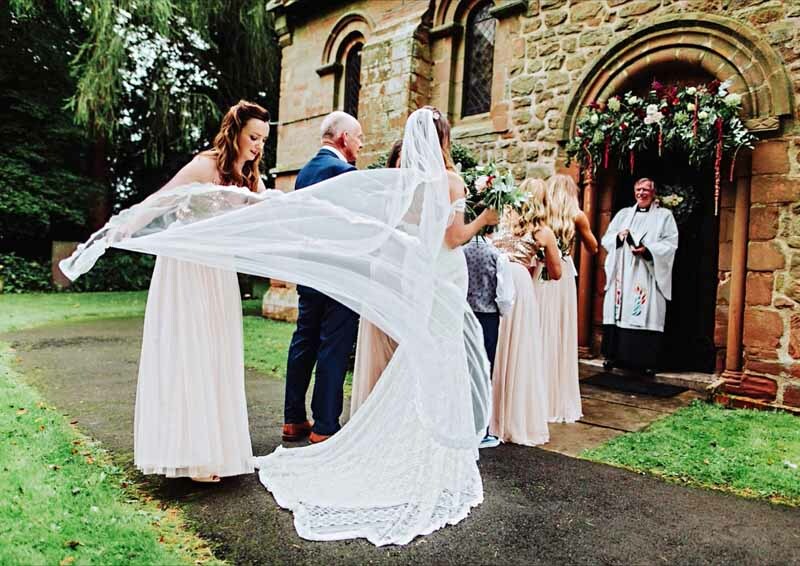 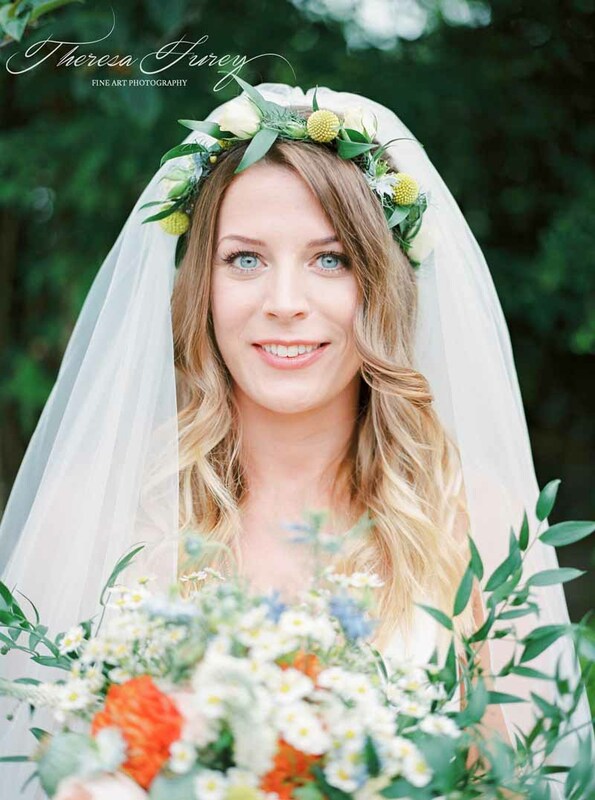 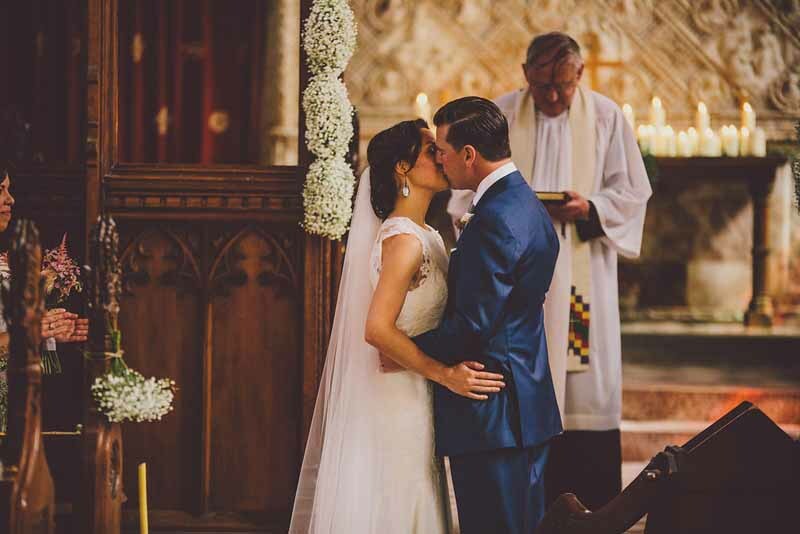 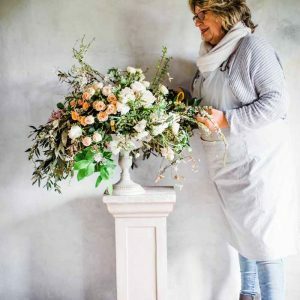 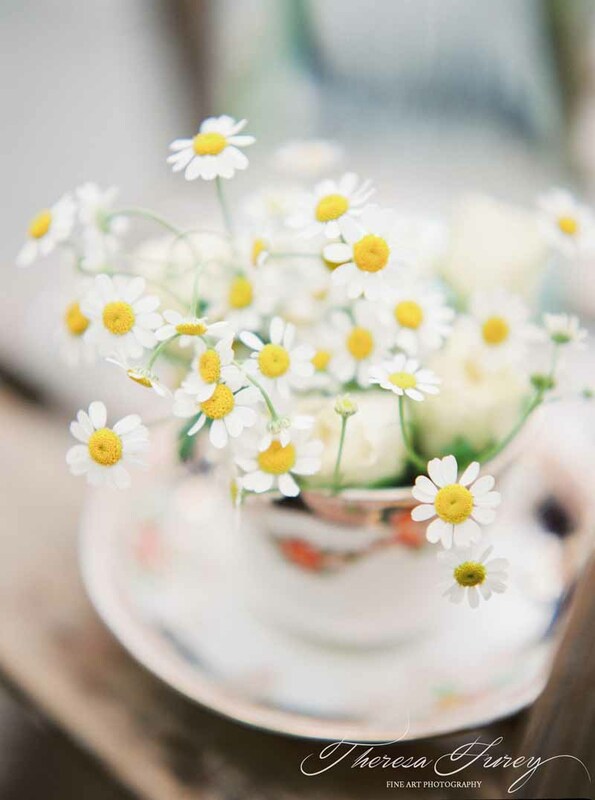 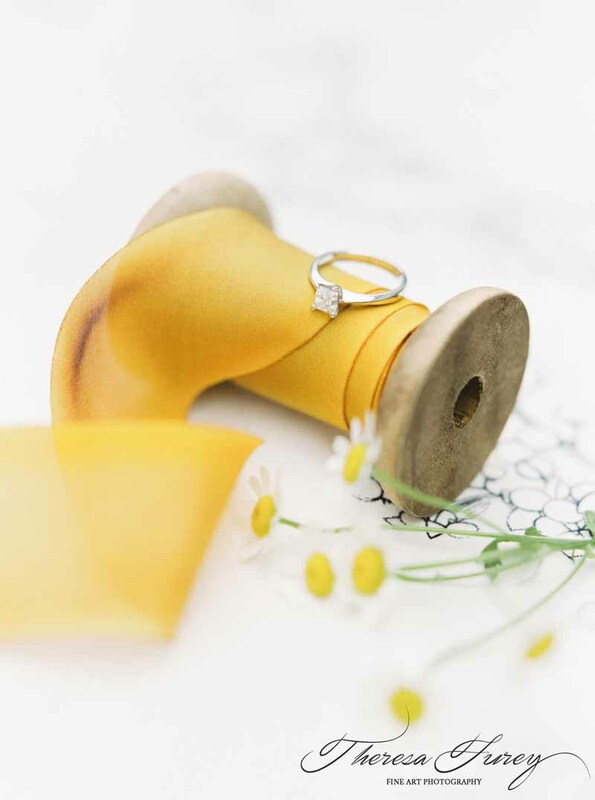 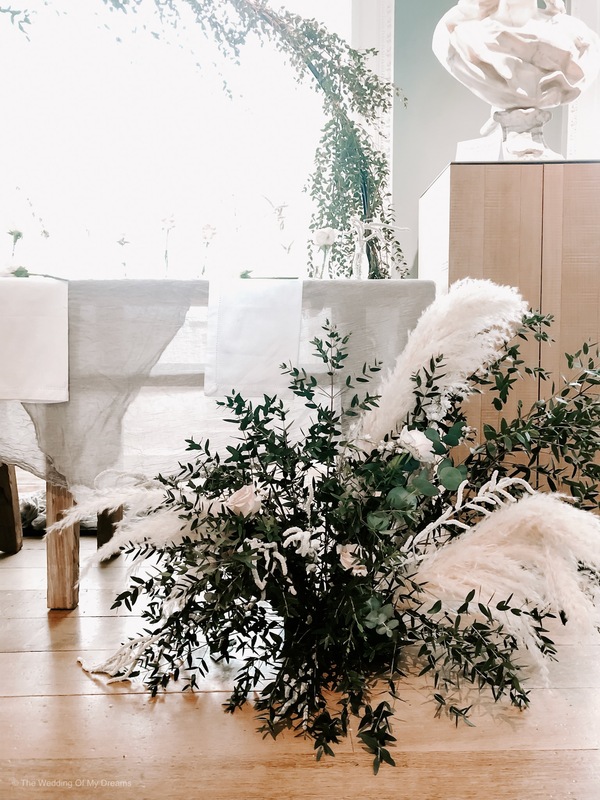 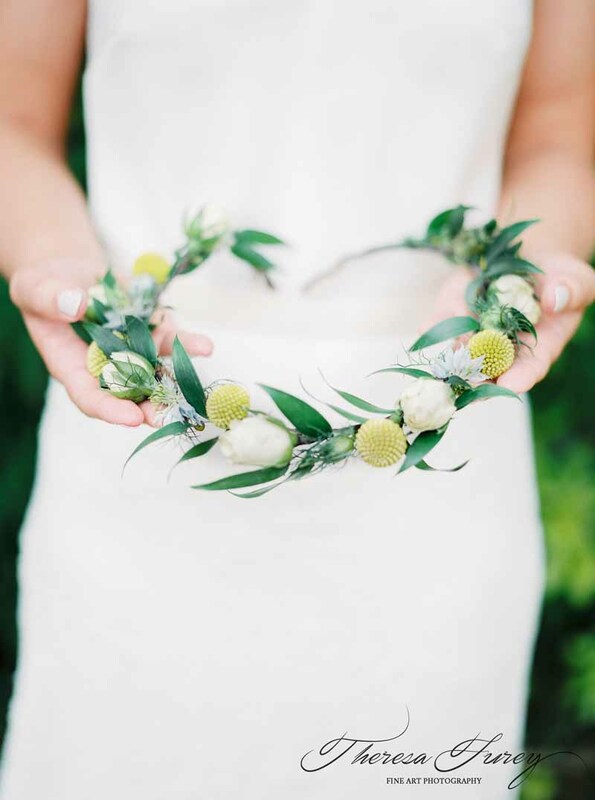 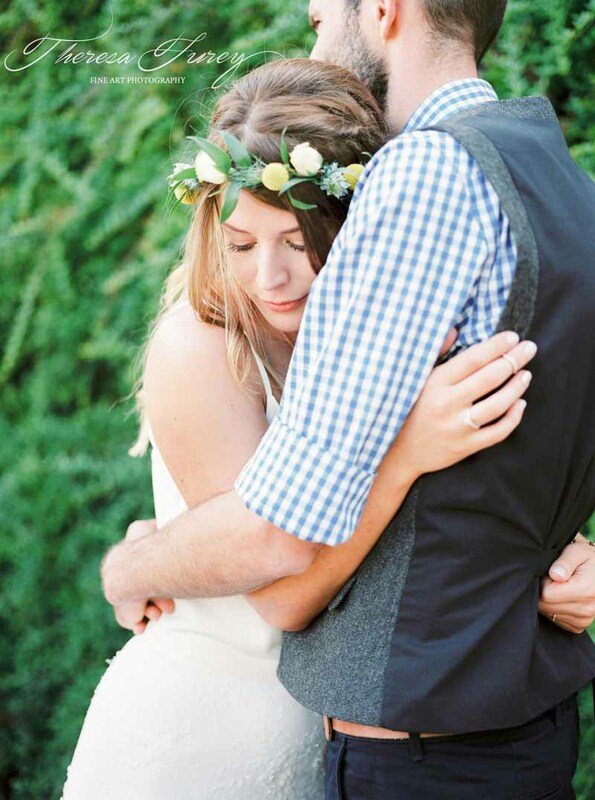 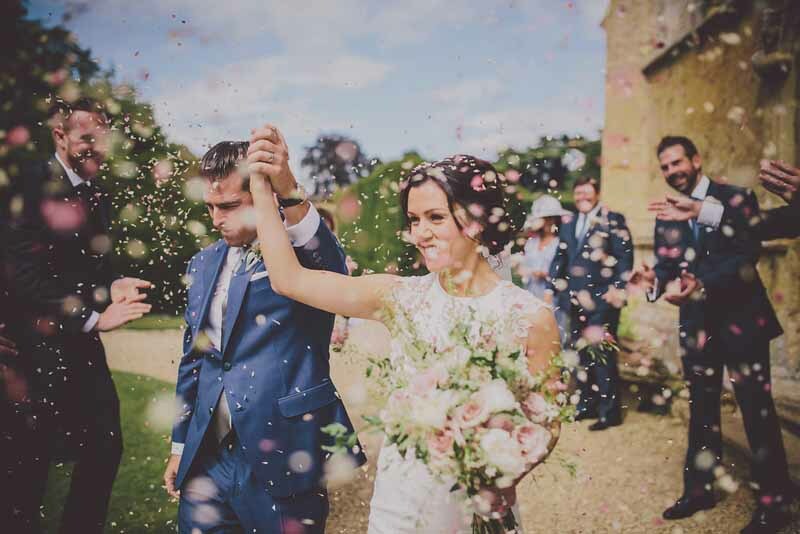 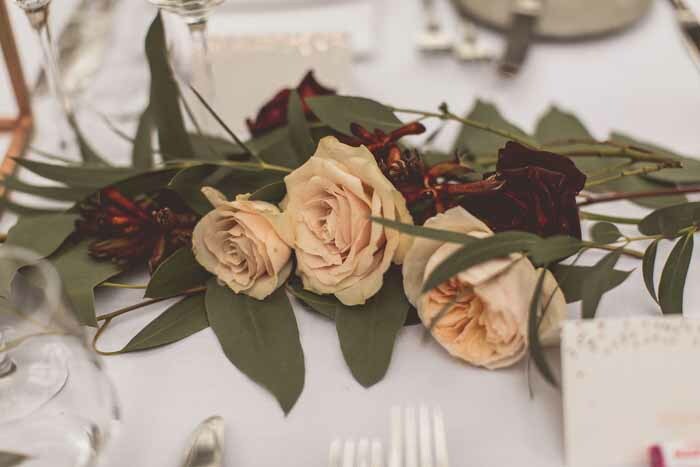 A lightweight feathery flower crown with delicate love in a mist, yellow craspedia, rose buds and snippets of soft ruscus suited the relaxed day and was worn by Jacquie from setting off to church through to the last dance of the evening. 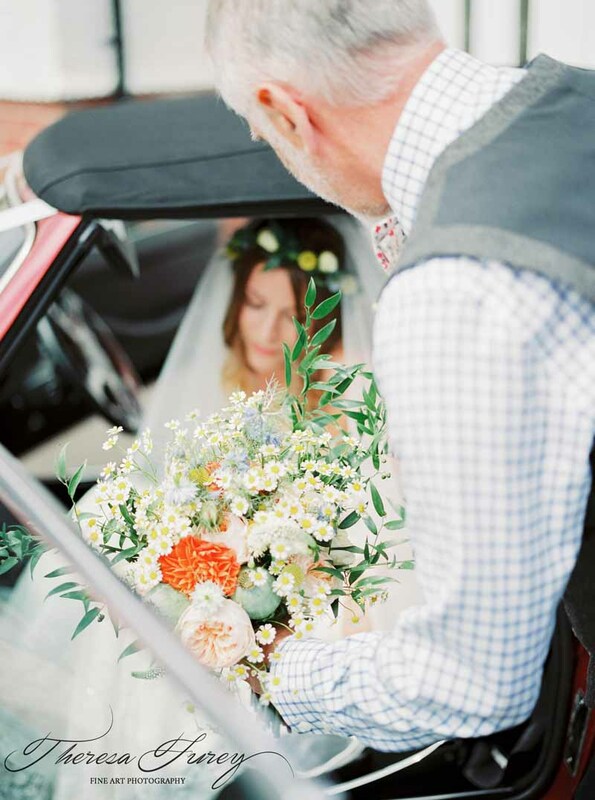 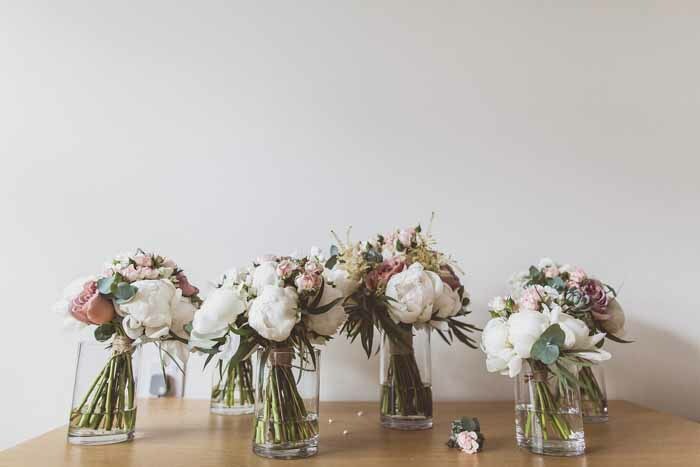 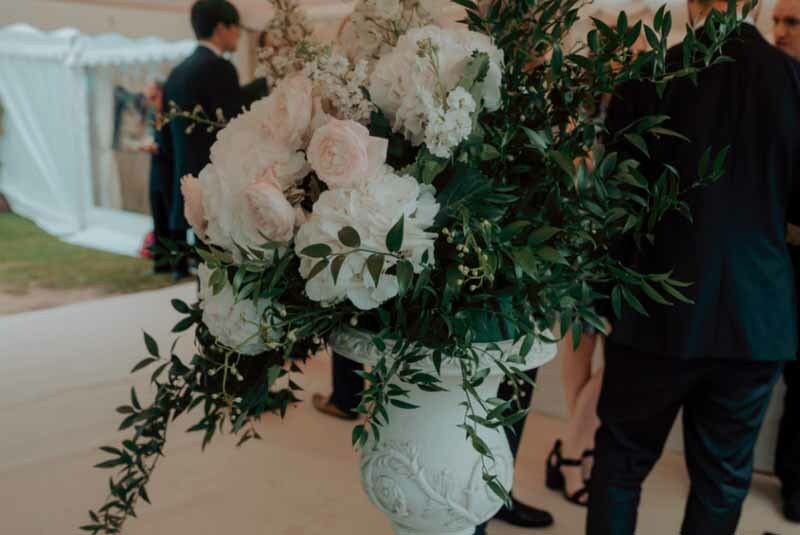 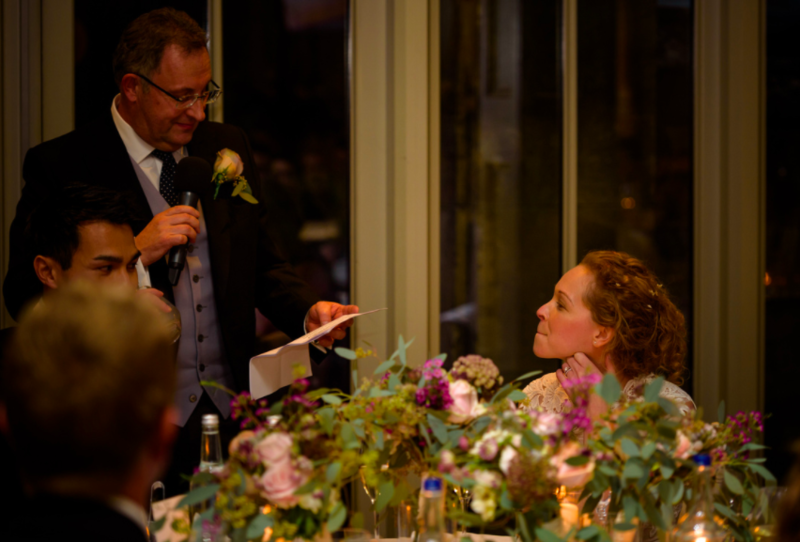 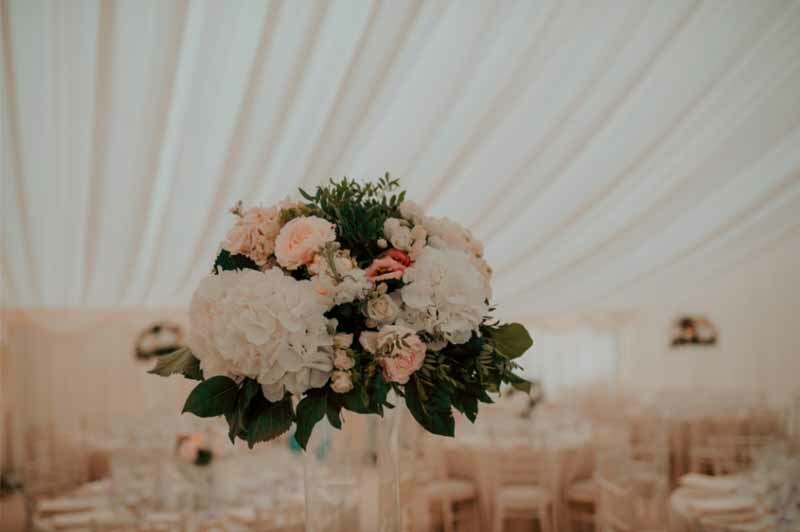 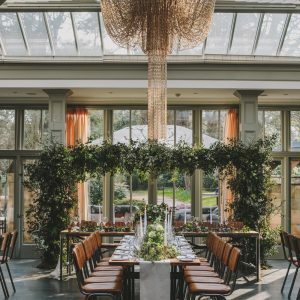 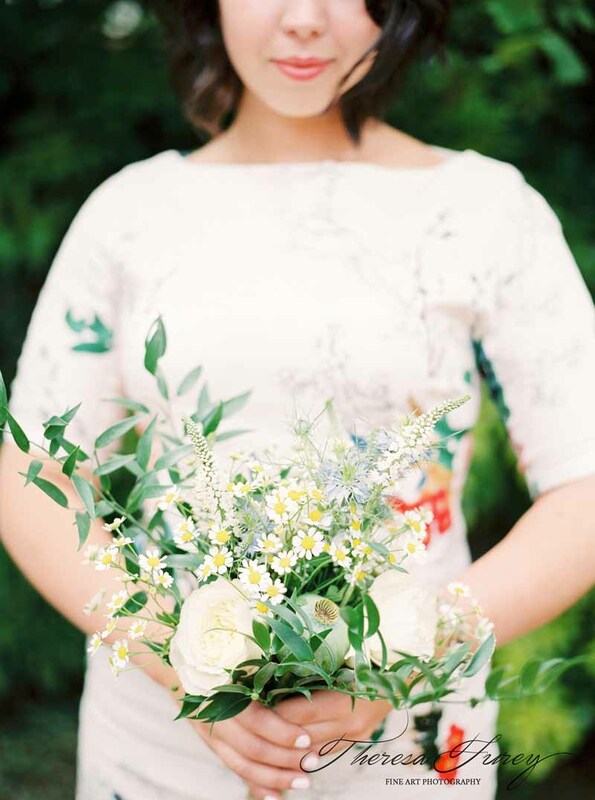 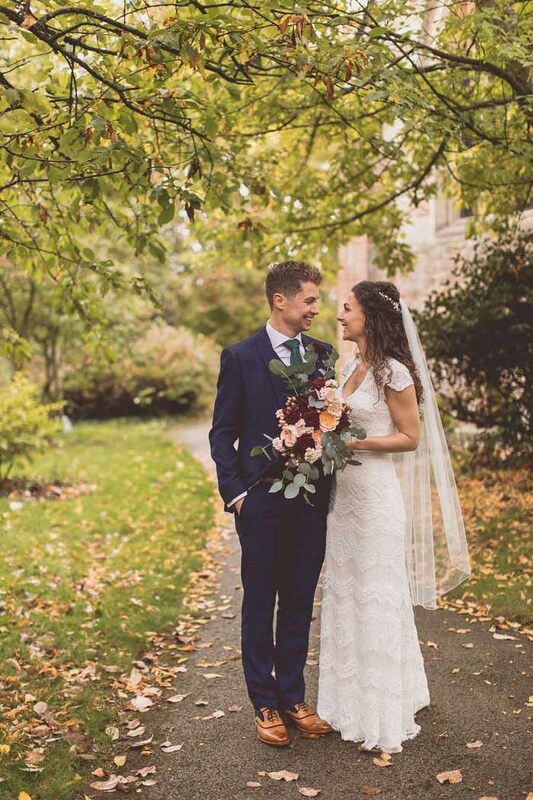 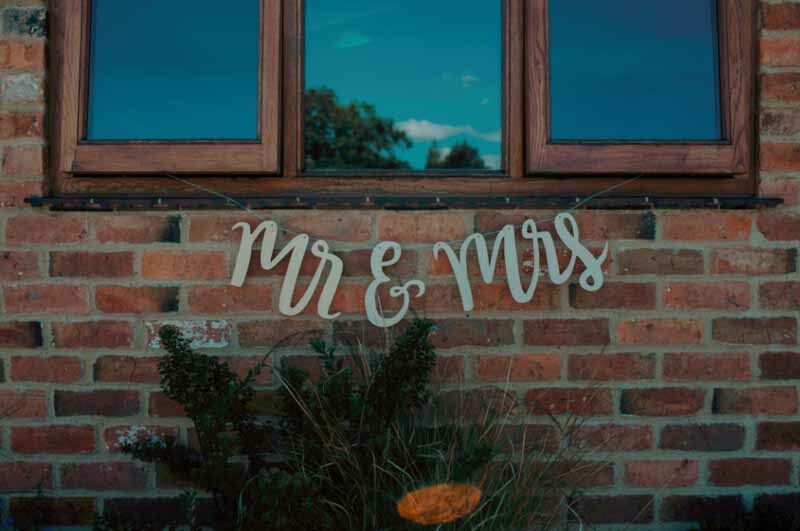 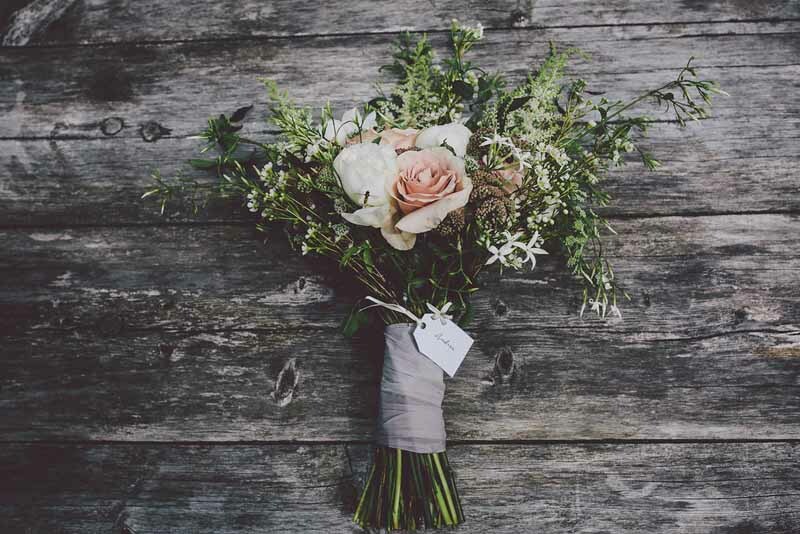 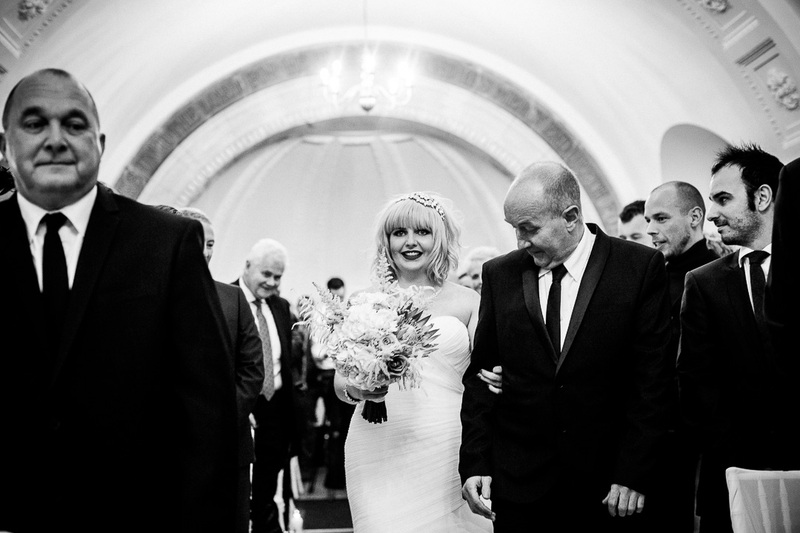 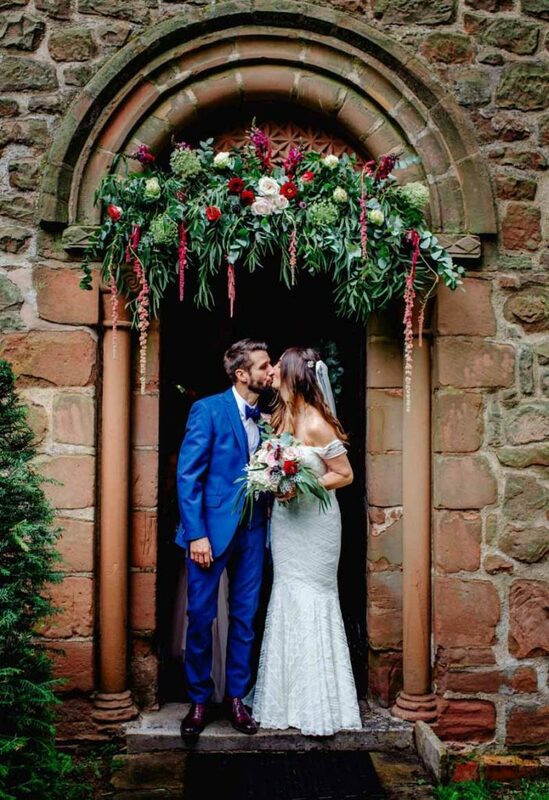 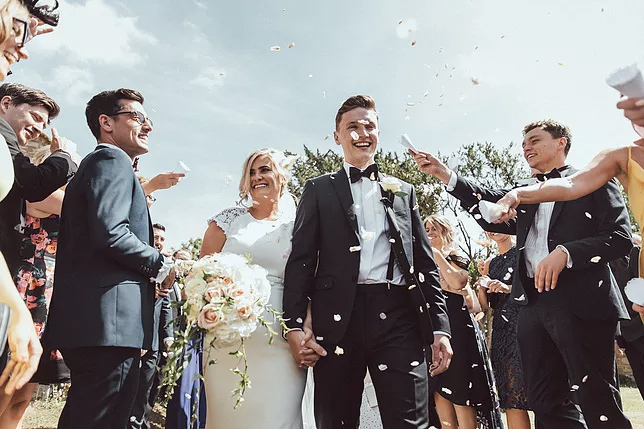 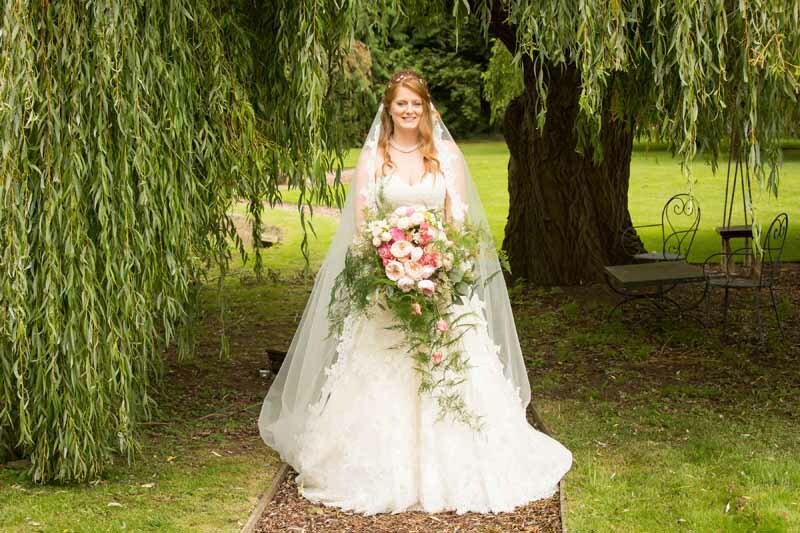 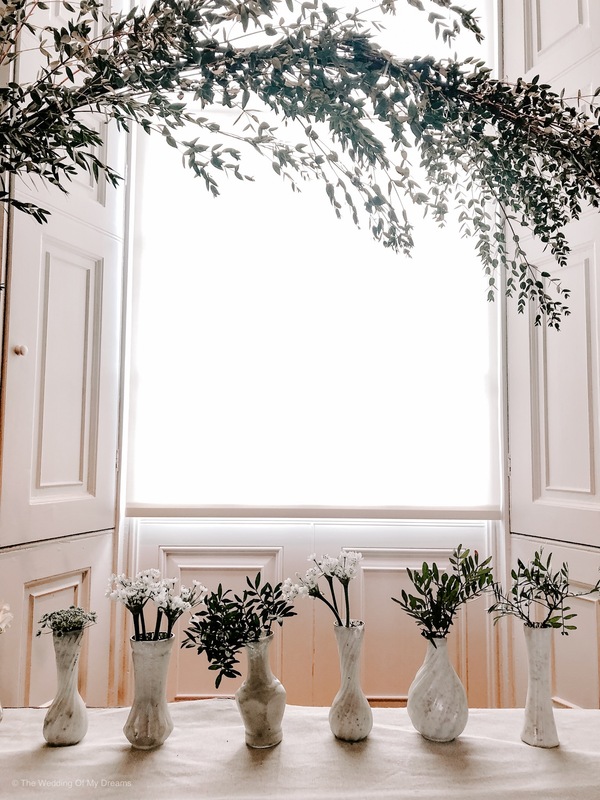 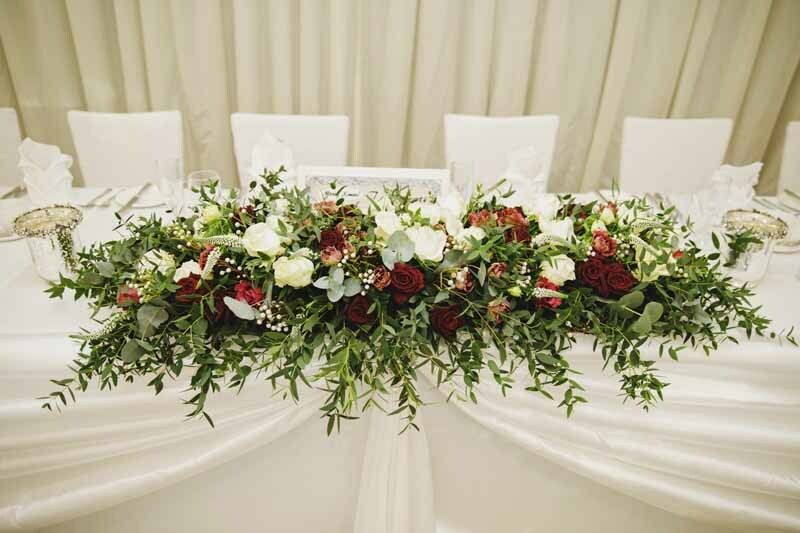 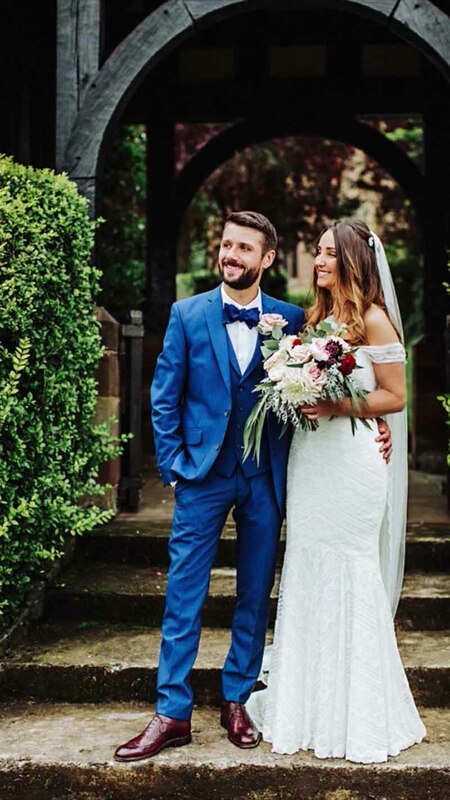 The bride carried a very loose hand tied natural looking mix of garden roses, tanacetum daisy, soft ruscus trailing, blue love in a mist, cornflowers and pops of bright orange blooms gorgeous with her Charlie Brear dress in pale ivory tones. 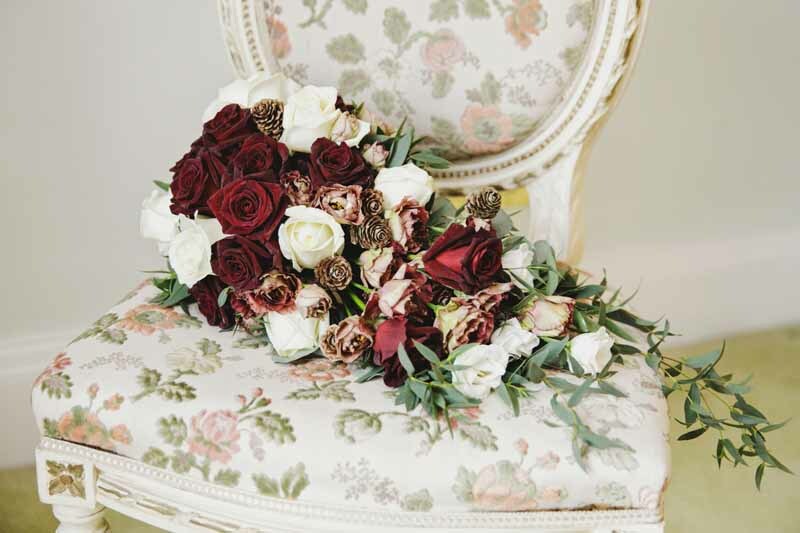 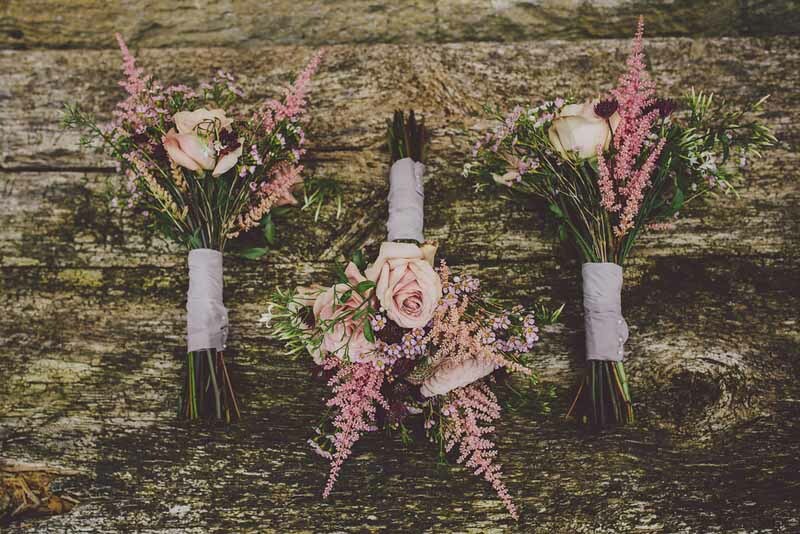 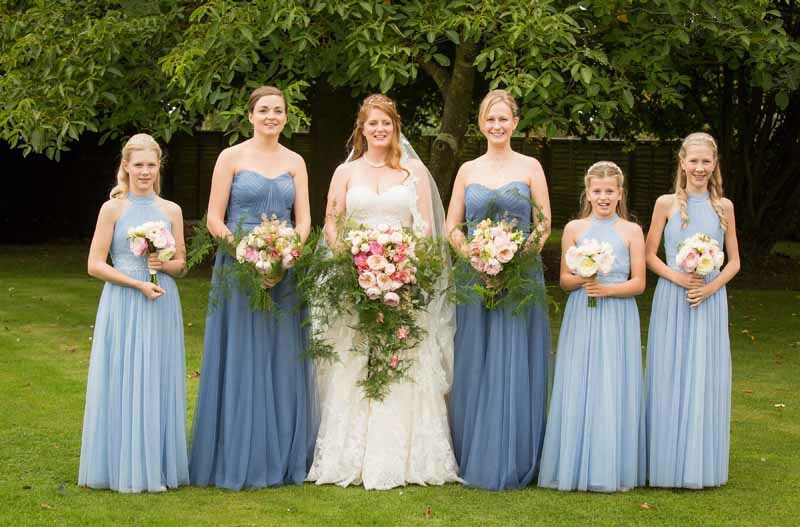 We always love our consultations when we get to see the bridesmaids dresses or swatches or colours and can then design bouquets to suite. 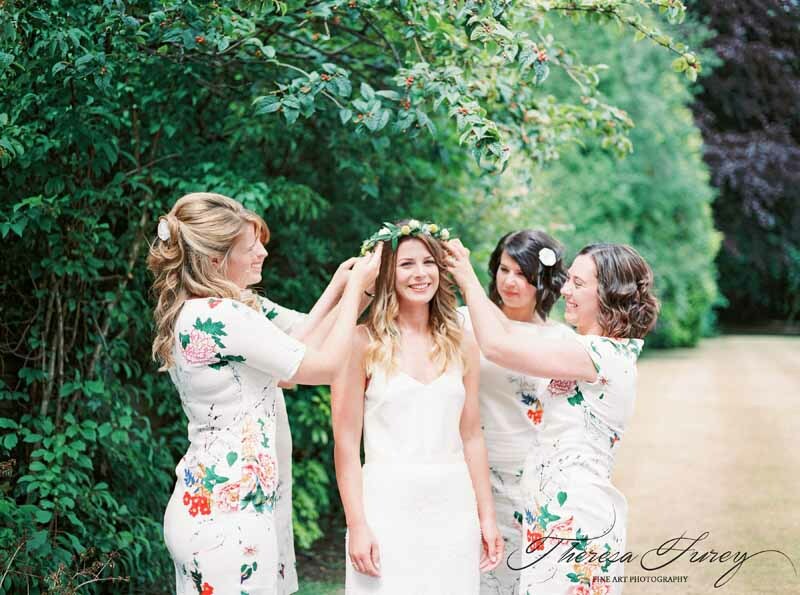 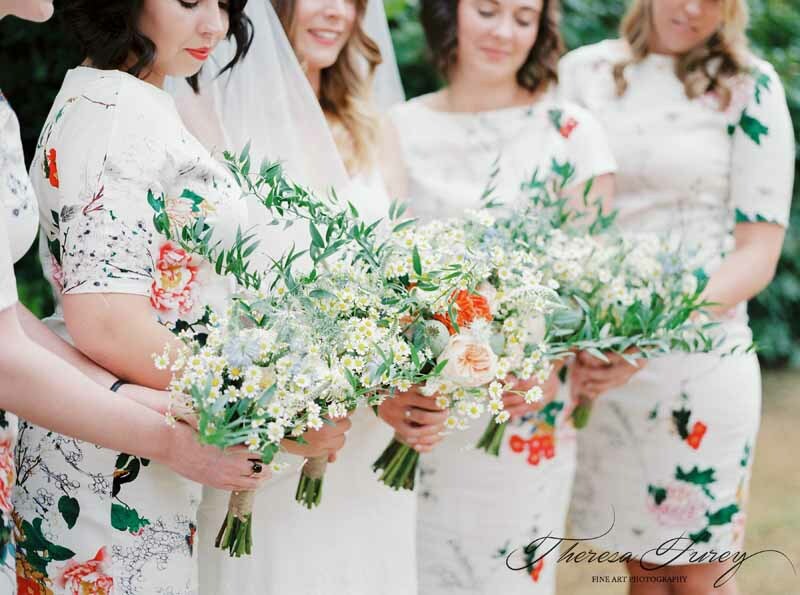 The floral dresses worn by the girls looked stunning pared with loose natural summer bouquets. 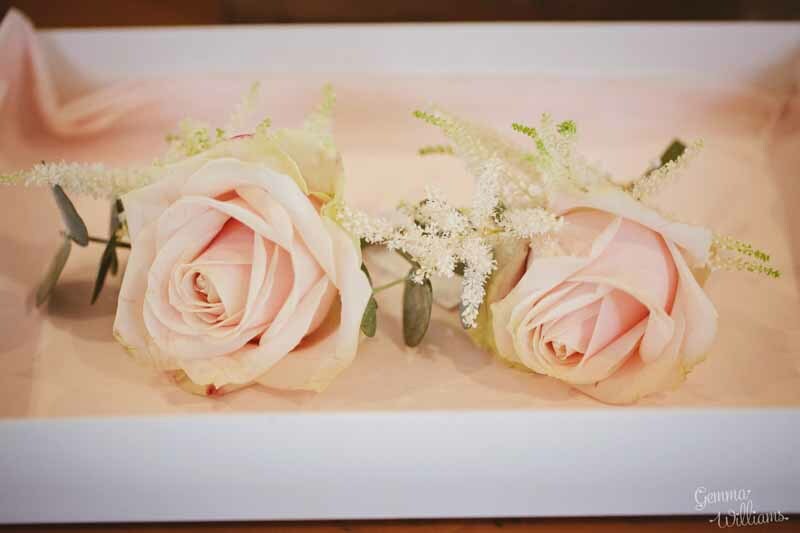 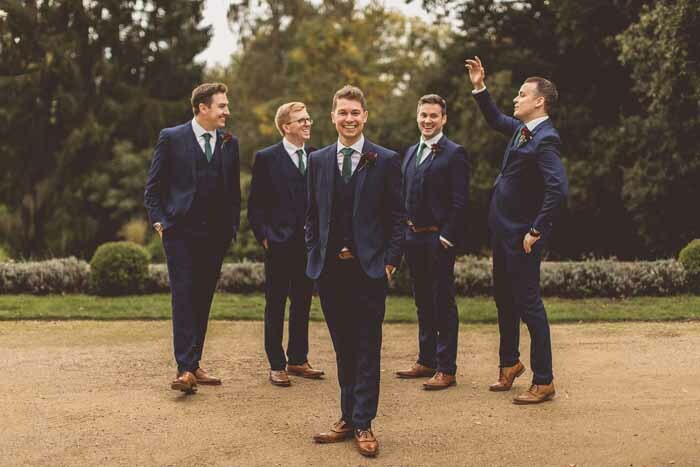 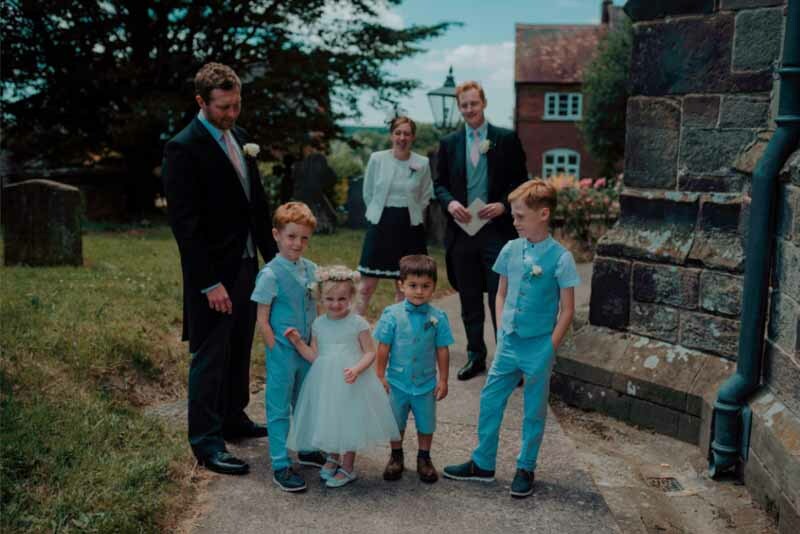 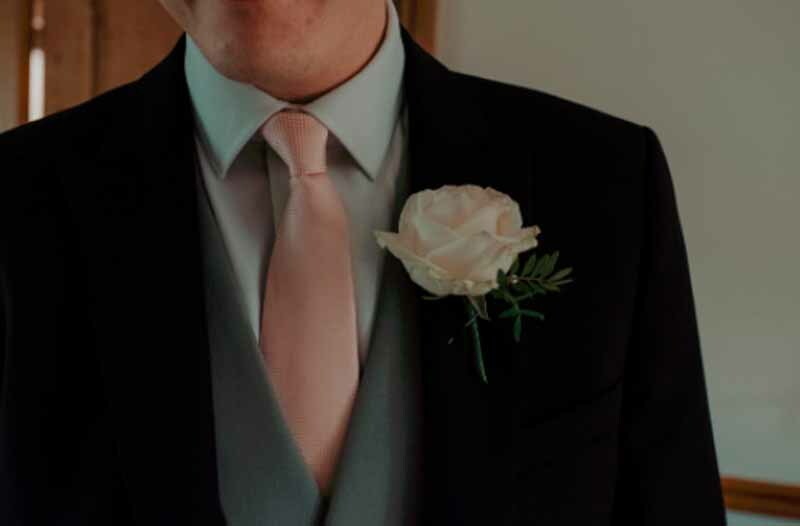 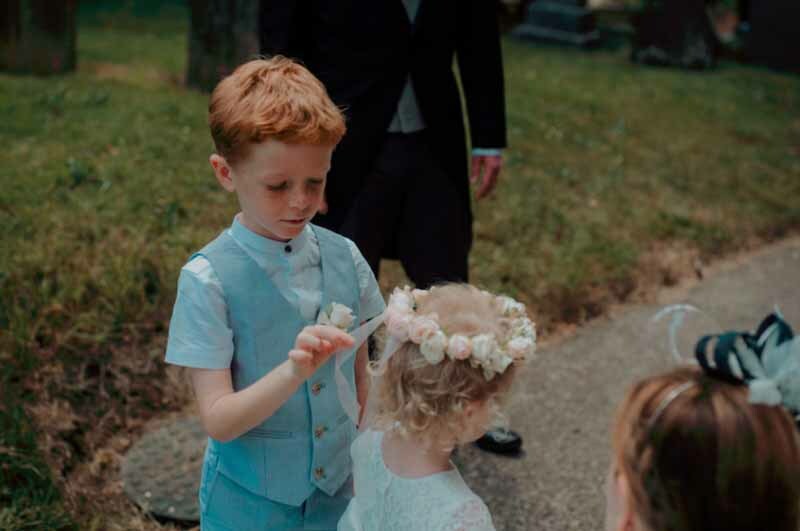 The boys wore rose button holes simply tied with twine for their relaxed look. 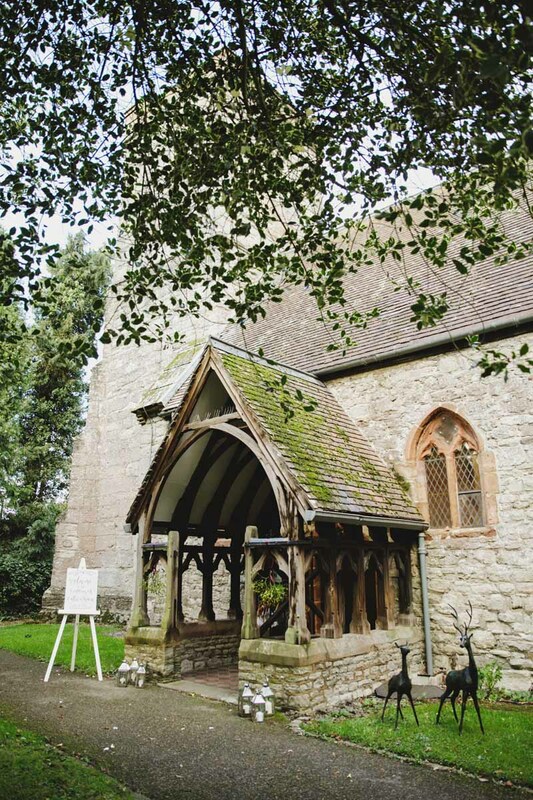 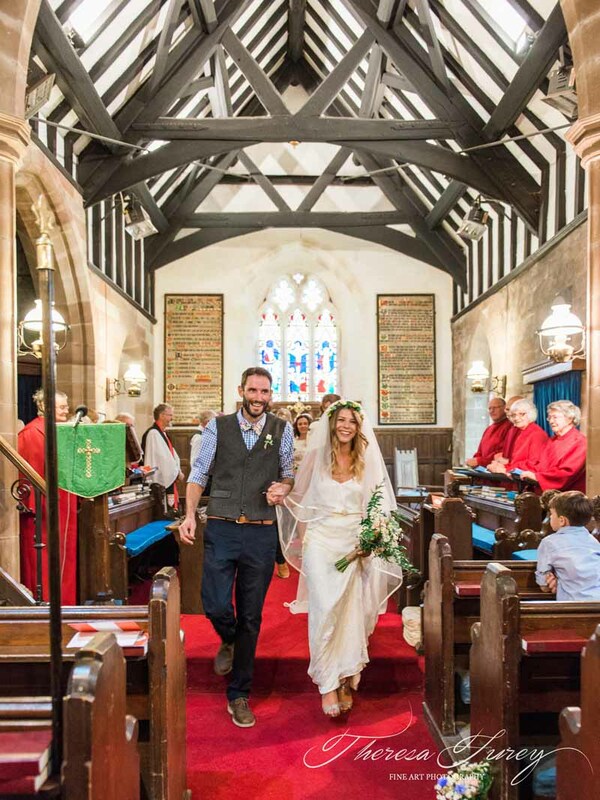 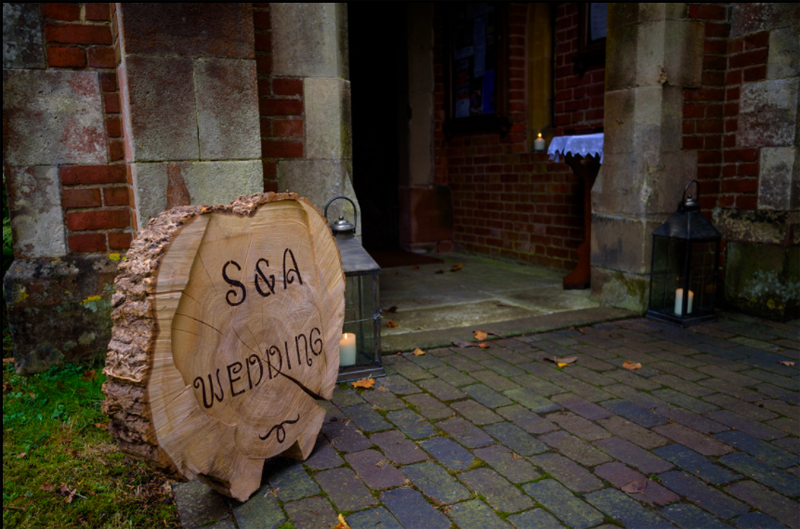 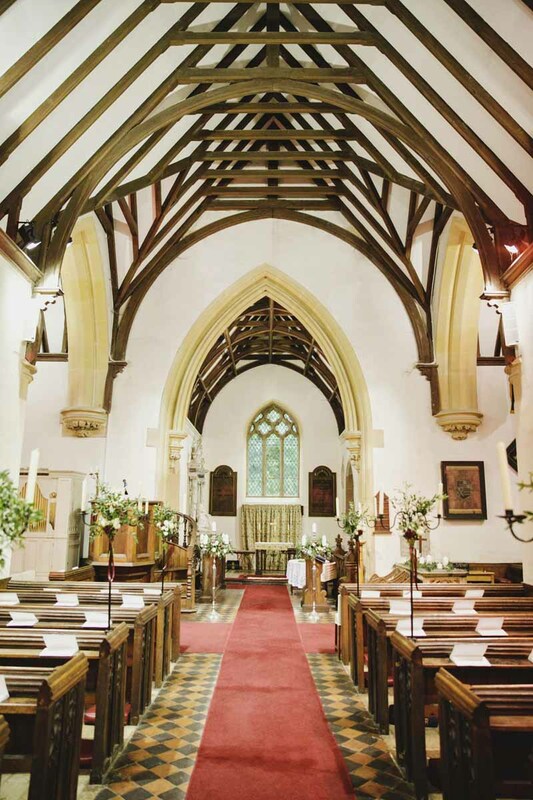 Barnt Green church just down the road from the family home was welcoming for the wedding guests. 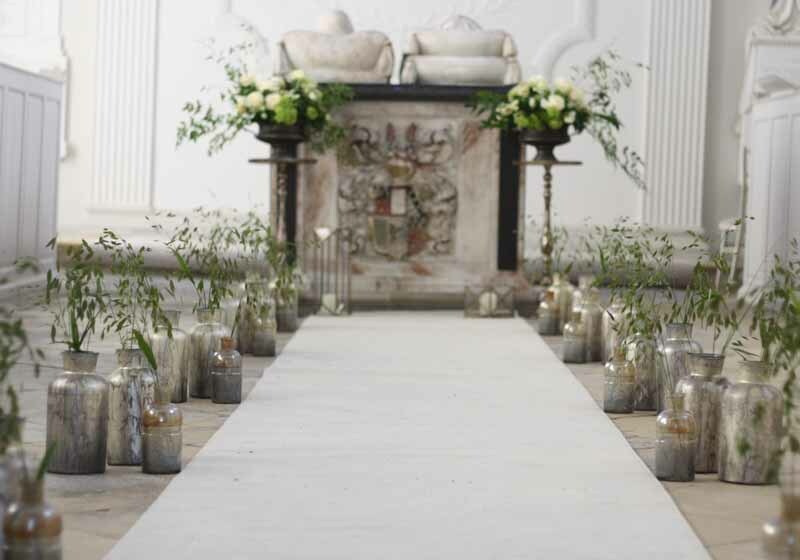 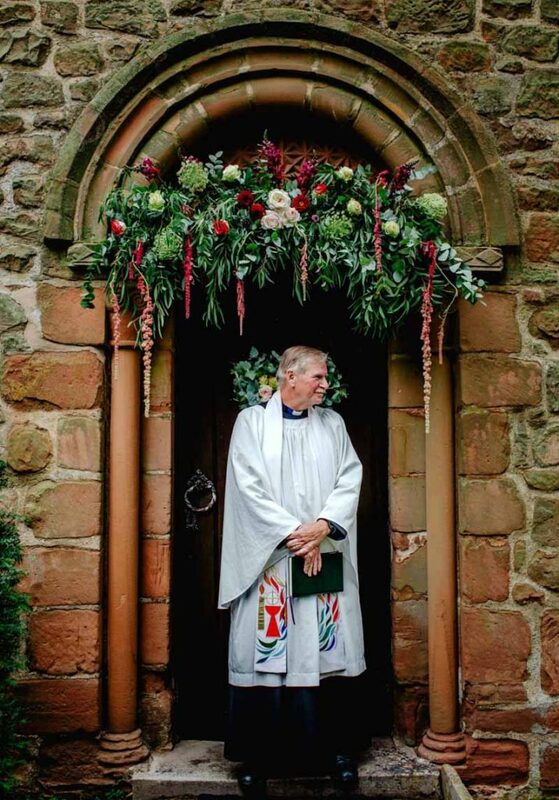 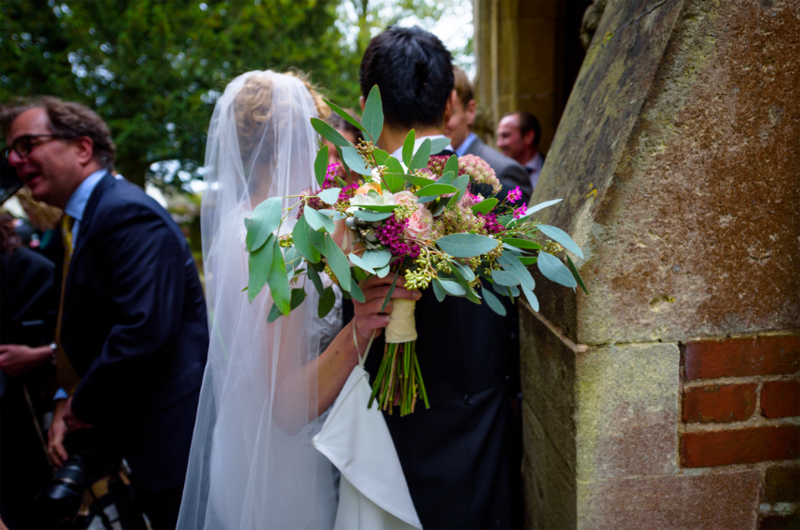 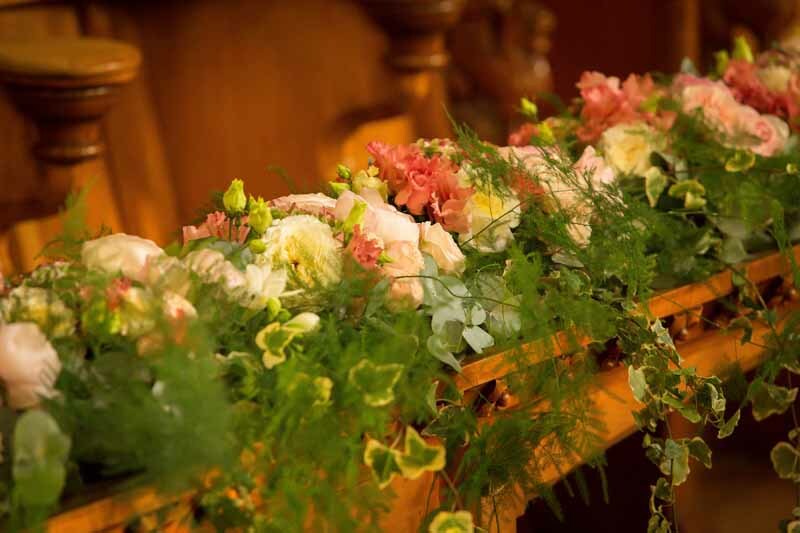 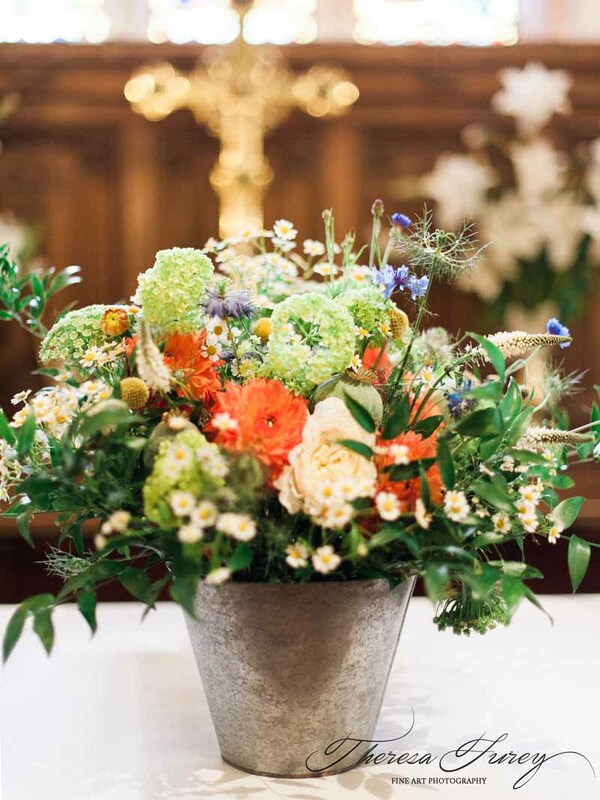 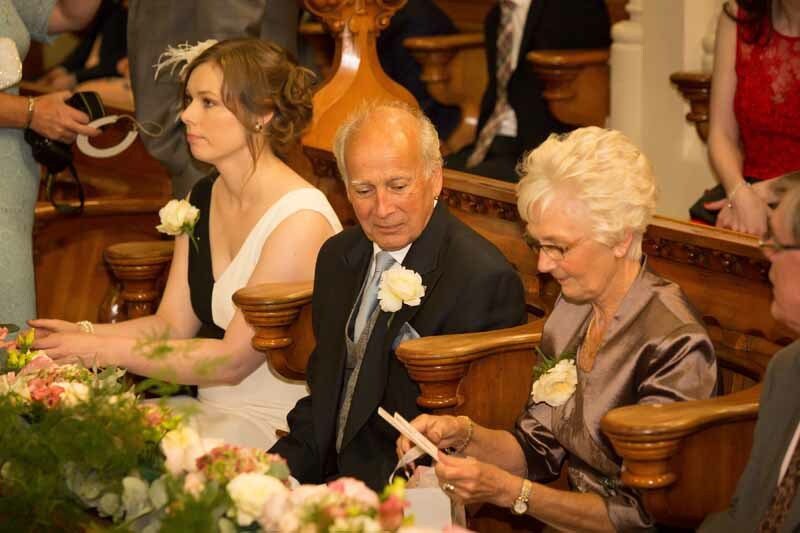 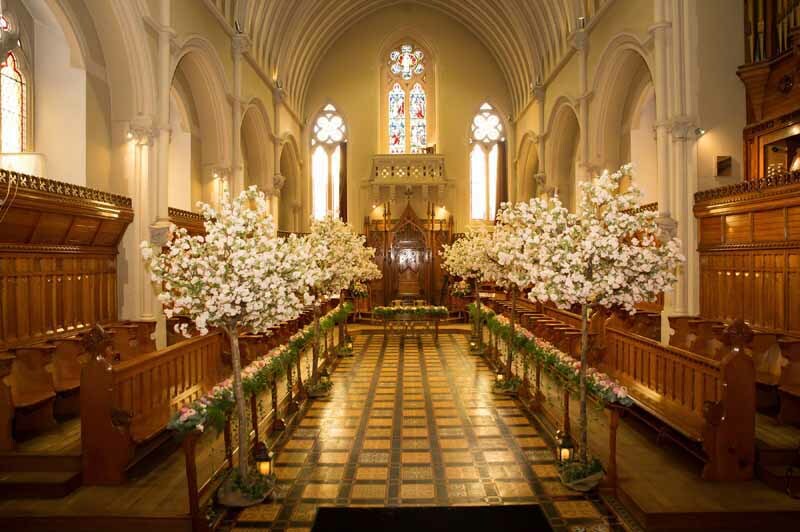 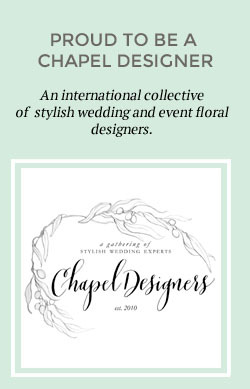 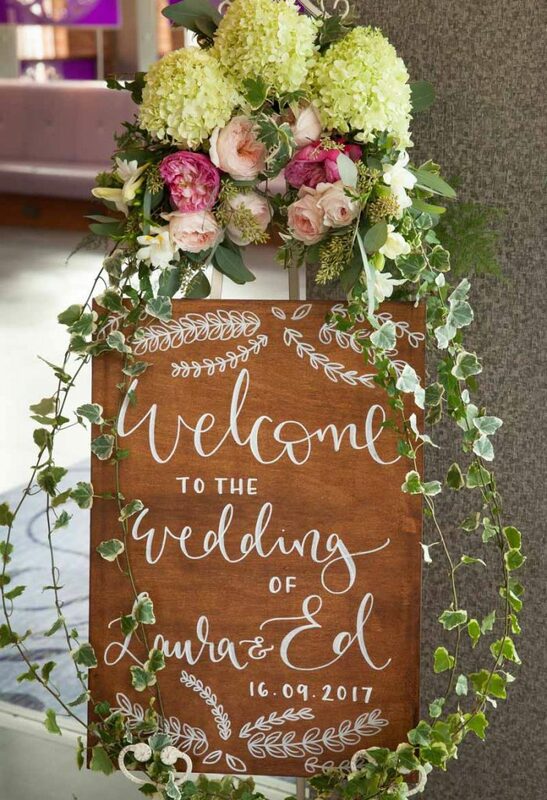 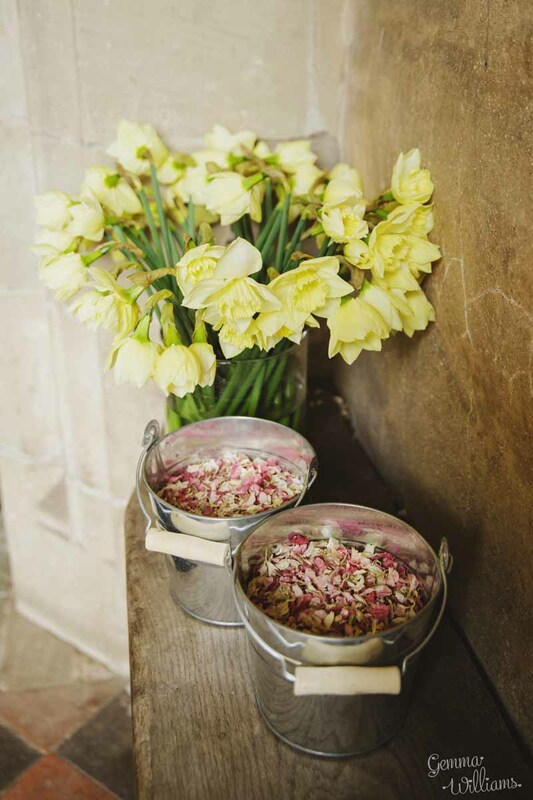 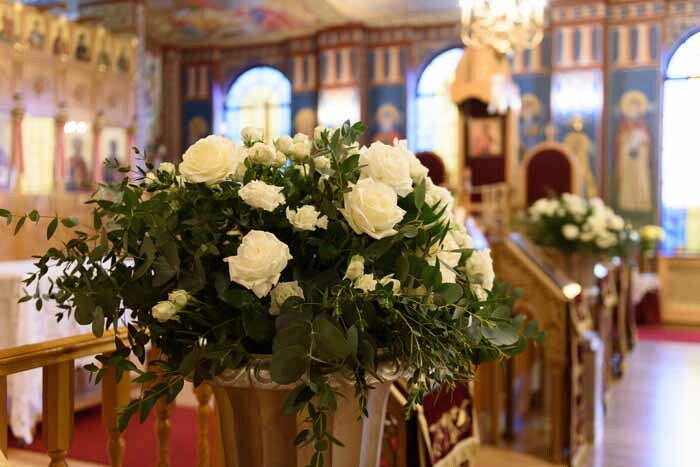 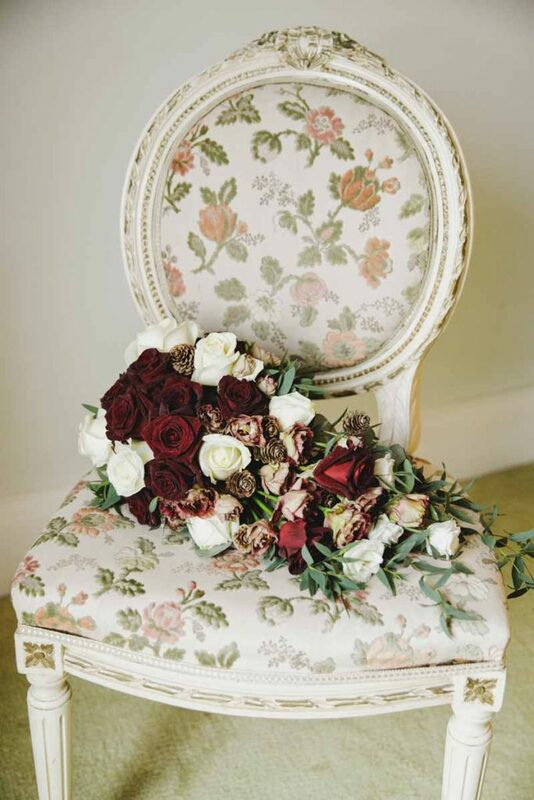 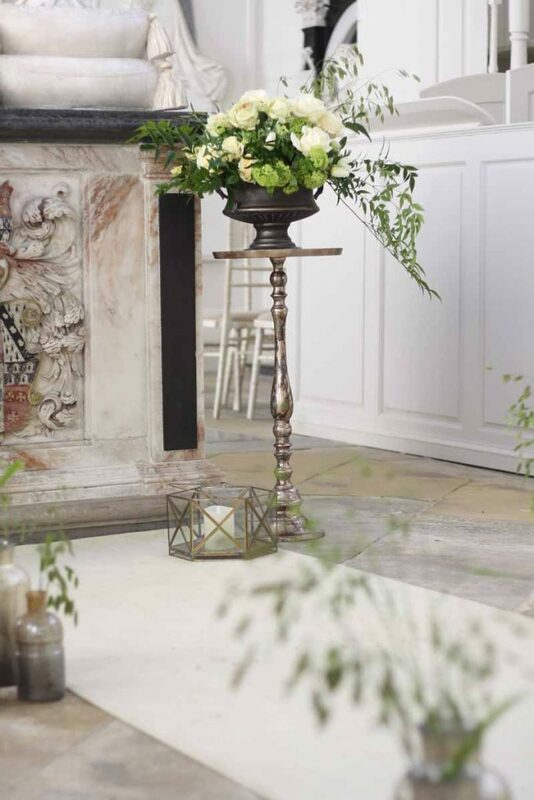 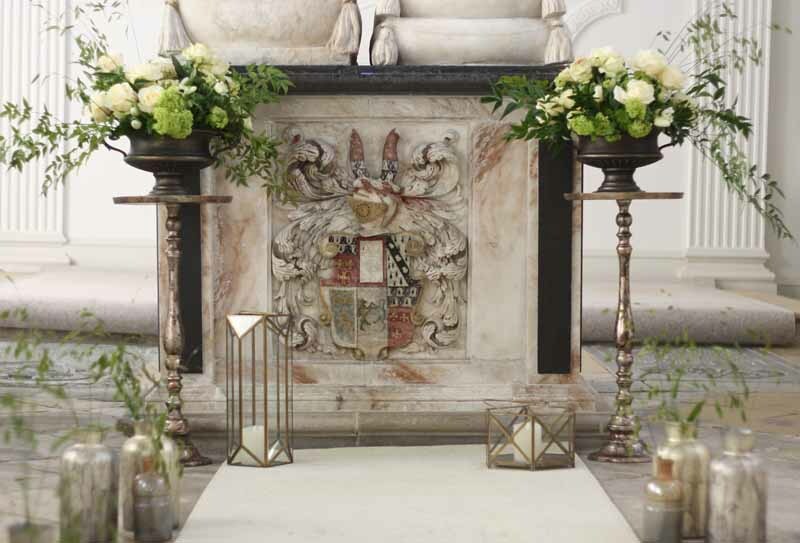 A galvanised bucket of flowers decorated the altar and simple posies of flowers were set out down the aisle. 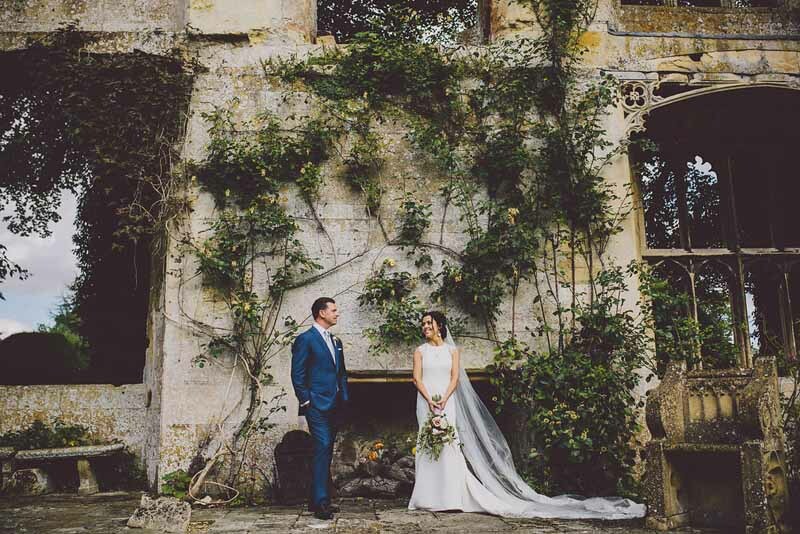 Jacquie and Neil chose Laughern Hill with its walled garden setting, vinery and beautiful garden for their summer garden wedding. 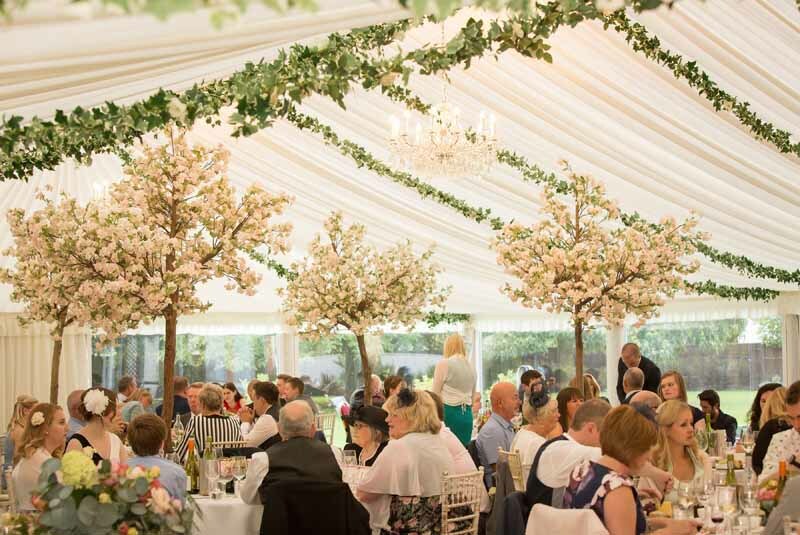 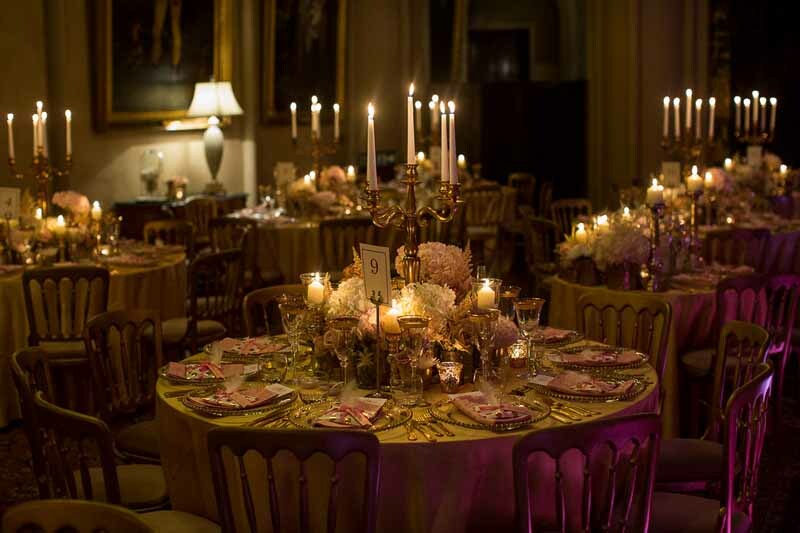 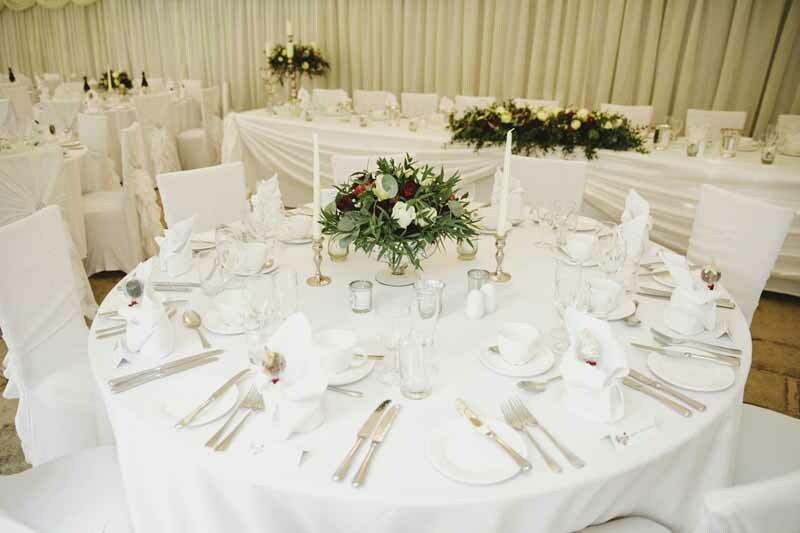 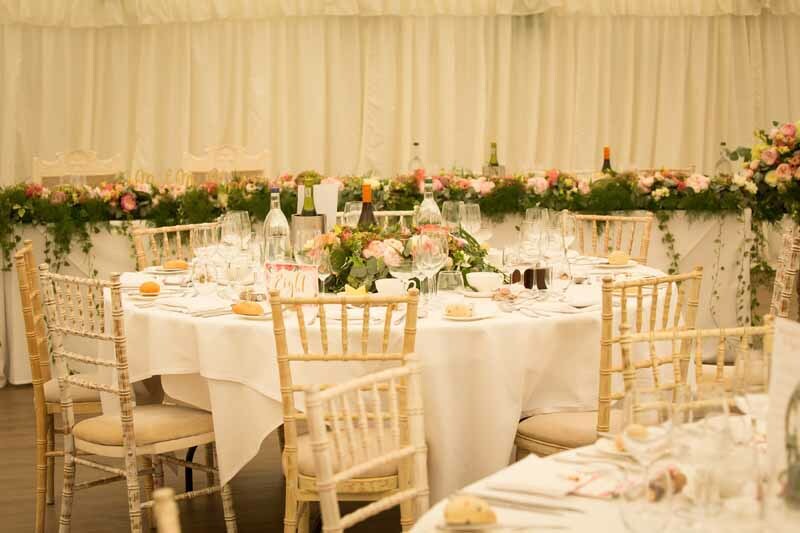 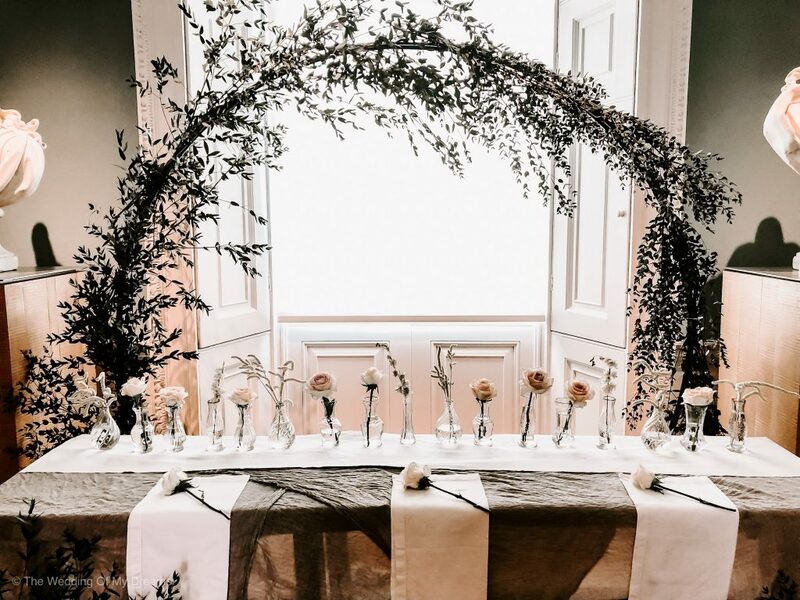 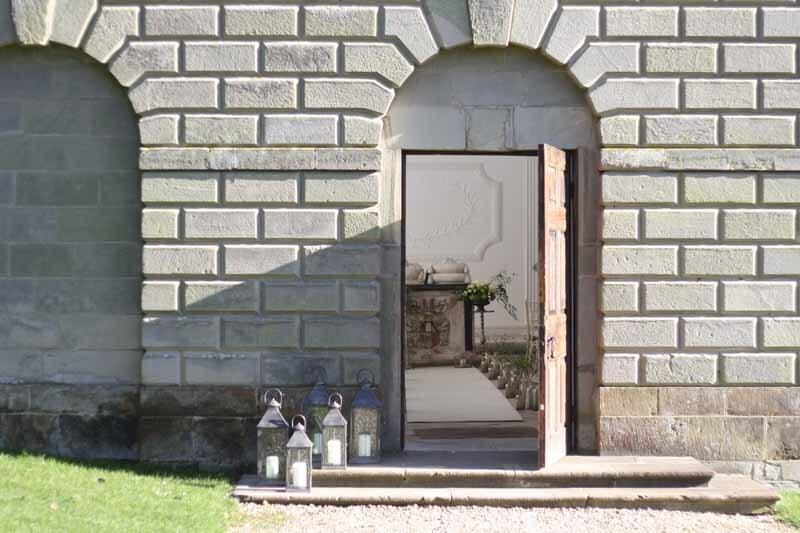 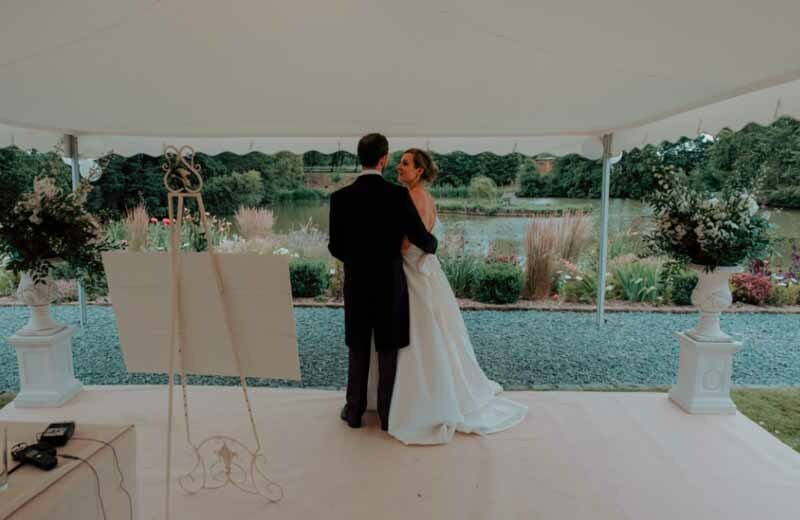 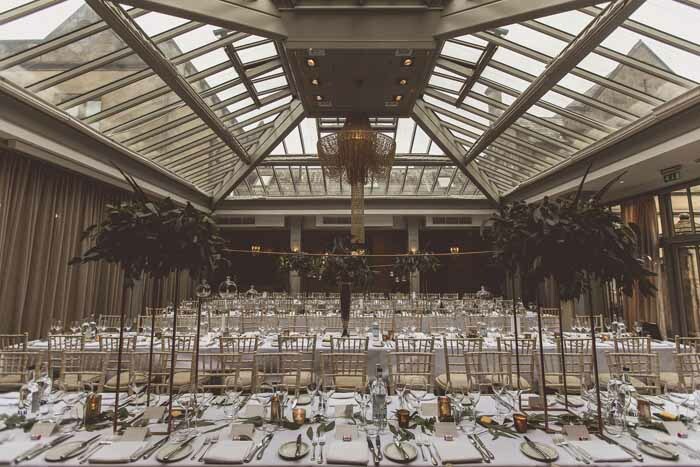 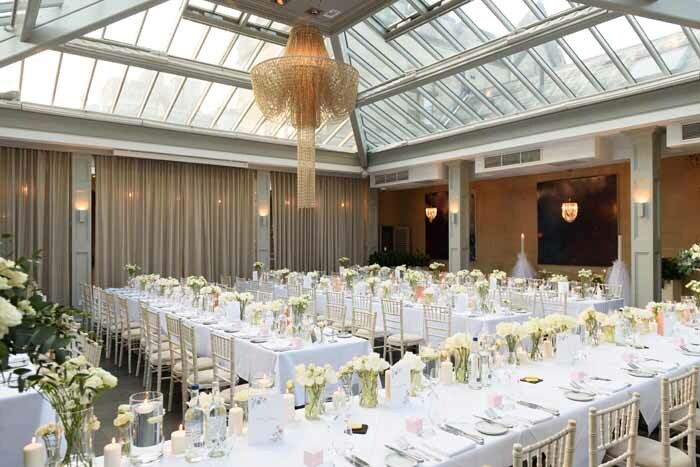 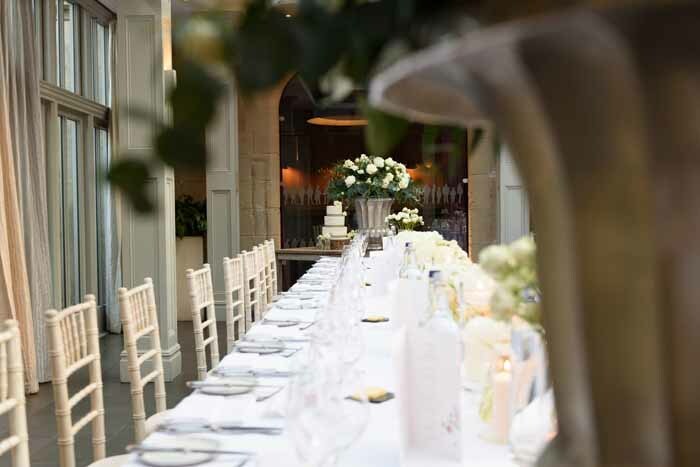 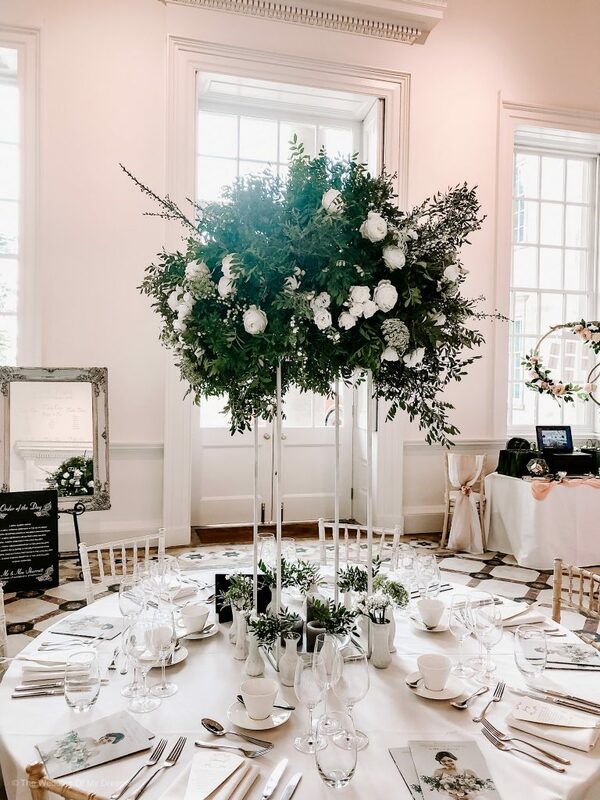 A marquee was set up in the gardens leaving an abundance of space to dress and decorate to their taste. 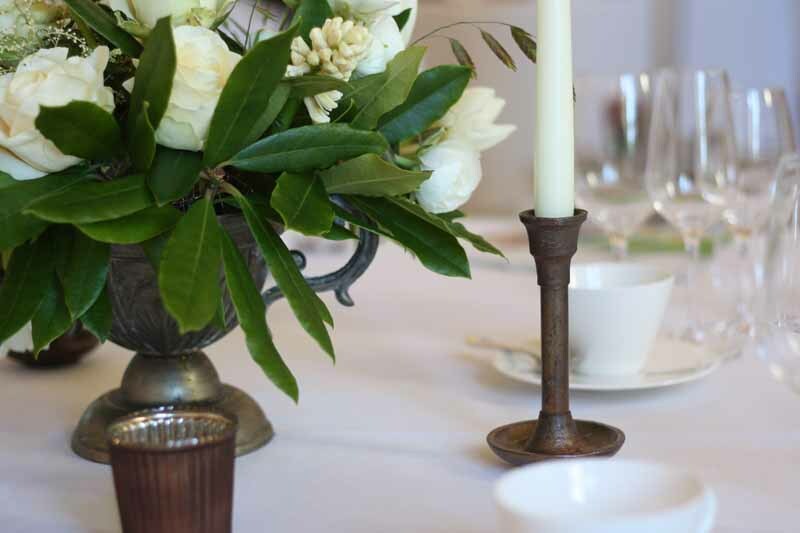 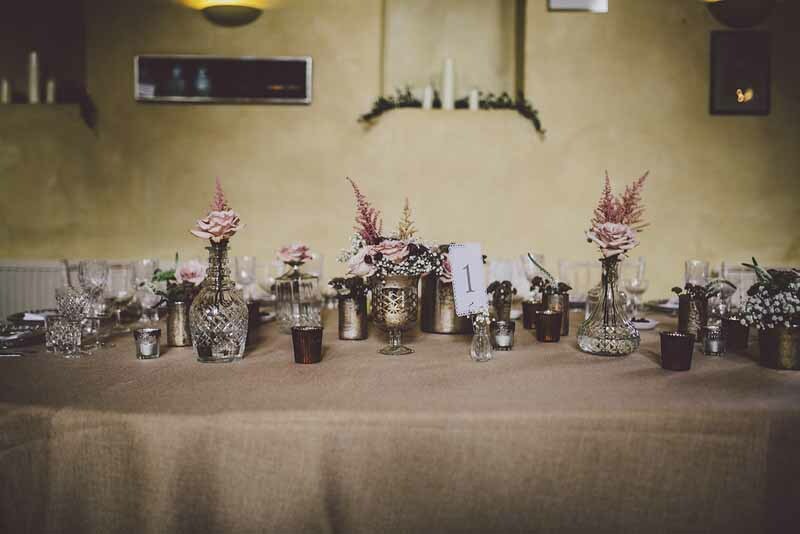 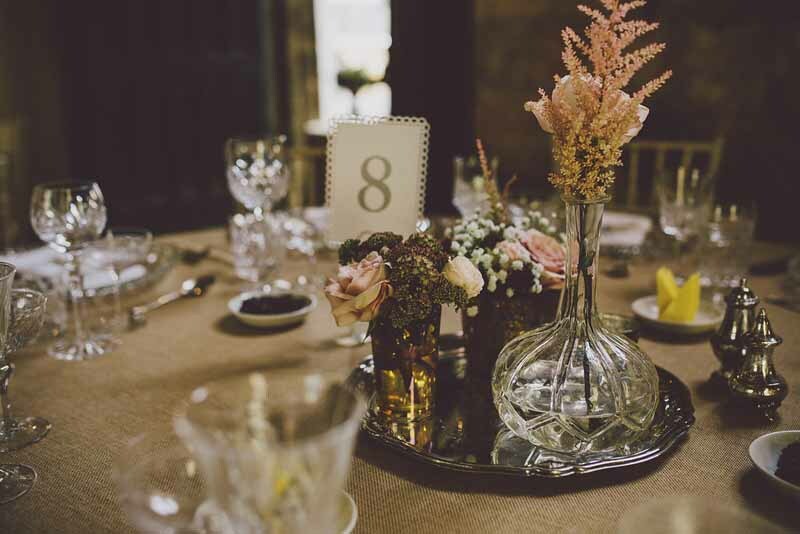 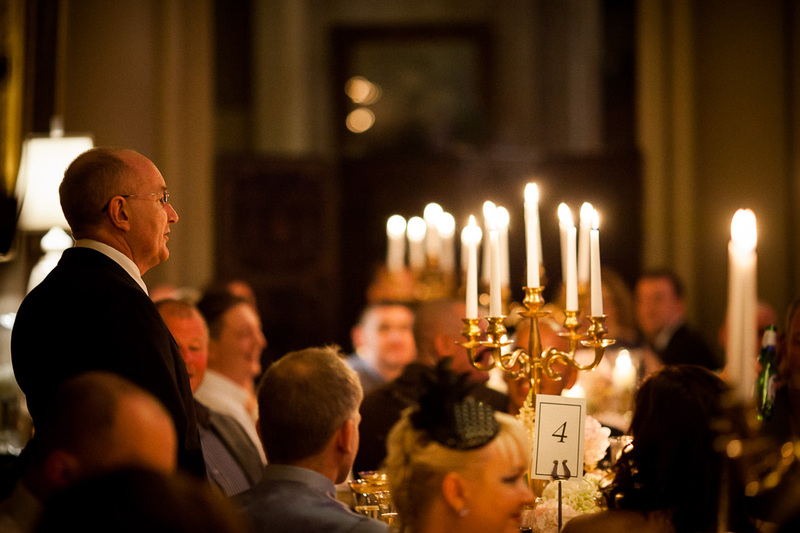 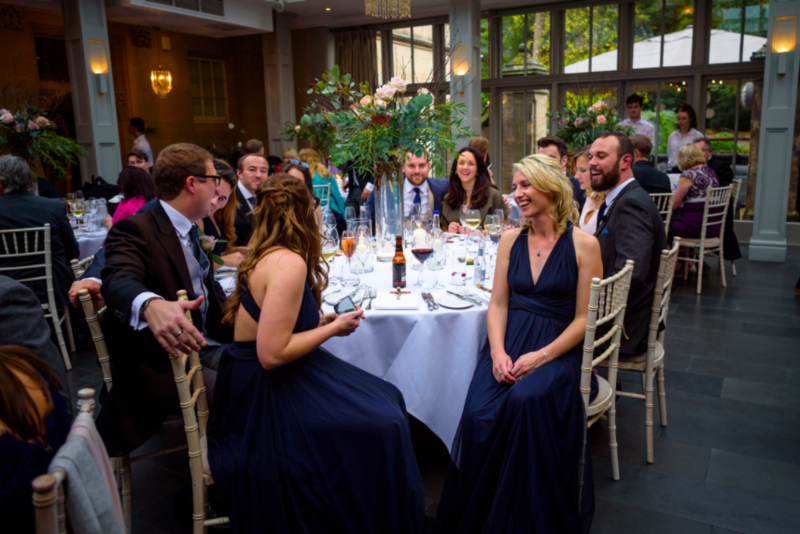 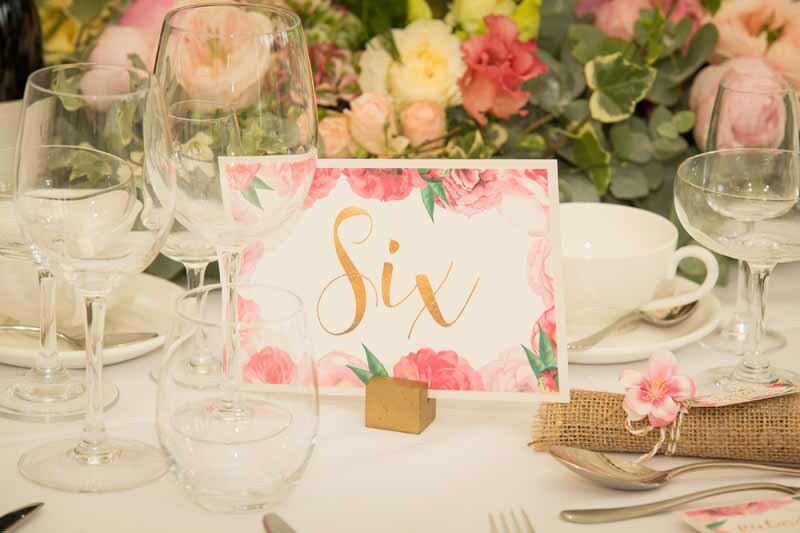 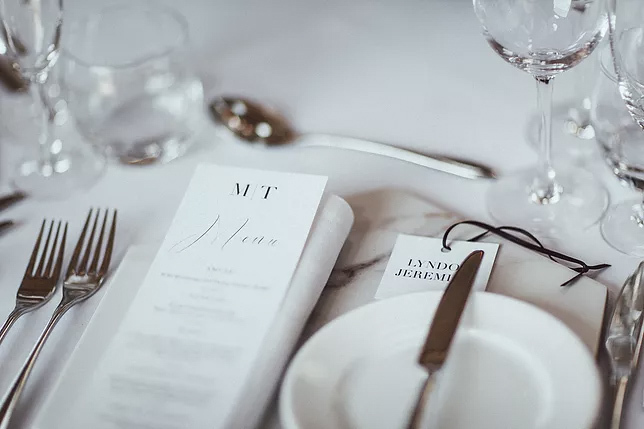 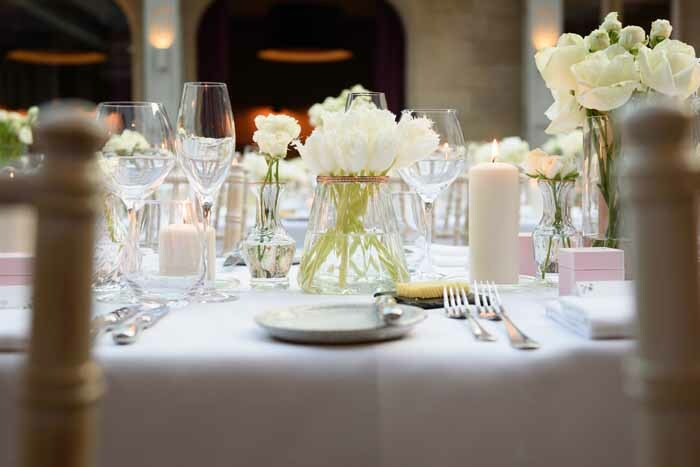 The tables had an eclectic mix of relaxed centrepieces. 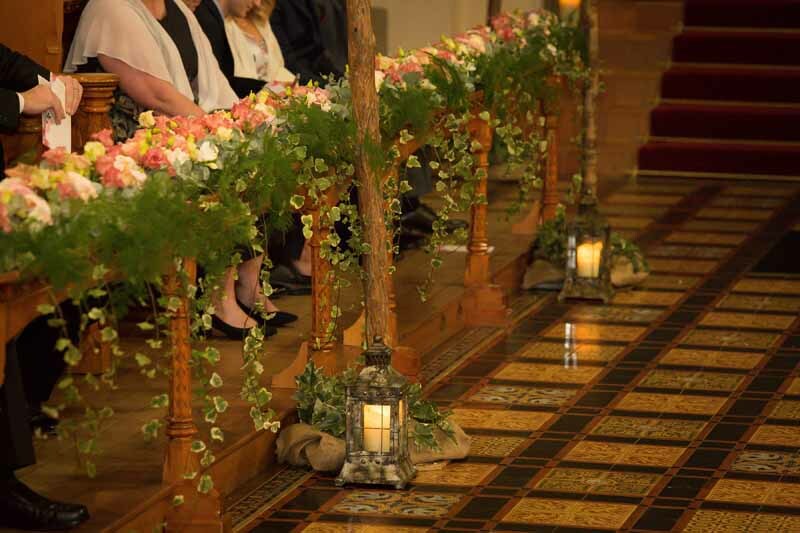 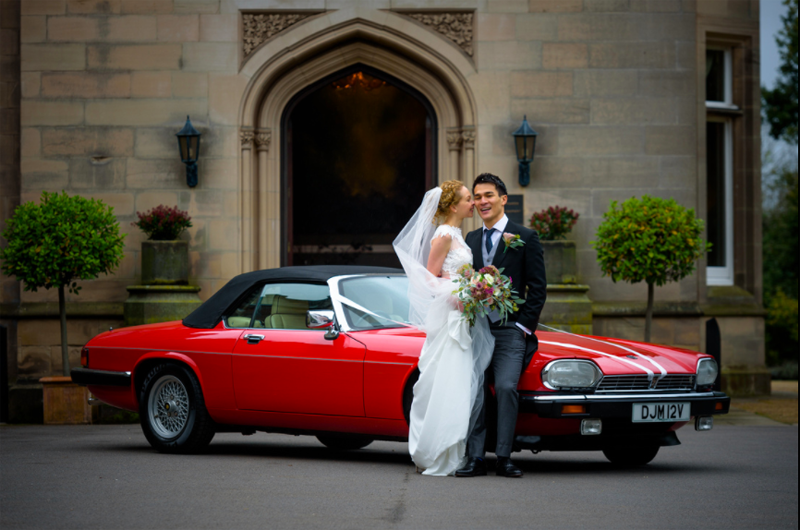 Bright flowers from the day unified the look and created the relaxed look the couple were hoping for. 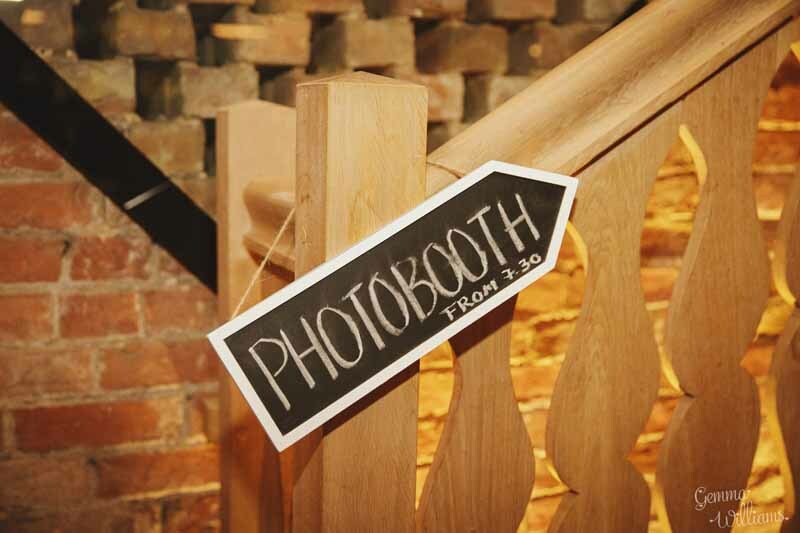 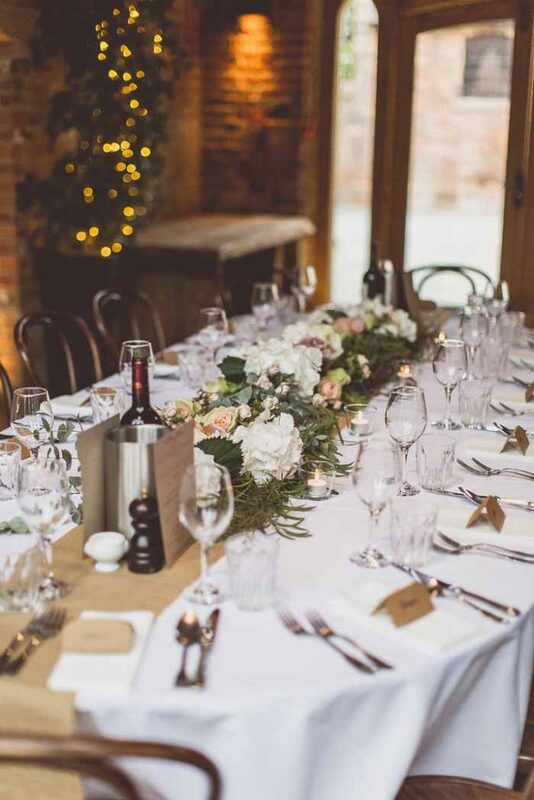 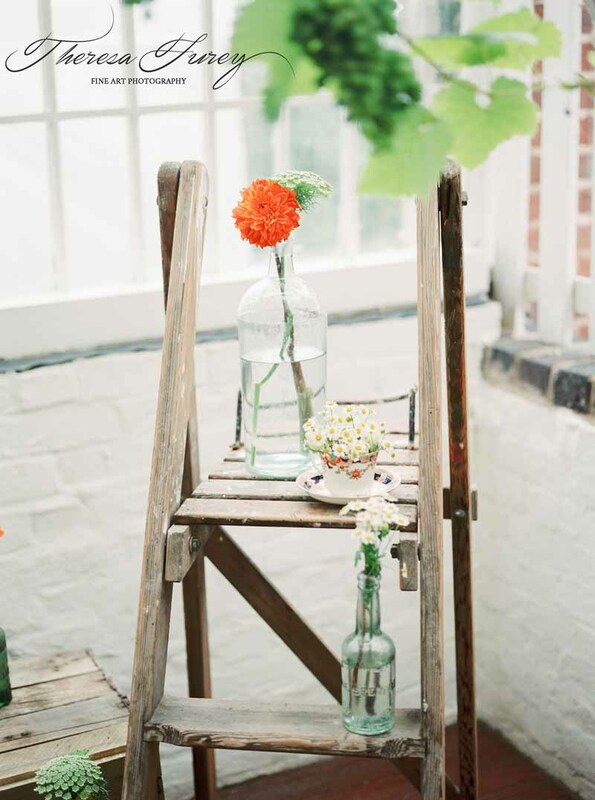 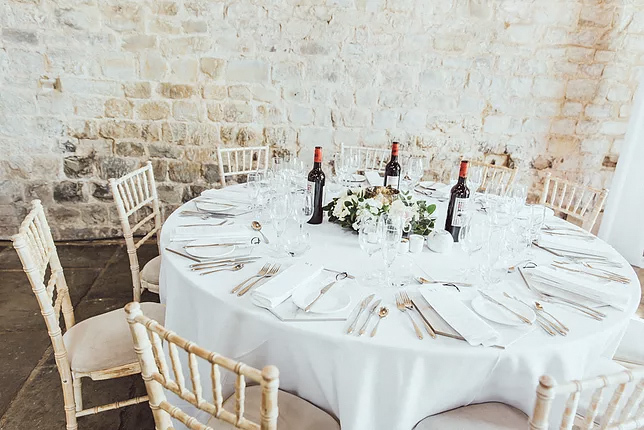 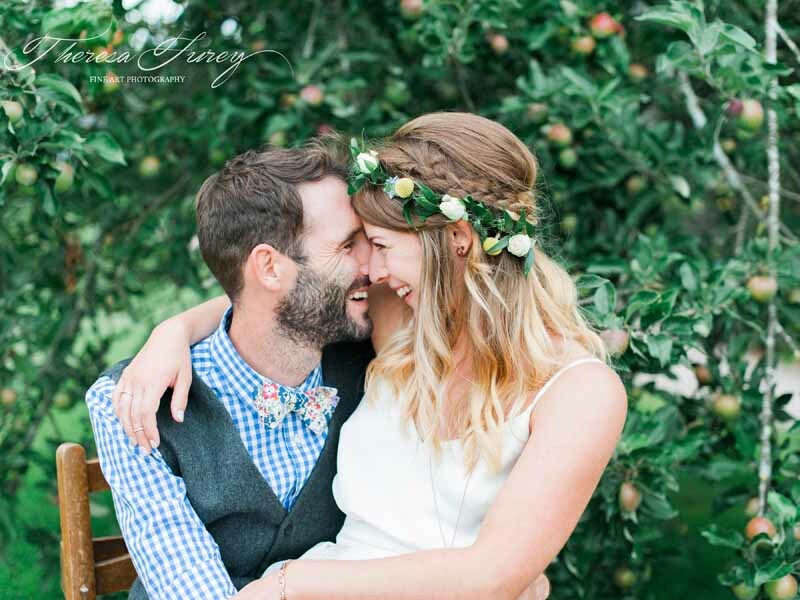 The Vinery was a lovely spot for photos and guests mingling with the grapes hanging above a set of rustic ladders. 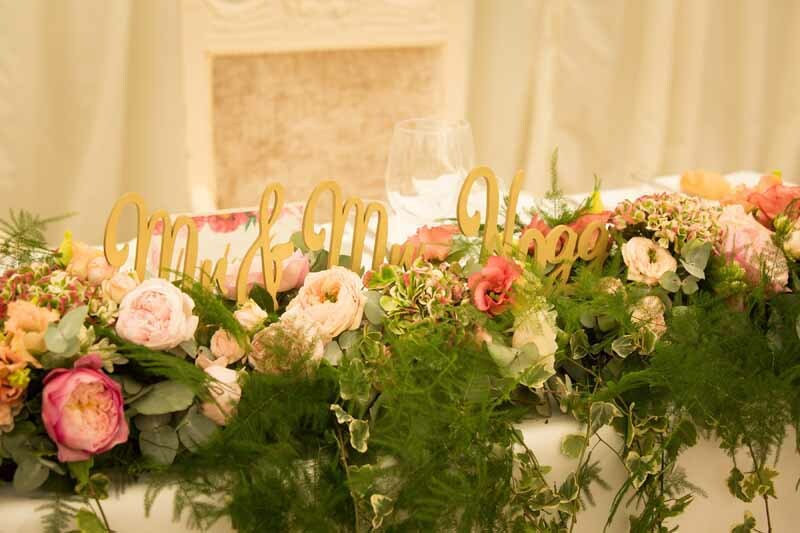 A favourite decoration of the day for our bride. 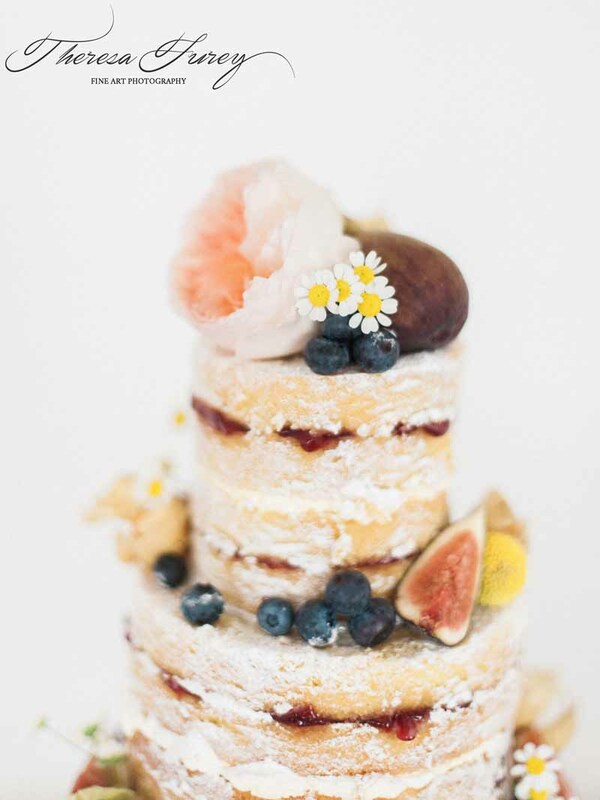 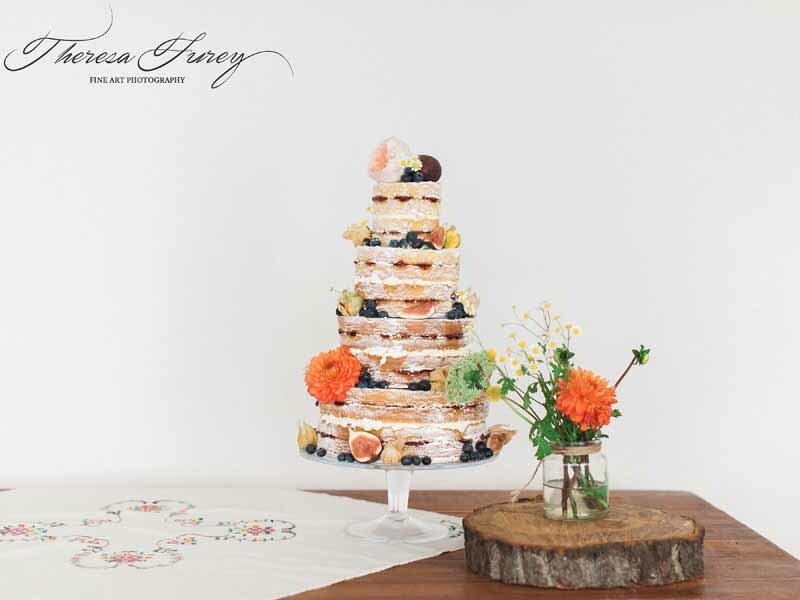 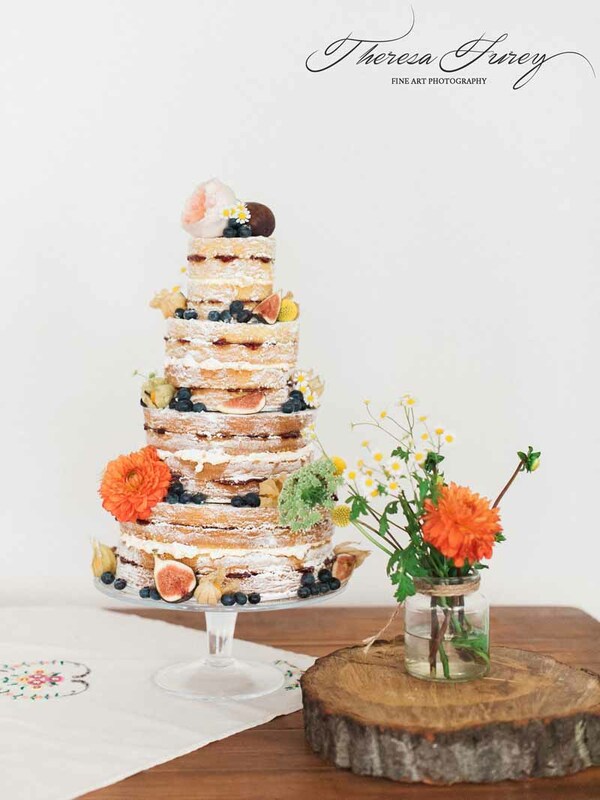 The naked cake was beautifully finished with fresh berries and figs and a sprinkling of pretty blooms. 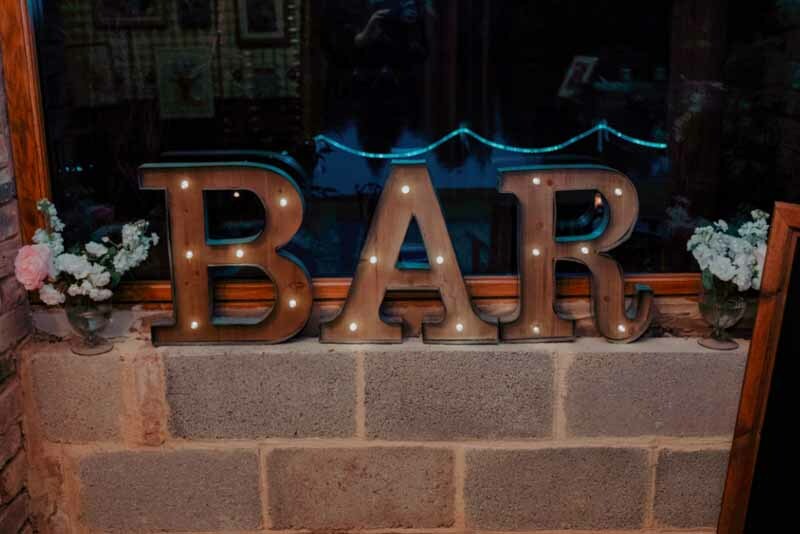 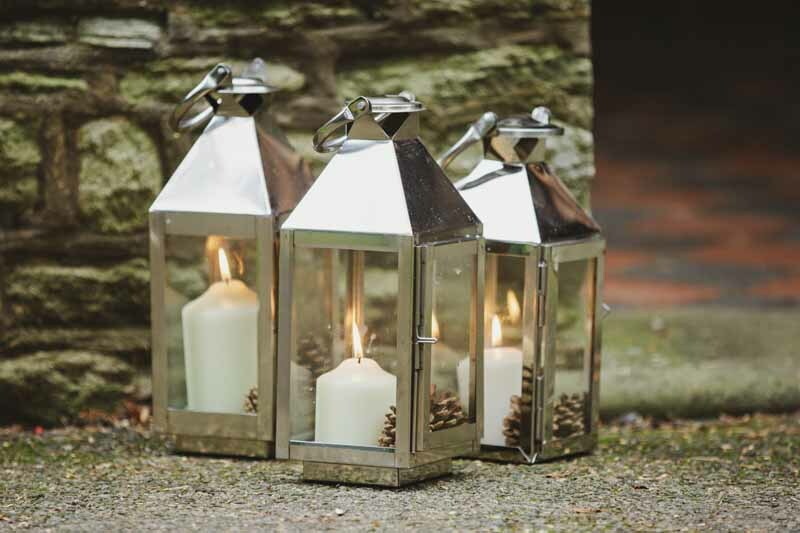 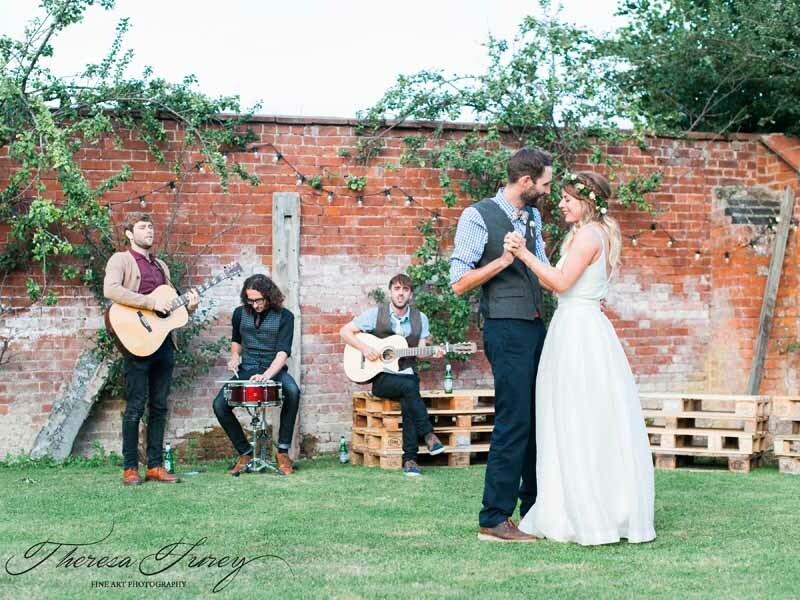 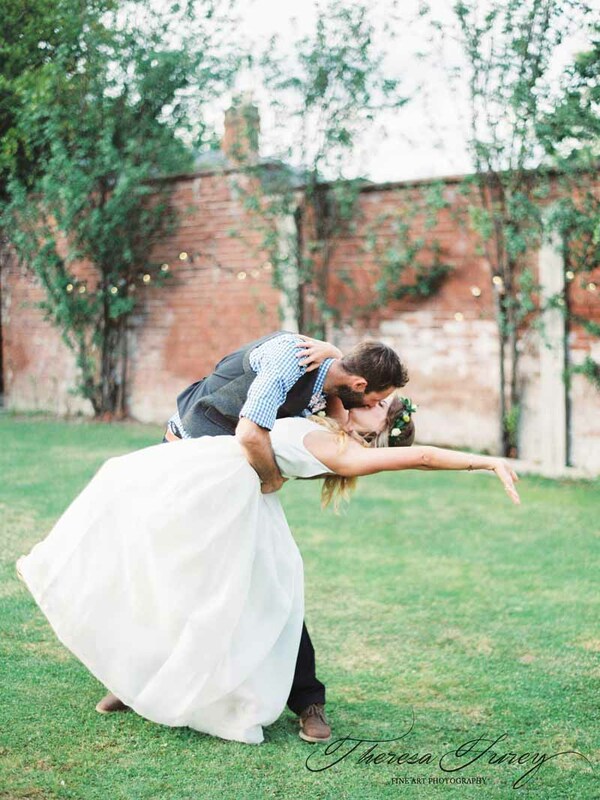 The Walled garden became the perfect place for dancing with festoon lights and pallet seating.